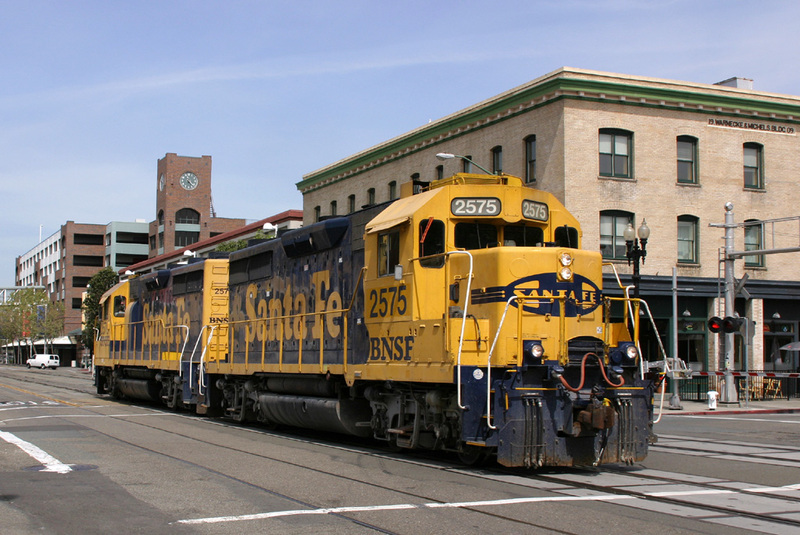 In April 2005, I was lucky enough to be given the opportunity to travel to the USA in order to photograph a completely different type of Railway system. Traveling with good friend Colin Marsden we flew from London Heathrow to Los Angeles International Airport. 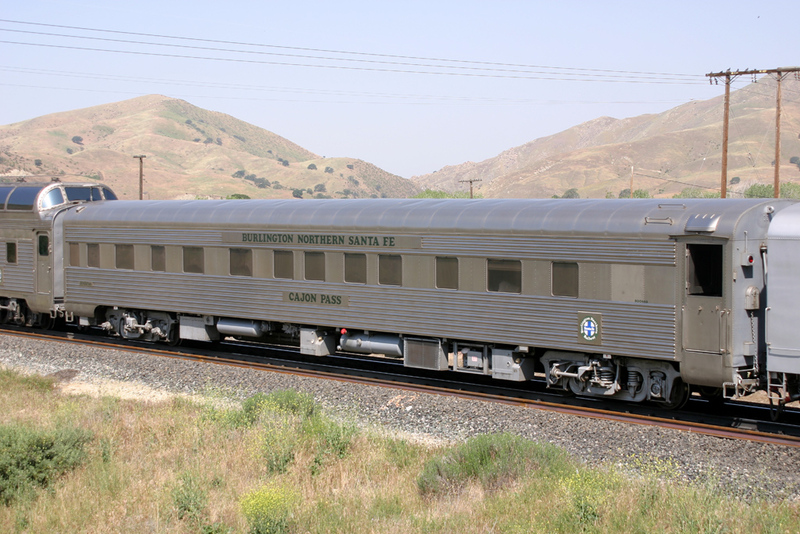 During the trip we visited the Cajon Pass, Tehachapi Mountains, as well as some other sights of Southern California. My personal thanks must also go to Gray Gray, Don Toles, Bruce Jones, Sheryl & Doug, and Robert Beyer, for all their time, energy and information which they supplied to make our stay in the USA a very enjoyable one. 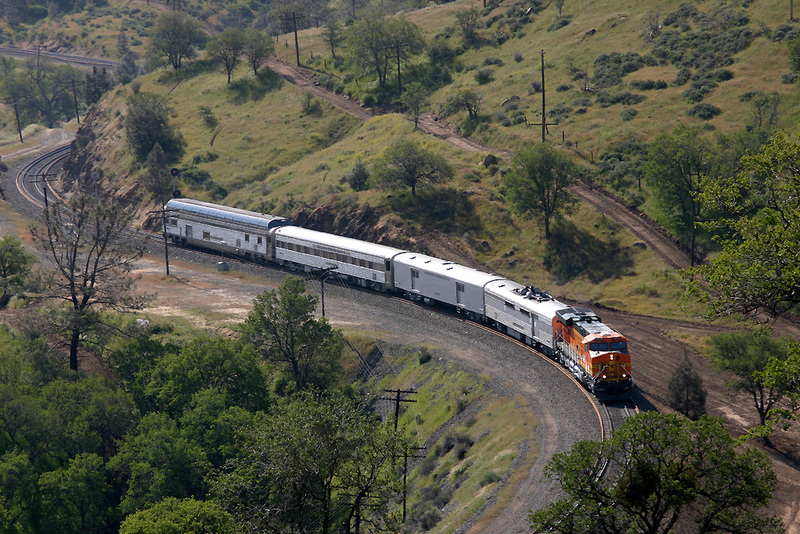 The photo's included in this gallery were taken between April 19th and May 5th 2005, charting our photographic trip in some of the worlds most lovable locations where we spent hours watching and photographing trains hard at work in California on grueling gradients and meandering curves. Watch this one hour long video of the footage taken during the 2005 visit to California. Some of the footage is a little by unsteady as only a small tripod was being used because of the weight/ baggage restrictions which hindered the transportation of a full sized tripod from the UK. Having flown into Los Angeles LAX the previous day, we stayed in the Best Western Motel at Cajon. 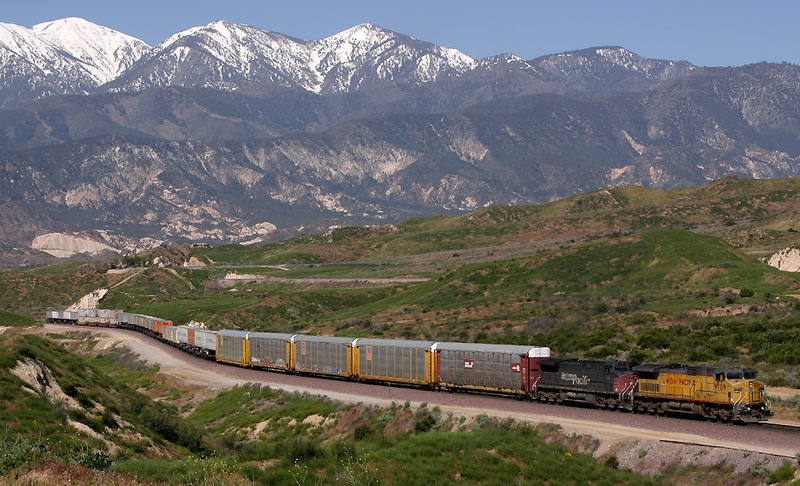 The first day of our trip was spent in the Cajon Pass, watching the huge American freights hauling their trains through spectacular mountain scenes. 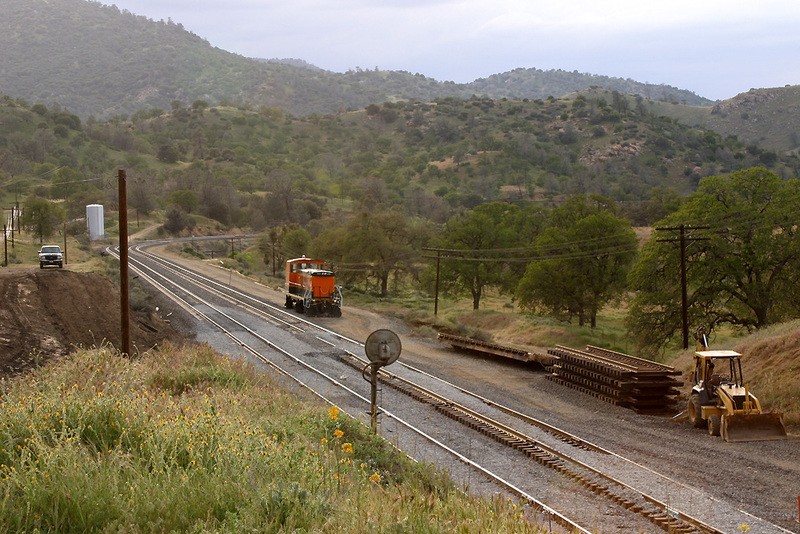 These scenes were taken before the additional track was added through the pass, some of the photographic locations included in this gallery have since changed beyond all recognition. 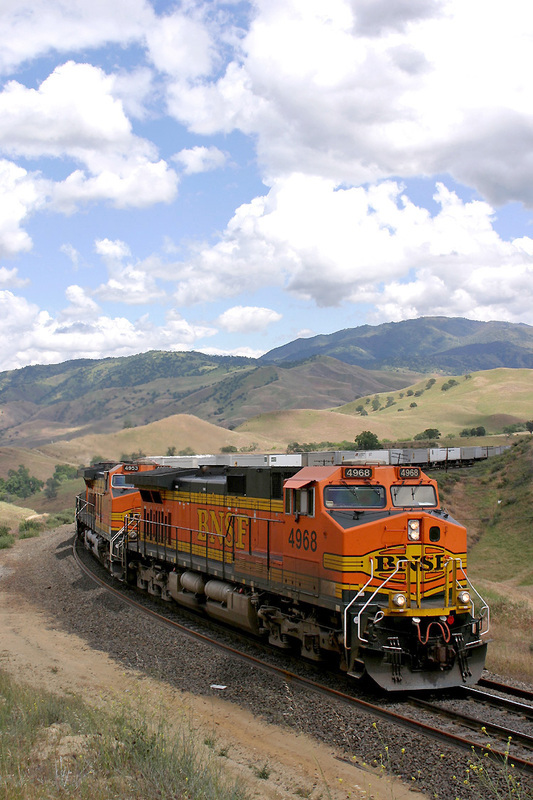 BNSF 1064, BNSF 1019, BNSF 5107 stand just short of Hill 582 'Garden Spot' having been unable to restart their train on the steel climb to Cajon Summit. 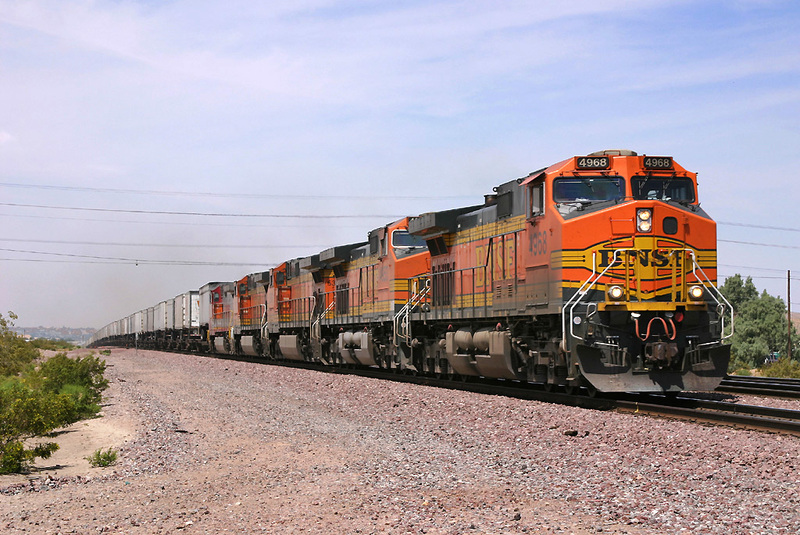 Assistance was finally sent in the shape of two SD40-2's BNSF 6355 + BNSF 6890. 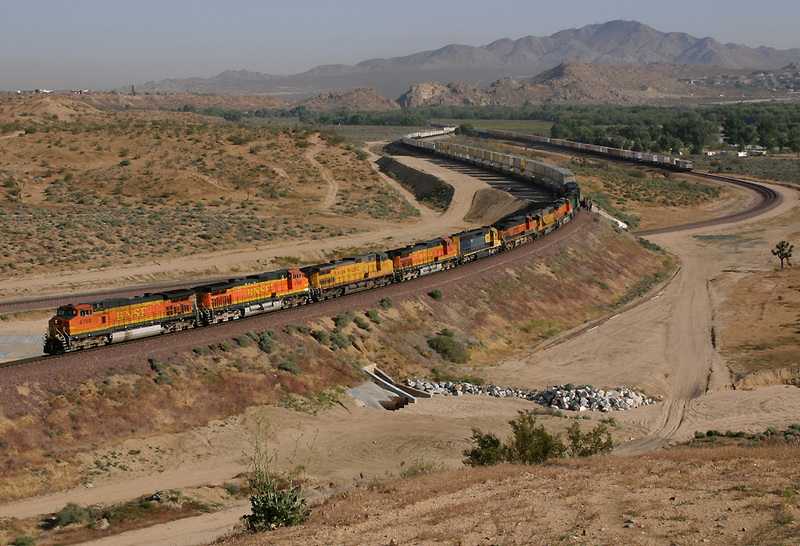 UP 9709 and genuine Southern Pacific SP 174 head up to the summit of the Cajon Pass with an East Bound Autorack train. 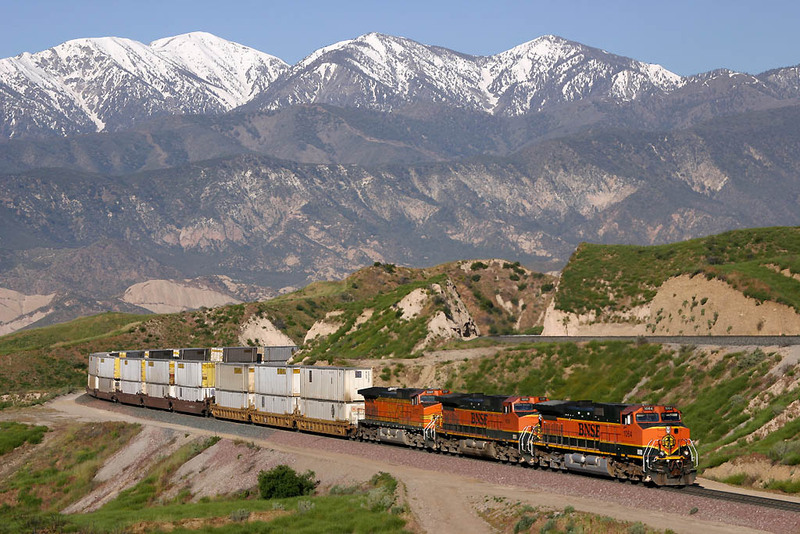 BNSF C44-9W 4873 exits Tunnel 2 on the Cajon Pass leading follow C44-9W's 5088, 4964, and 4611 on an Eastbound Stacker. BNSF helpers SF6355, BNSF 6890 haul the stricken Dash 9's BNSF1064, BNSF1019, BNSF5107 from Hill 582 getting the train underway. 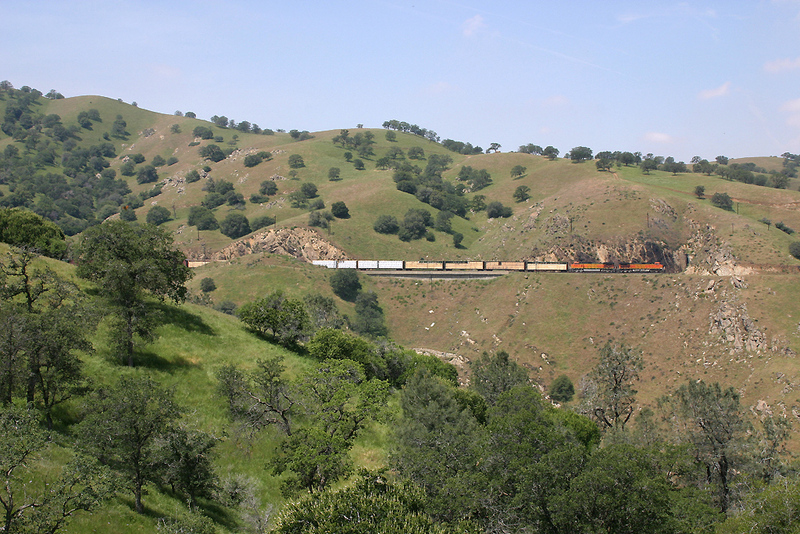 A 10 Locomotive Convoy pass trough the Cajon Pass at Hill 582 formed of BNSF4785, BNSF5228, BNSF1052, BNSF4980, BNSF4889, BNSF5393, BNSF4655, SF6358, & SF830. 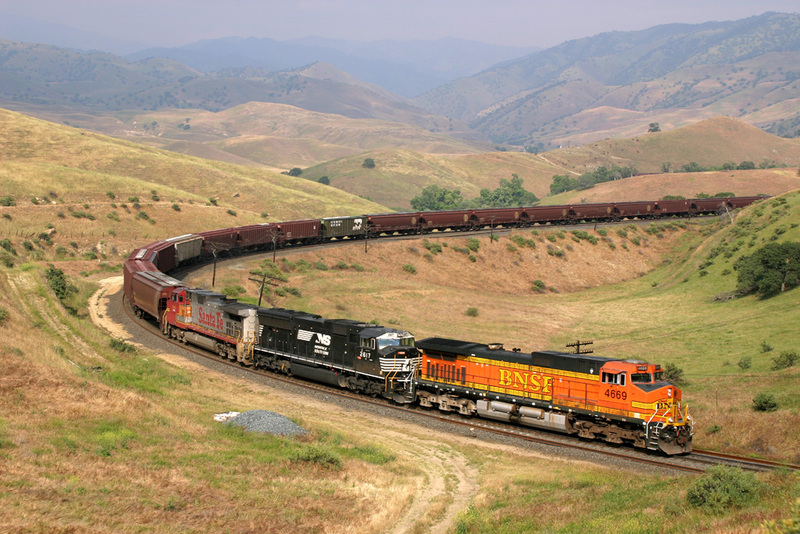 BNSF 4802, NS 9556 round Sullivans Curve working all the way through the pass heading for Summit with an East Bound Stacker. 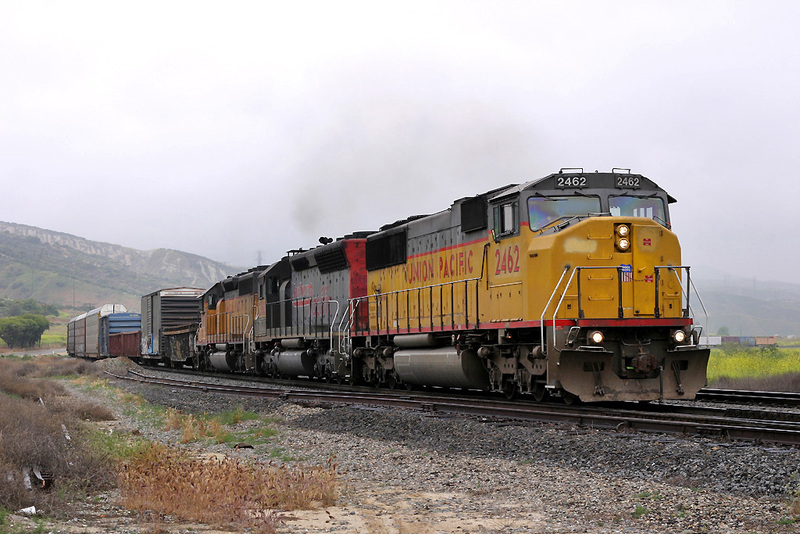 UP2268 and UP 2424 stand at Sullivans Curve on the Cajon Pass working an engineering train. 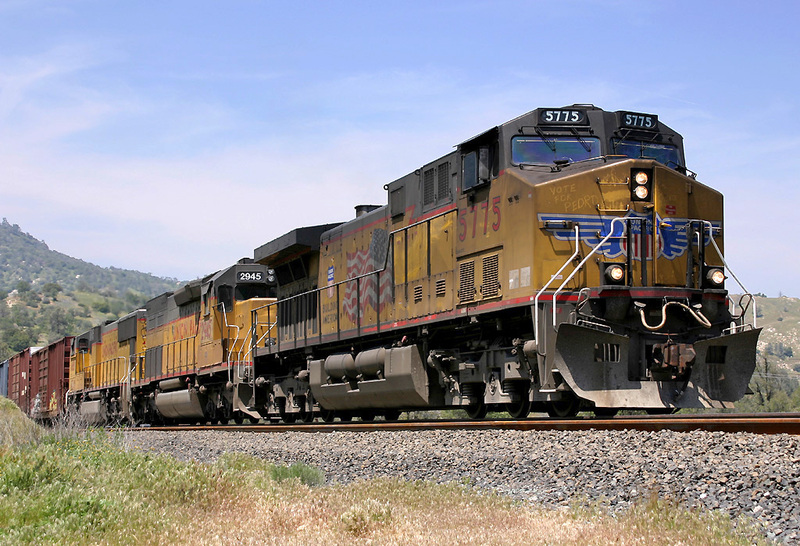 The Two SD60M's are rated at 3800Hp each and therefore are somewhat overpowered for the short engineering train they were hauling. 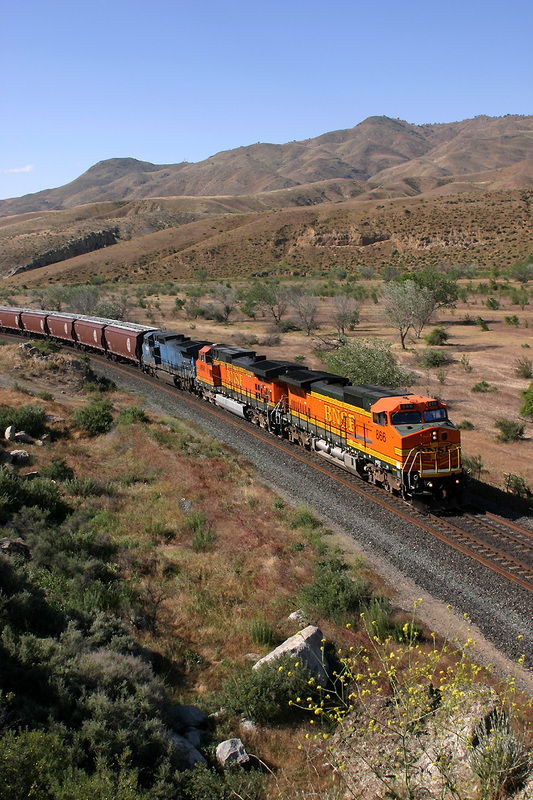 BNSF 5167 leads BNSF 720, BNSF 4577 and BNSF 4887 past Milepost 475 in the Cajon Pass with an East Bound Manifest (Mixed Freight). 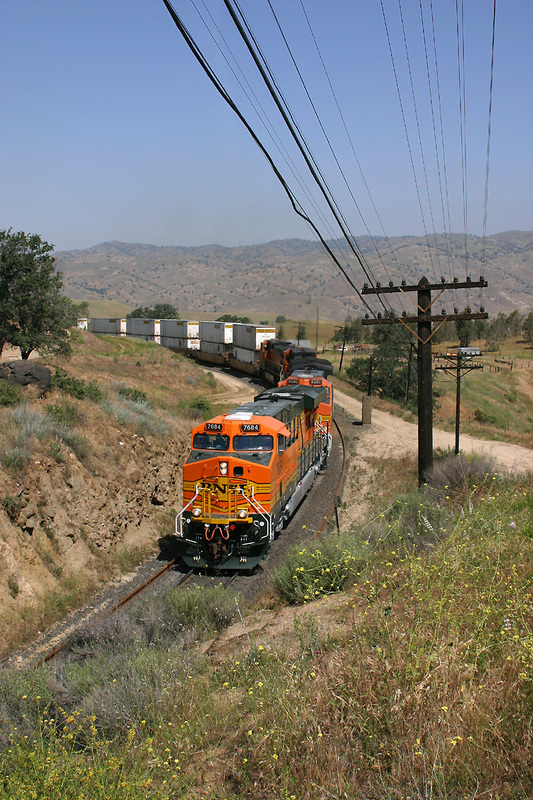 UP 4080, UP 3465, UP4999, UP 9257, UP 4647 take the BNSF-UP connector at Silverwood, to head back onto the dedicated Union Pacific Line through the Cajon Pass. 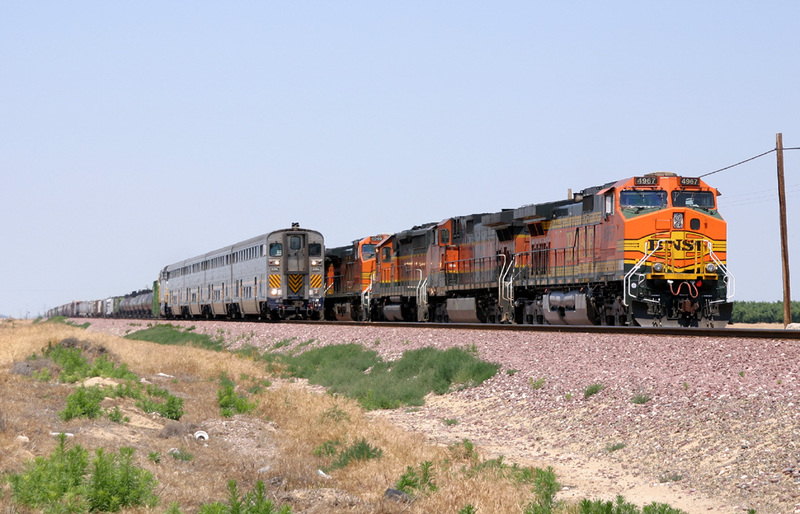 BNSF 5167, BNSF 720, BNSF 4577, BNSF 4887 sit on the connector at Cajon Summit while BNSF 4617, BNSF 5274, NS 9578, BNSF 4947 pass by on their train heading east. Having stayed the night in Cajon, we moved further east following the line from the Cajon Pass towards Barstow. 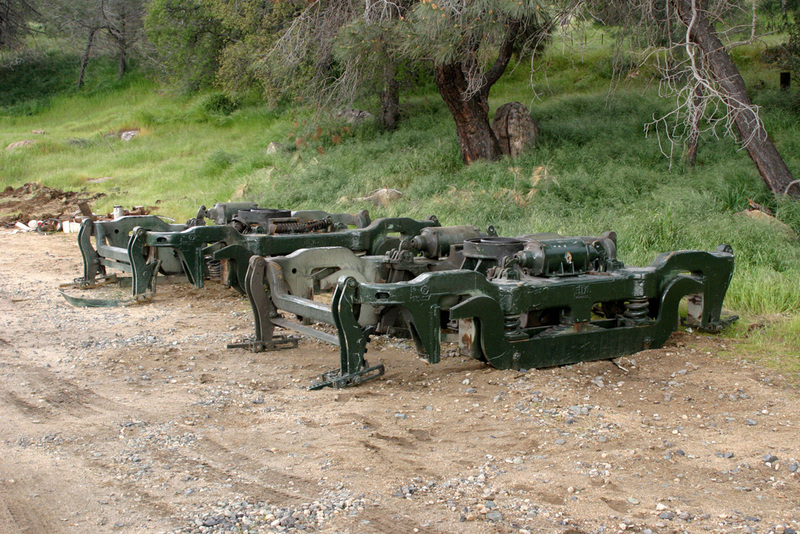 We spent the day in the vicinity of Victorville, Frost, Kempa Cambell Ranch before driving to Tehachapi. This was the record for the trip. 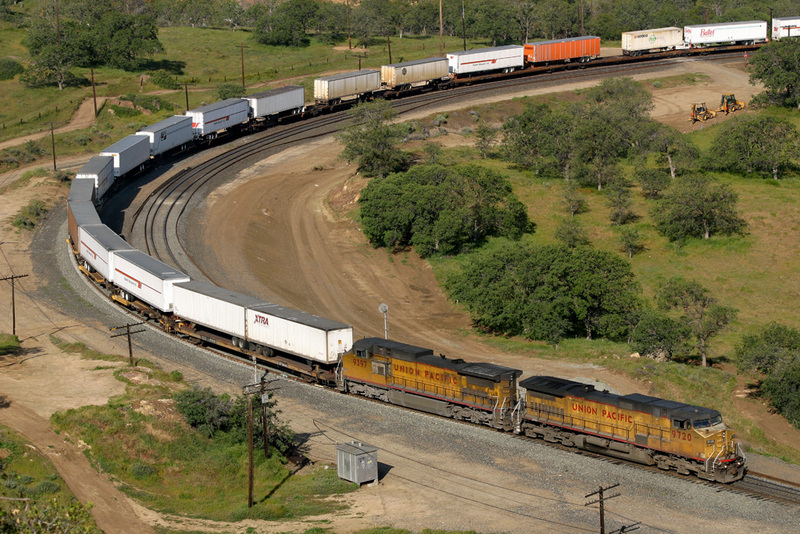 11 locomotives on one train! Although not all working, it's a sight to behold, so much so that there are not many places you can fit a train of this size in! 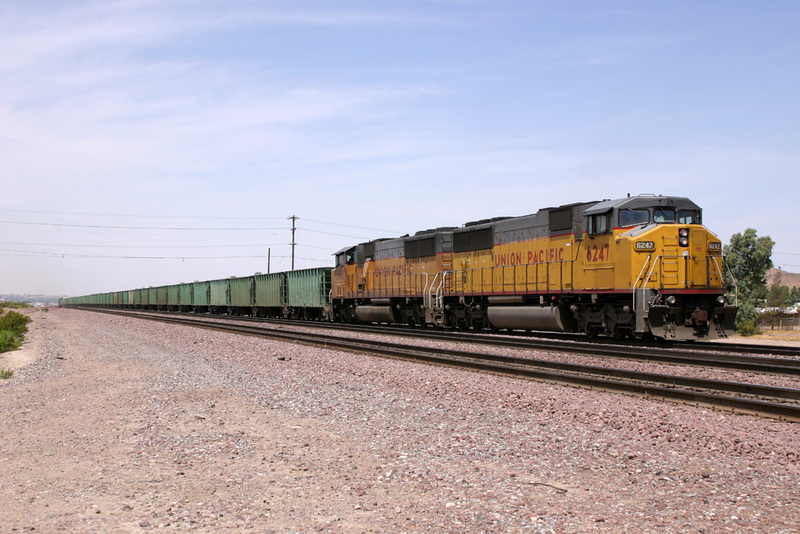 Locomotives pictured passing Frost are as follows: BNSF 4788, BNSF 4768, BNSF 9763, BNSF 4394, N REX 6490, BNSF 1022, NREX 5070, BNSF 4858, BNSF 9241 BNSF 9269, BNSF 7006. 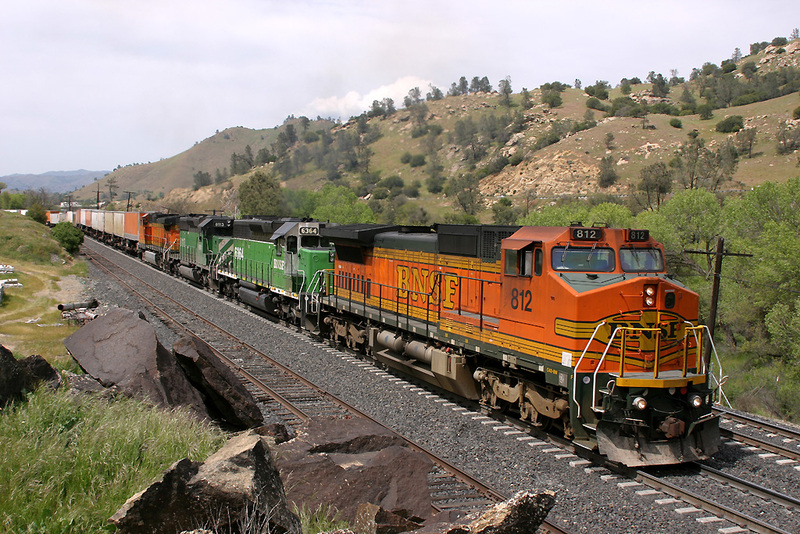 BNSF4746 leads BNSF8619, BN9254, NS8808, & NREX5088 through Frost heading east. 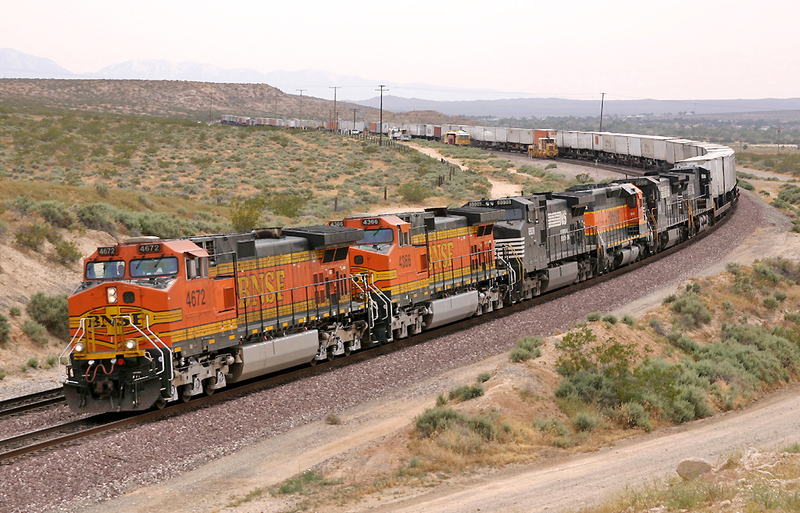 Taken at Frost (near Victorville) BNSF 764 leads two locos from CSX 9008+658 along with a UP loco 7354 over the sweeping curve, while working a west bound stack train. 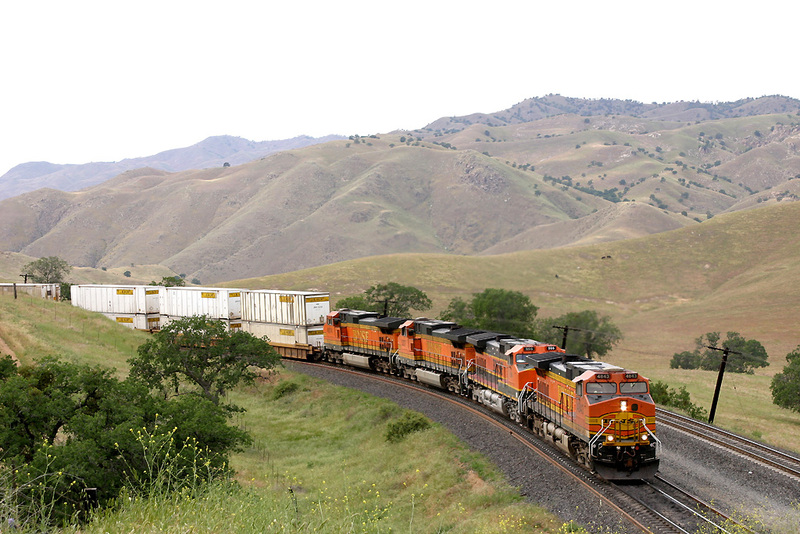 BNSF 4704, BNSF 5811, BNSF 5003, BNSF 7687 haul their east bound stack train through Kempa Campbell Ranch. 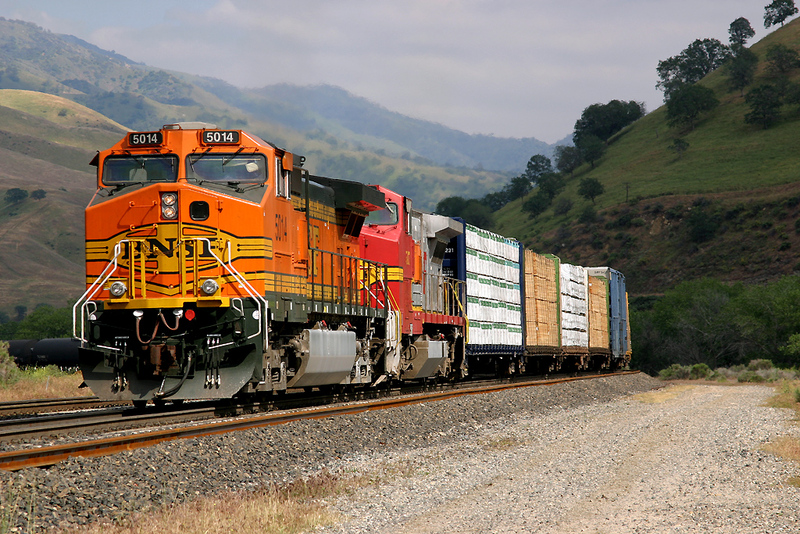 BNSF 5349, BNSF 620, BNSF 885 power a west bound stack train through Kempa Campbell Ranch on the approach to Frost. 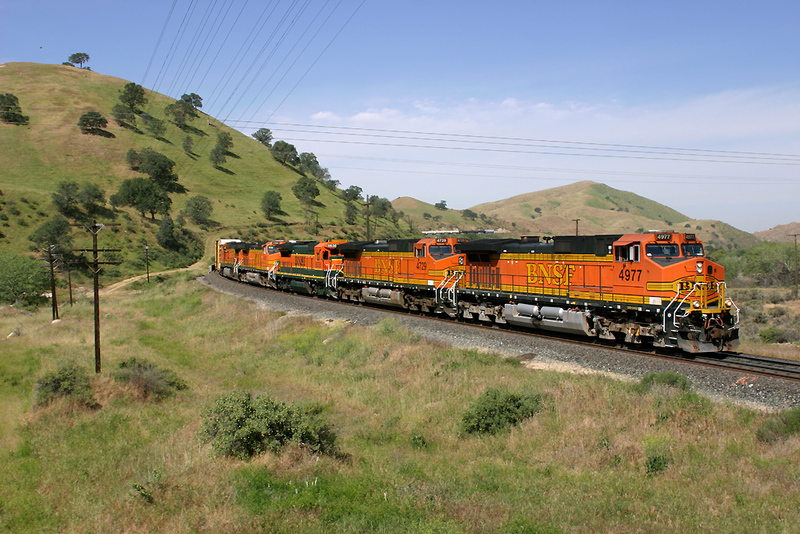 SF 2448, BNSF 2813, BNSF 2163 are seen on a local trip working passing Kempa Campell Ranch. 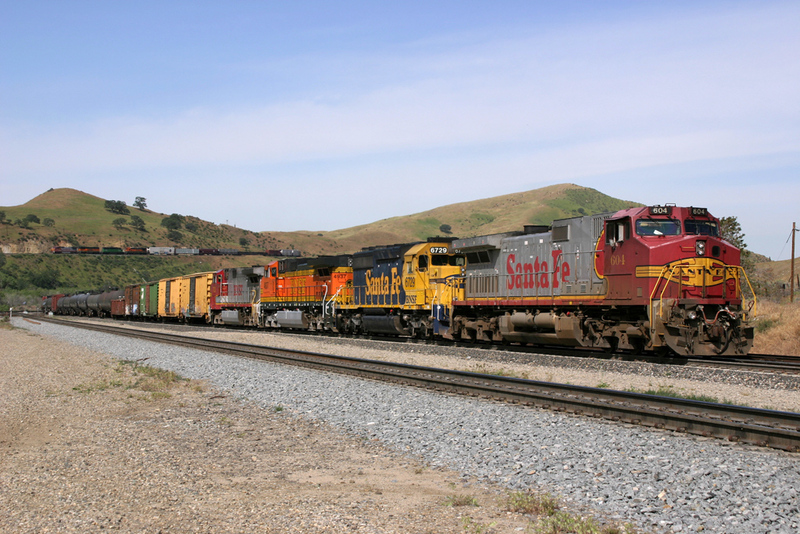 'Warbonnet' SF900 leads BNSF963, BNSF616, BNSF798 west through Kempa Cambell Ranch near Frost heading for Los Angeles. Having paused at Frost for some time UP 4743, UP 4198, UP 5407 are pictured and passing Bryman Road at speed. 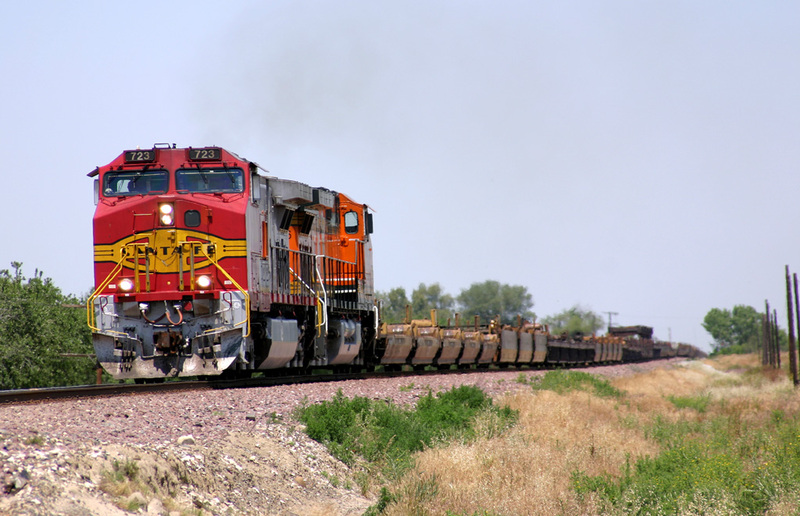 BNSF 7681, CON 8440, BN 4437 hurtle past Bryman Road with a west bound stack train heading for Los Angeles. The 22nd April was our first day on the Tehachapi Mountain Range, our images over this period range between Mojave and Bakersfield. 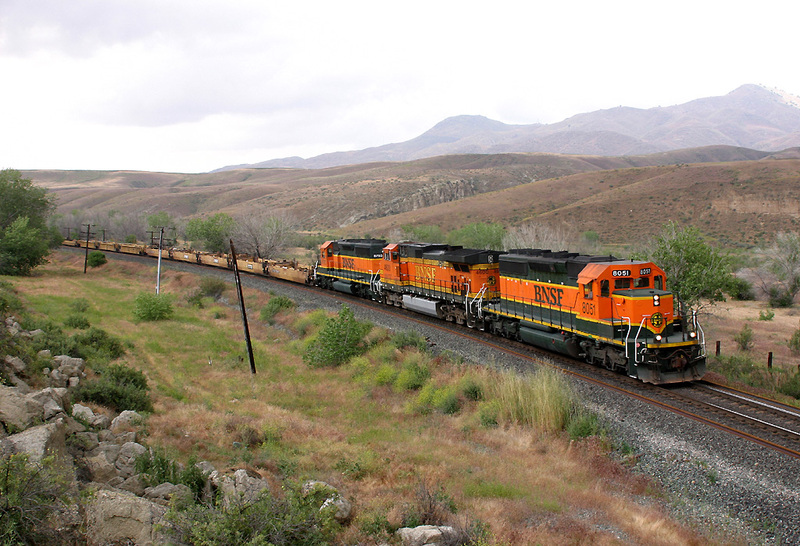 BNSF 1073, WN CTL 7352, SF 8713, N REX 5062, BNSF 8623 descend the final gradient of the Tehachapi Pass at Caliente. The sight of a Wisconsin Loco within the consist was also another rare event! 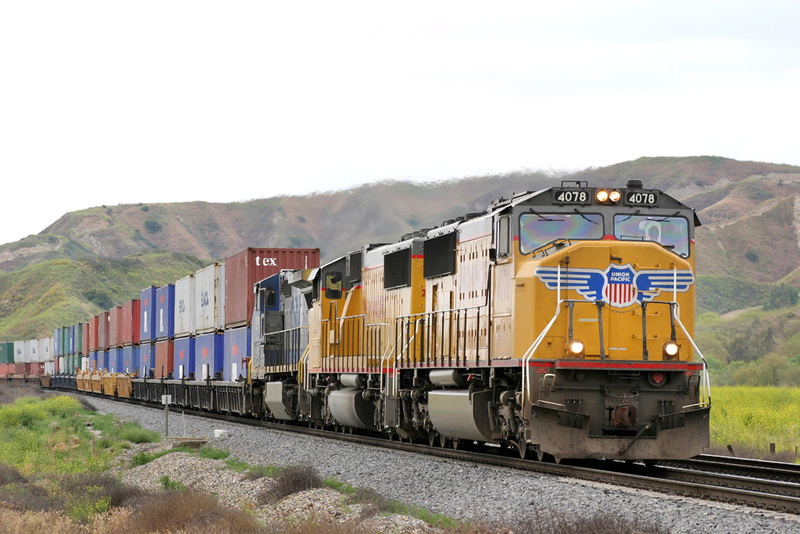 UP4166, UP9539 return a bare table train to the port of Los Angeles for loading, seen passing Caliente. 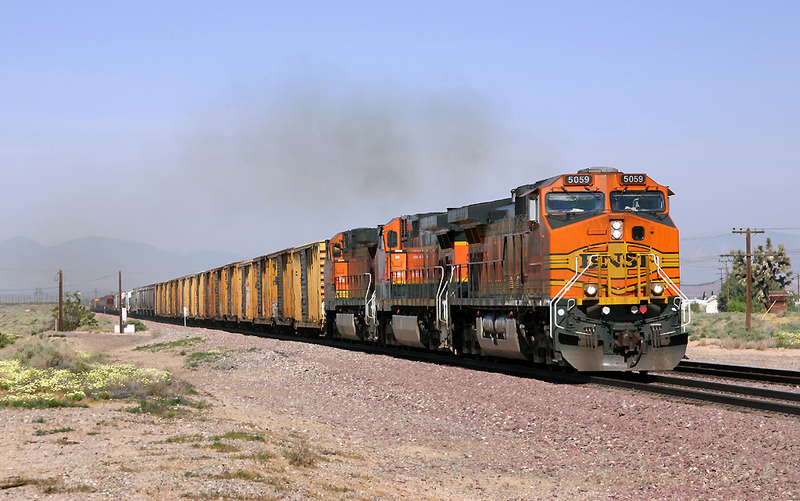 BNSF1106, leads UP[CNW]6722, BNSF7685, BNSF1033 through Sandcut with an east bound manifest. 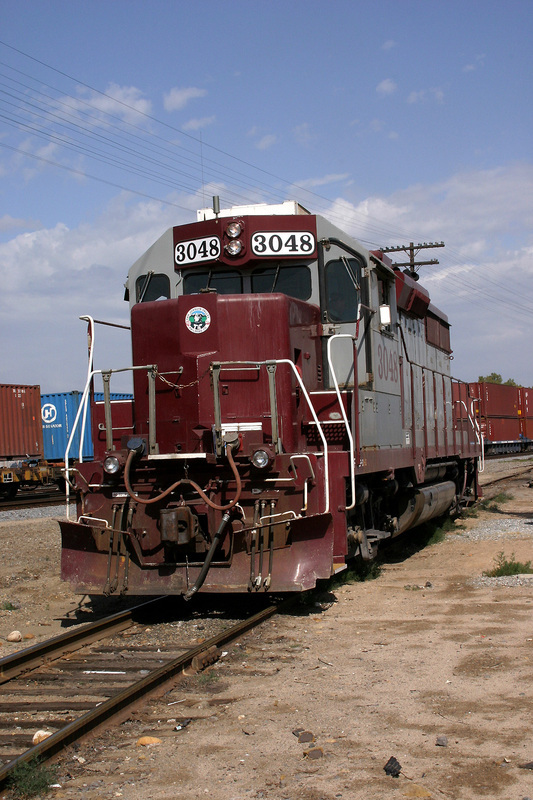 SJVR 3048 GP38-3 is pictured between duties at Bakersfield. 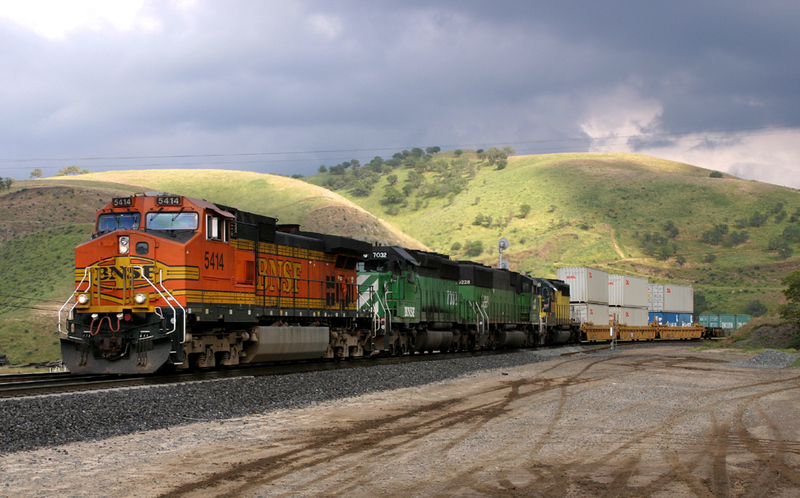 BNSF 4943, BNSF 999, BNSF 4803 head into Bakersfield having just exited some very stormy skies over the Tehachapi Mountains behind them. 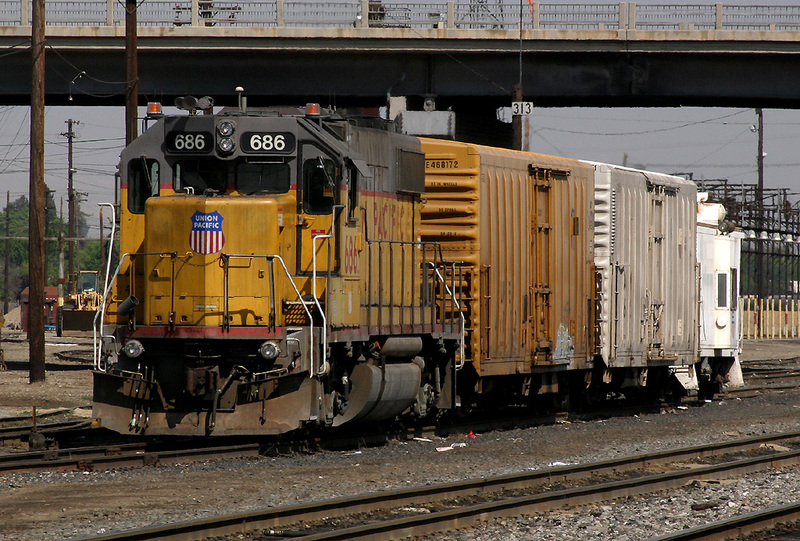 UPY 686 is a GP15-1 EMD-GM locomotive, and is seen parked at Bakersfield. 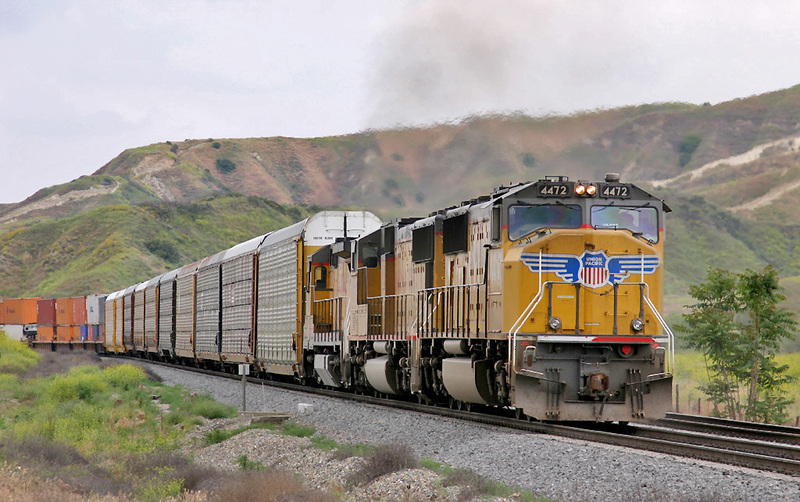 The added attraction of this locomotive is that it's fitted with remote control, and can be driven from outside the cab for remote switching and local trip workings. Rated at 1500Hp it's seen between duties with it's Kaboose! 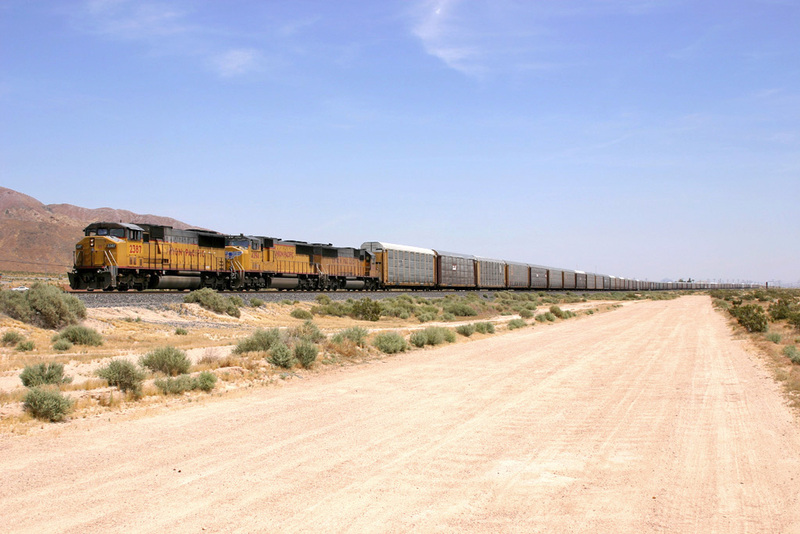 BNSF 866, BNSF 4562, CONRAIL/NORFOLK SOUTHERN 8456 pull away from Sandcut after an extended stop in the middle of nowhere. The Flames from the roof of the 'quality' ConRail unit were also noticed by the engineer on board who had been keeping an eye on the flame-throwing loco. 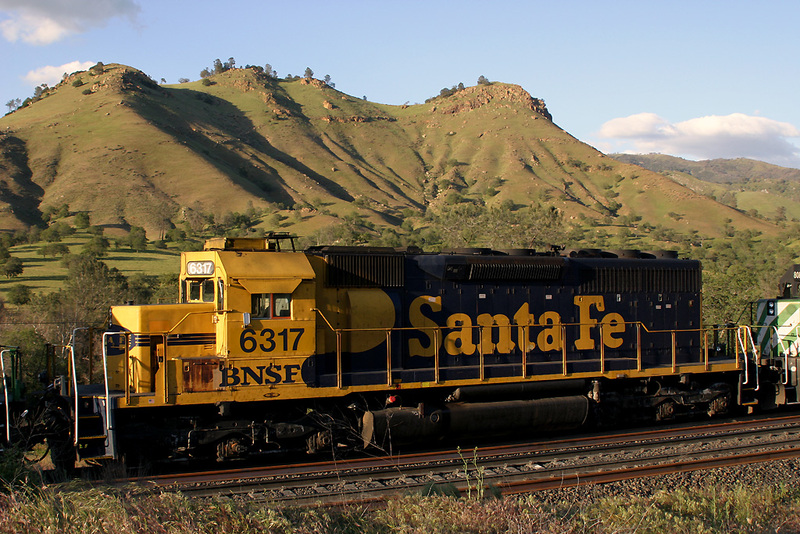 SF6317 is pictured at milepost 347 adjacent to Three Peaks Ranch near Woodford. 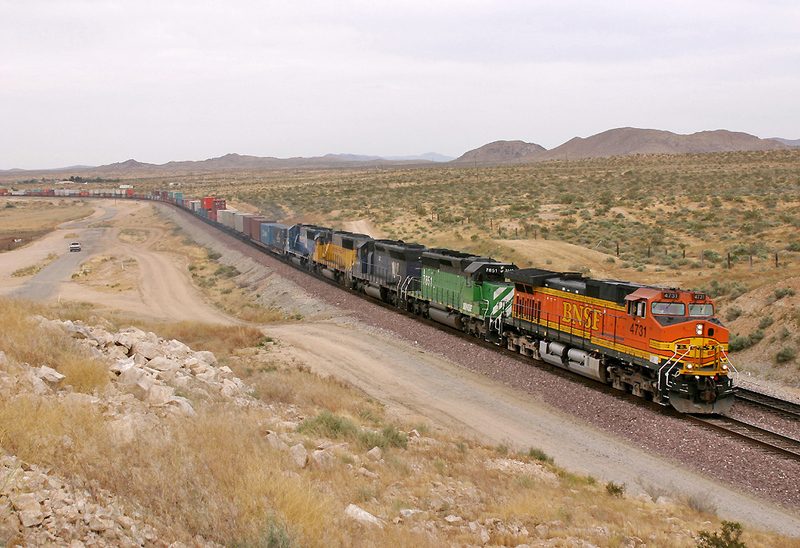 BNSF 866, BNSF 4562, CON/NS 8456 pass Illman Caliente Creeke with empty grain train. 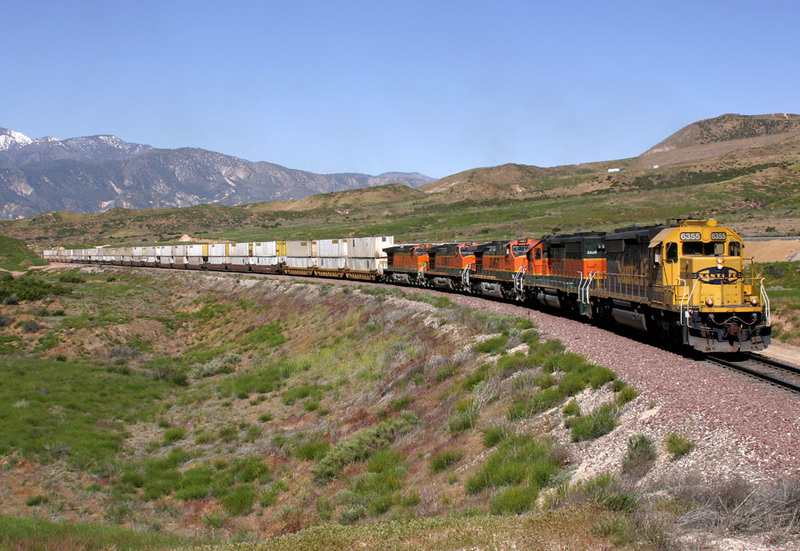 The loaded train in the other direction loads to 40000 tonnes and is the heaviest train to pass over the Mountains! 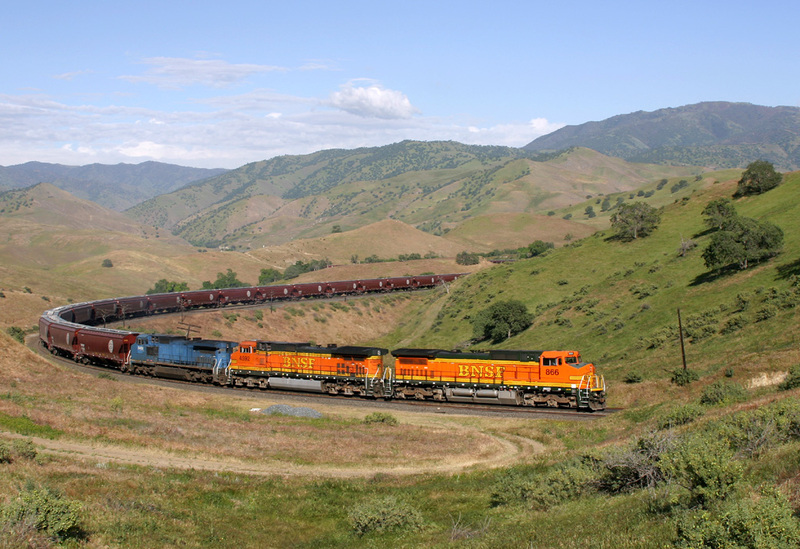 BNSF 866, BNSF 4562, CON/NS 8456 head up the 3% grade to Tunnel 2 deep inside the Tehachapi Mountain range. 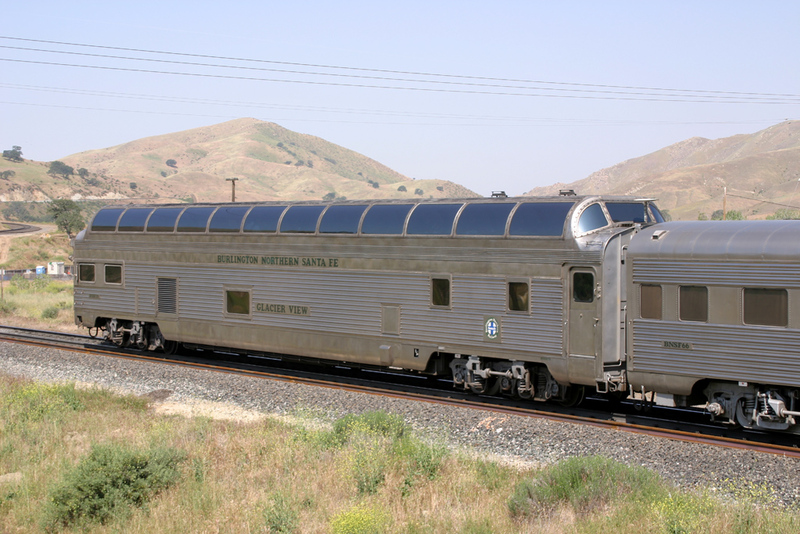 The 23rd April was our second day on the Tehachapi Route, and our time was spent between Mojave in the south through to Bakersfield in the north traversing the Tehcahapi Mountain Range in-between. 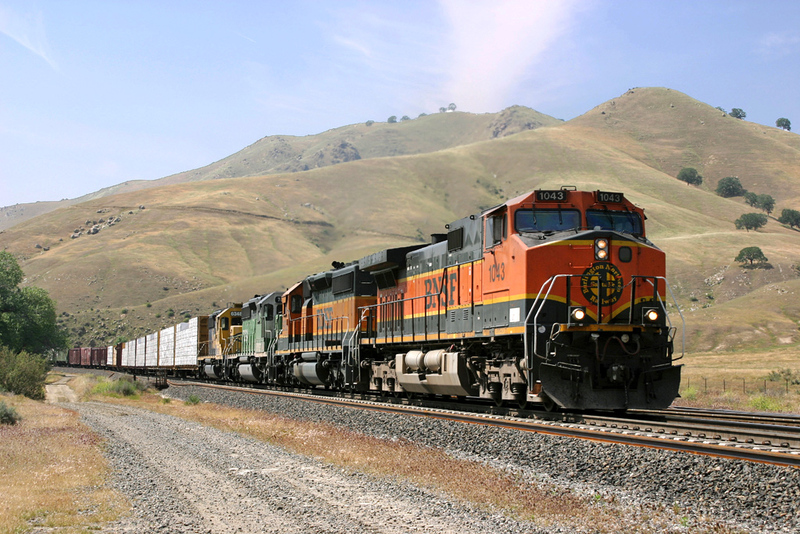 BNSF5468, BNSF4185, BNSF719 head west at Monolith with the wine train. BNSF 760, BNSF 561, BNSF 7242, NS 6119, BNSF 7249 head through Woodford on a south bound stack train passing UP 2362, UP 2345 parked on a ballast train which had been working on the derailment site overnight. 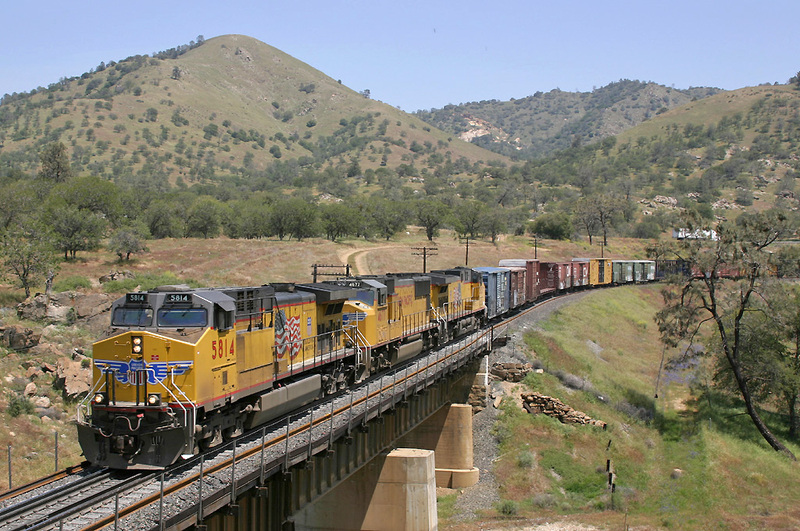 SF760, SF561, BN7242, NS6119, BN7249 exit from Tunnel 10 with their southbound manifest in tow. 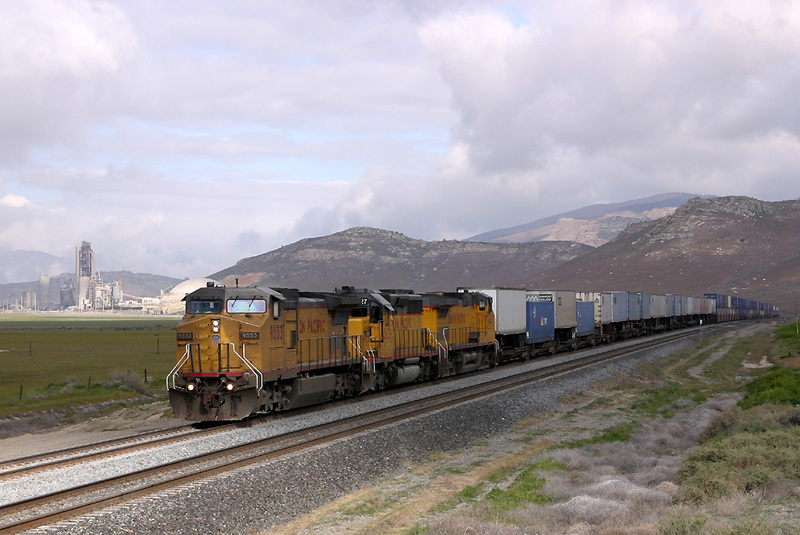 UP5757, NS8397, UP5794, UP4422 round Tehcahapi Loop with a southbound manifest. 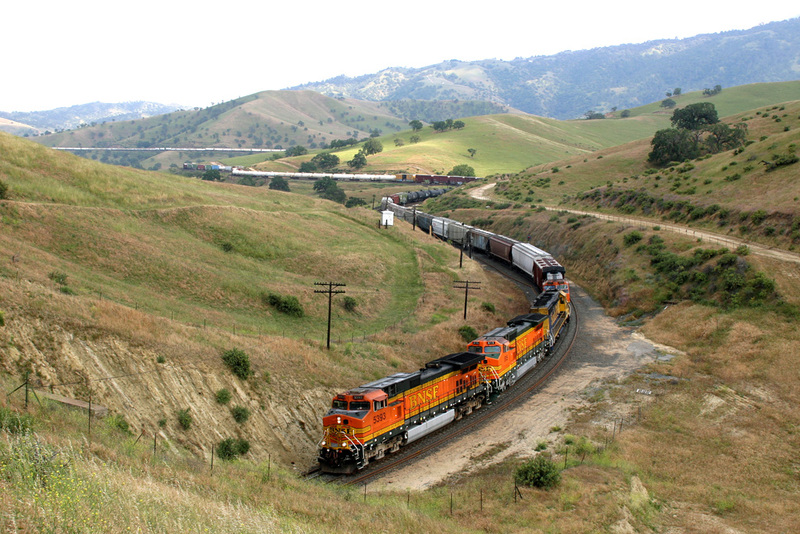 BNSF 4977, BNSF 4729, BNSF 8638, BNSF 4160, BNSF 4555 descend the hill at Caliente having worked over the Tehachapi Mountains. 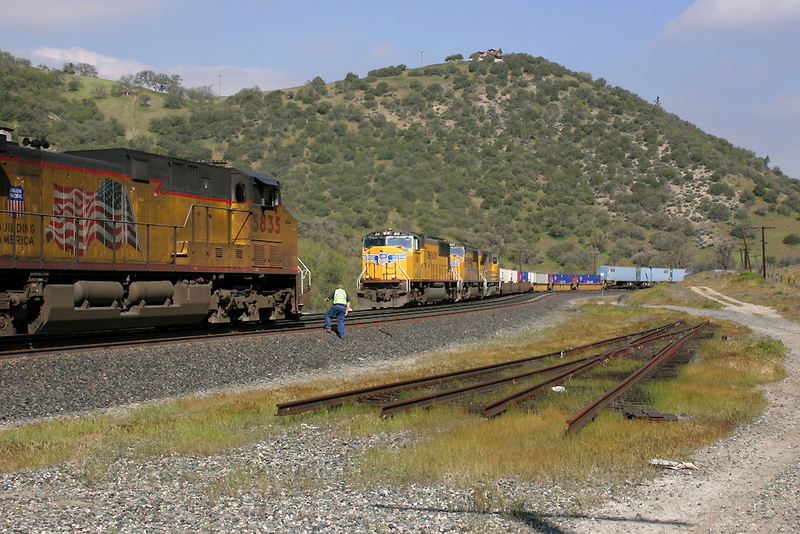 SF 604, SF 6729, BNSF 4937, SF 703 sit at Caliente while another loaded train works it's way down the hill to pass them. BNSF 812 leads BNSF 6364, BNSF 8113, BNSF 4035 through Sandcut on a south bound intermodel service. Two Canadian SD40's pass Sandcut. 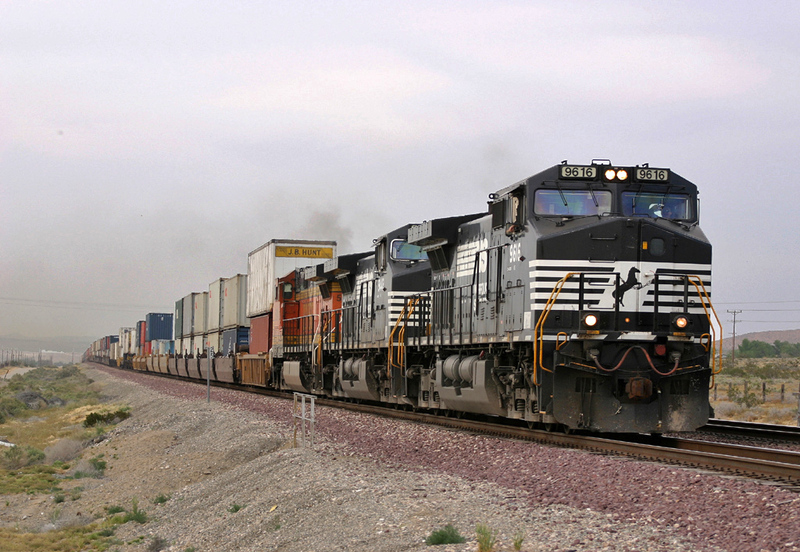 The pair of locos were working a special explosives train from Chicago Cicero Yard and were working through to Port Chicago. A rare photo indeed!! SF 664, NS 9264, BNSF 5342 slow on the curve at Sandcut ready to briefly pause for a crew change after meeting with one of the local 'Dog Catch Teams' to switch crews. 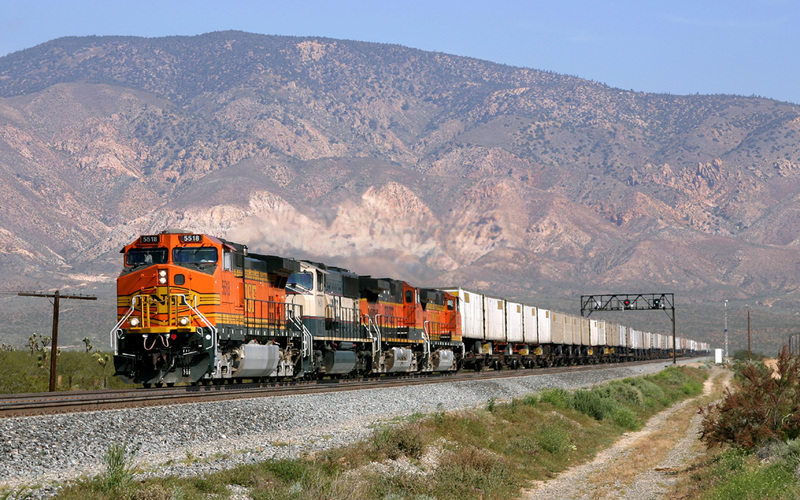 BNSF 5131 leads NS 9020 and NS 9388 through Sandcut heading towards Bakersfield with a north bound stack train. CFEX 7119, UP 5024 propel their rail train back to Rowen siding, from Woodford prior to running around their train and pushing back to Woodford. A practice which would almost certainly be banned in the UK! 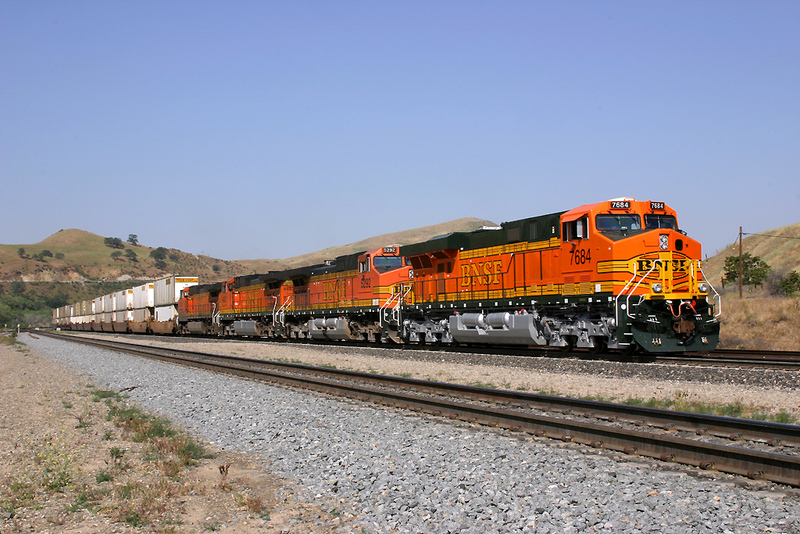 With the removal of the Rail Train from the siding at Woodford it opened up a shot not previously possible, BNSF 812, BNSF 6364, BNSF 8113, BNSF 4035 pass Woodford heading south with their stack train. 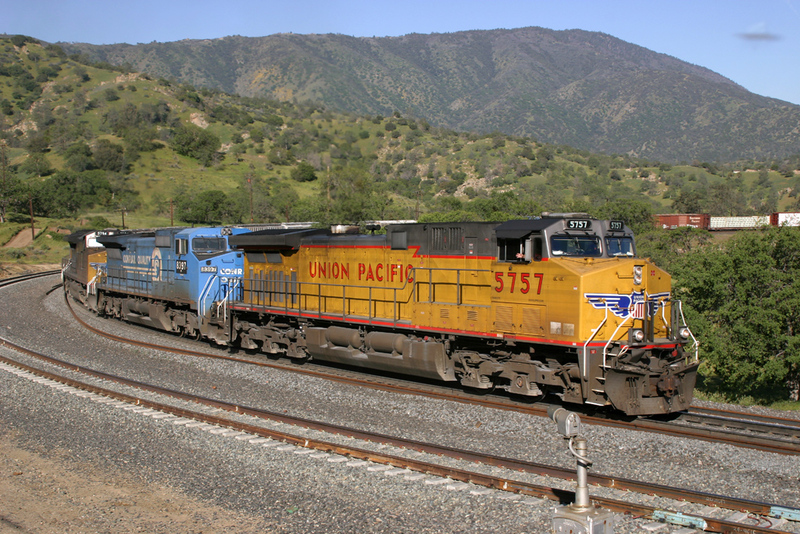 UP 4349, UP 9692, UP 5831 pass Bealville with a north bound manifest. 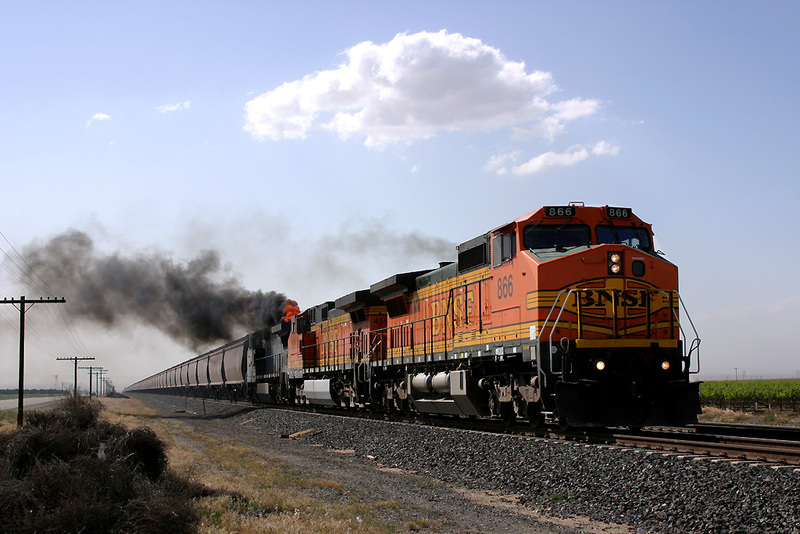 BNSF4843 leads BNSF966, BNSF5237, BNSF4574 on a south bound stack train through Bealville. On the way back to the hotel we called into Woodford, which had been the sight of a derailment prior to our arrival. The area had previously been inaccessible due to the clear up operation. 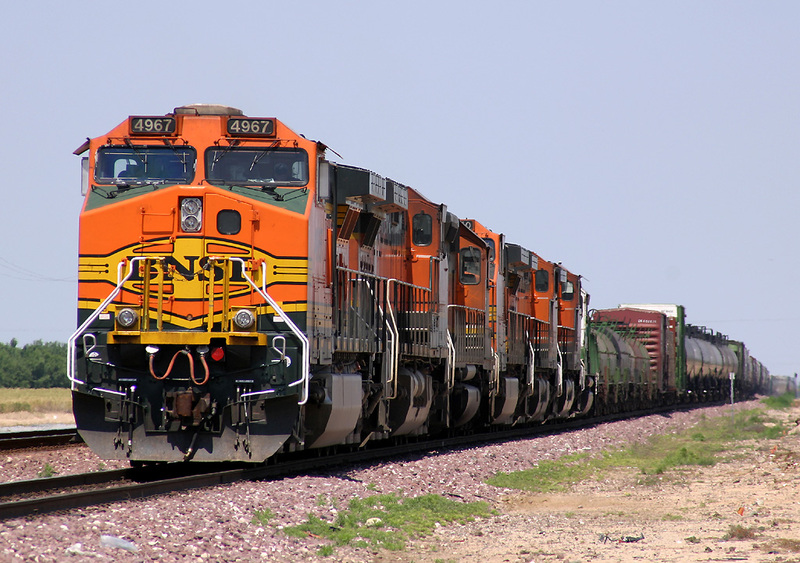 The derailment happened at a time when BNSF were so short of power, they started to convert yard switchers (shunting locos) to provide additional power in the train. 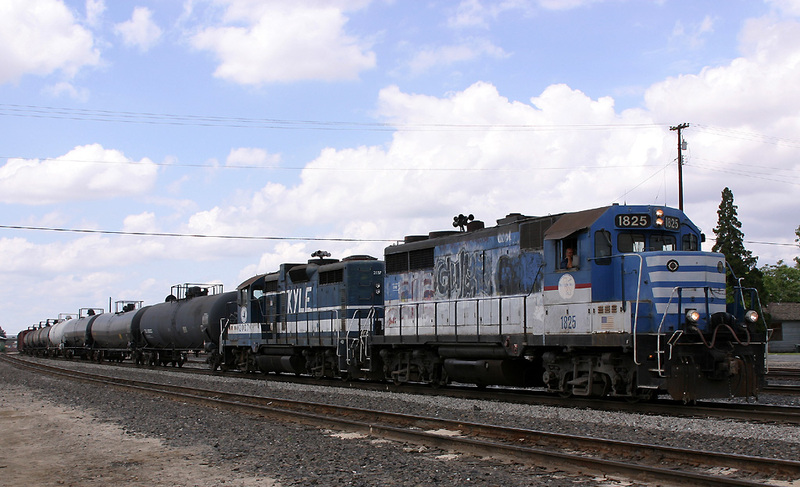 No.3403 was in the consist of a northbound train when it had a bearing failure and derailed. thankfully the locomotive somehow managed to stay on the track over the Woodford Tressel bridge, otherwise the derailment would have been far worse. 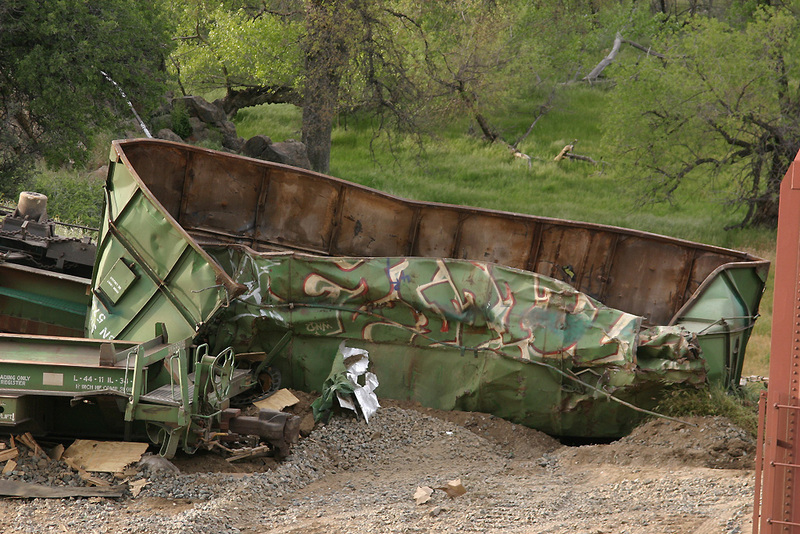 The remnants of the incident can be seen above. 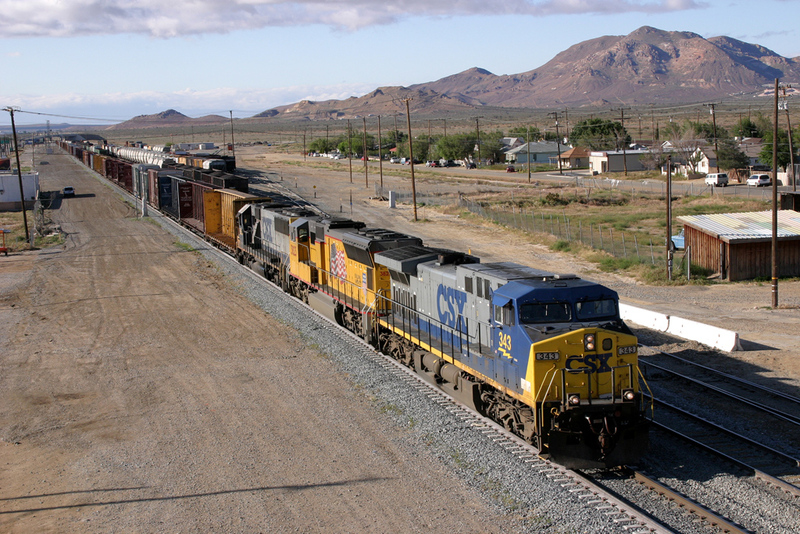 CSX 343, UP 3825, CSX 8566 are seen at Mojave & Sandcut with a northbound manifest. 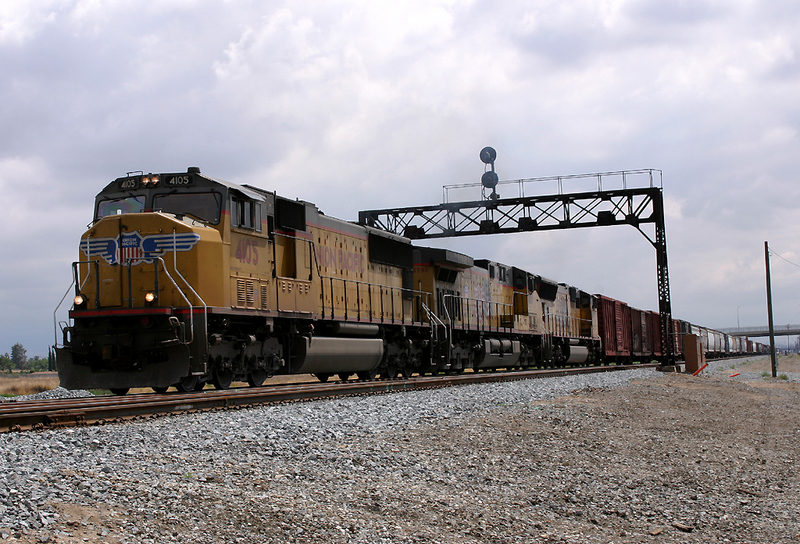 The service was a very important as the loco leading was an AC unit on hire from CSX. (Who at the time were desperate for these locos on their own operating patch!) 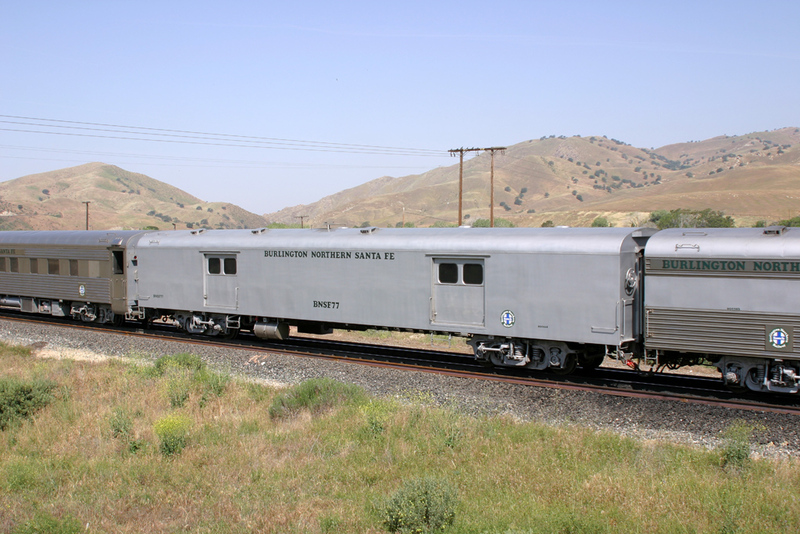 343 is instantly up ratable to 6000HP, and for an AC loco such as this from another company to lead of the Tehachapi mountains was very rare. UP 4699 offered it's assistance from Caliente when BNSF 4942, BNSF 5484 announced that they were unable to get their 'Z' train moving at Rowen. 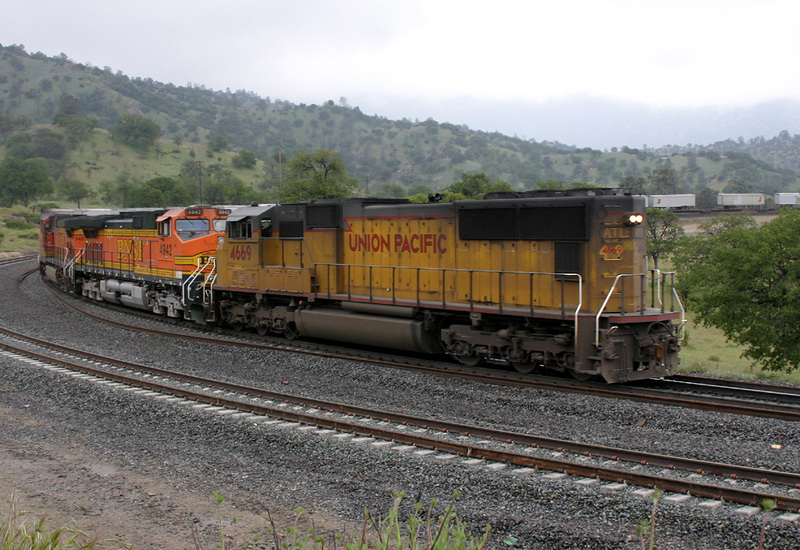 The UP loco worked over the mountain, attached to the front of the BNSF train and helped the BNSF service. Running 'SLAB END' first to Tehachapi! 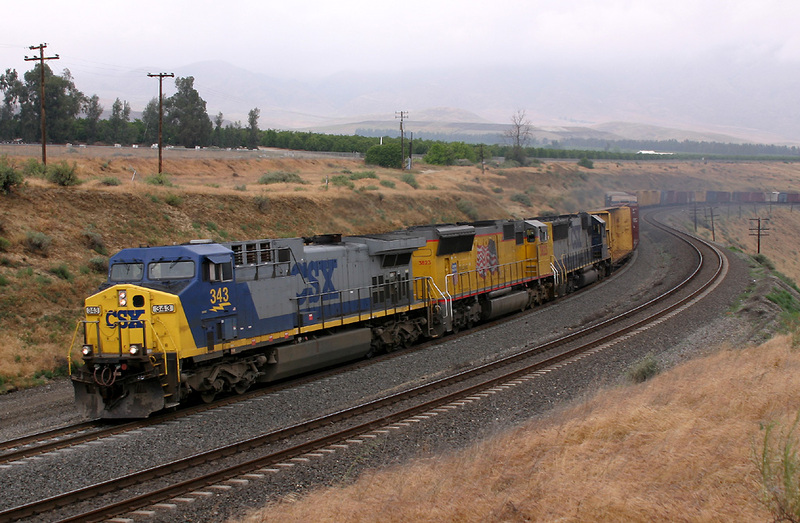 SJVR 1825, SJVR 2307 are pictured at Bakersfield. 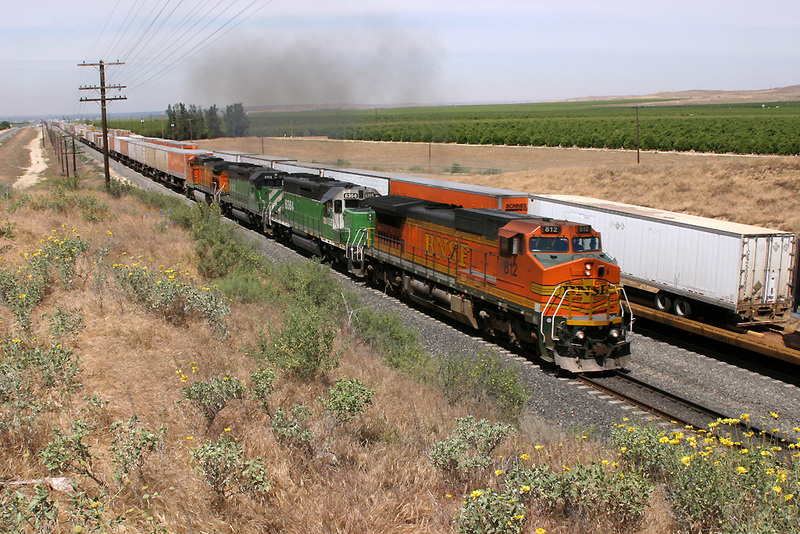 Locos from the San Joaquin Valley Railway usually have an assortment of traction which can be seen arriving, departing and switching various feeder services onto the BNSF network. 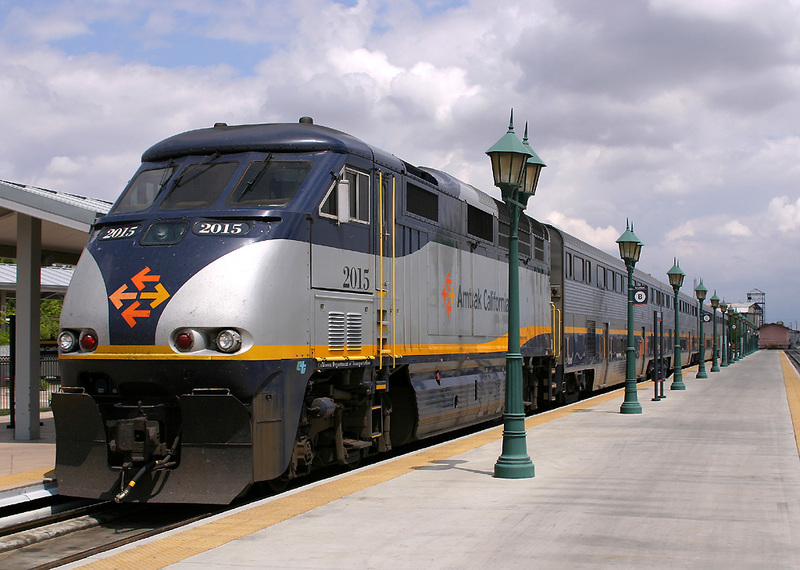 Amtrak 2015 is seen at Bakersfield 'Amtrak' station ready to head off with a service to Oakland 'Jack London Square'. 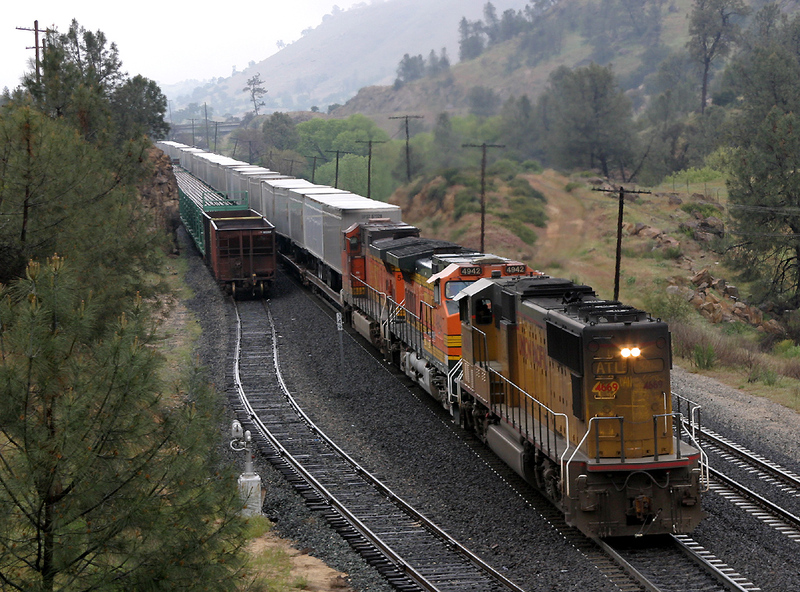 BNSF 8051, BNSF 4600, BNSF 6763 haul their 'bare table' train through Caliente Creek heading for Long Beach. 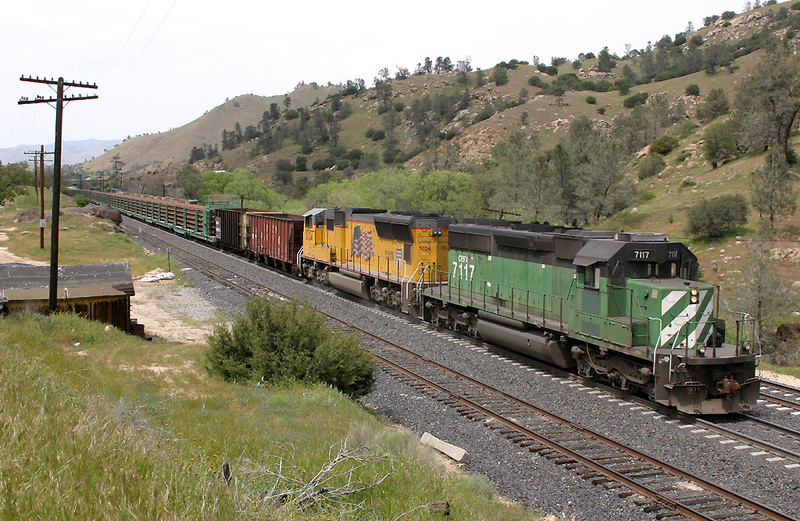 UP5734, UP4654, UP4979 round the curve into Tunnel 2 having climbed up from Caliente with a southbound manifest. 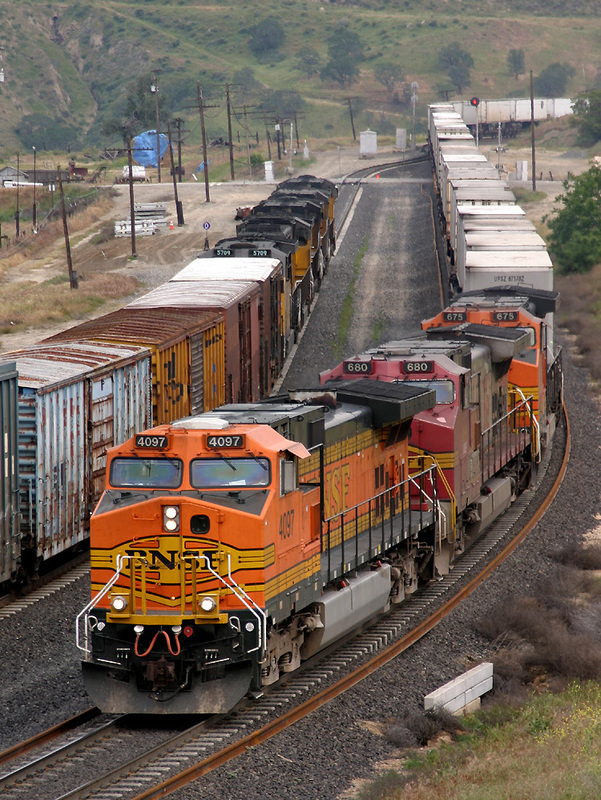 BNSF 5414, BNSF 7032, BNSF 9228, UP 3036 lead a northbound stack train through Bealville. 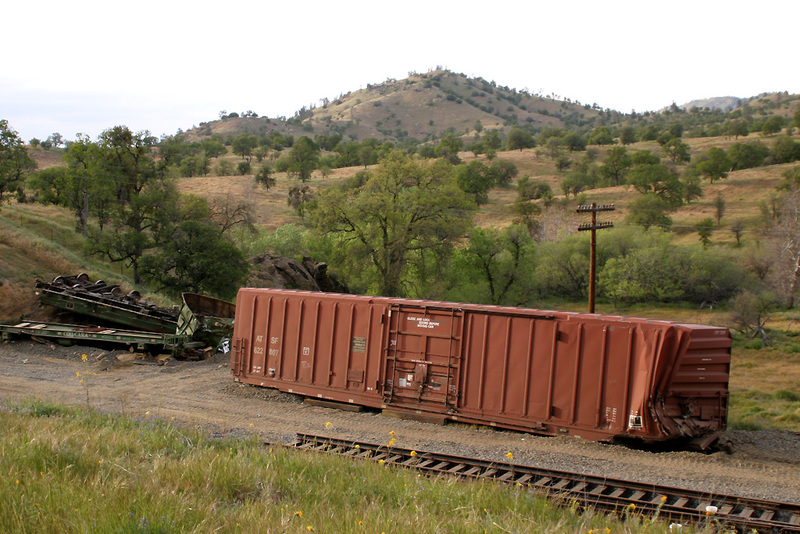 The morning period of the 25th April was spent on the Tehachapi Mountains. The traffic for the morning period was quite slow due to 'work windows' being taken on the mountain. 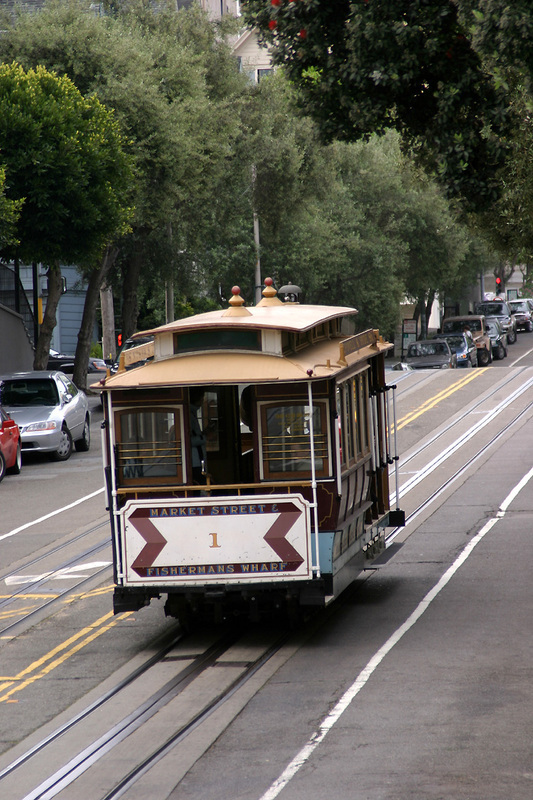 Around mid day, we then set off on a four hour drive to San Fransisco. 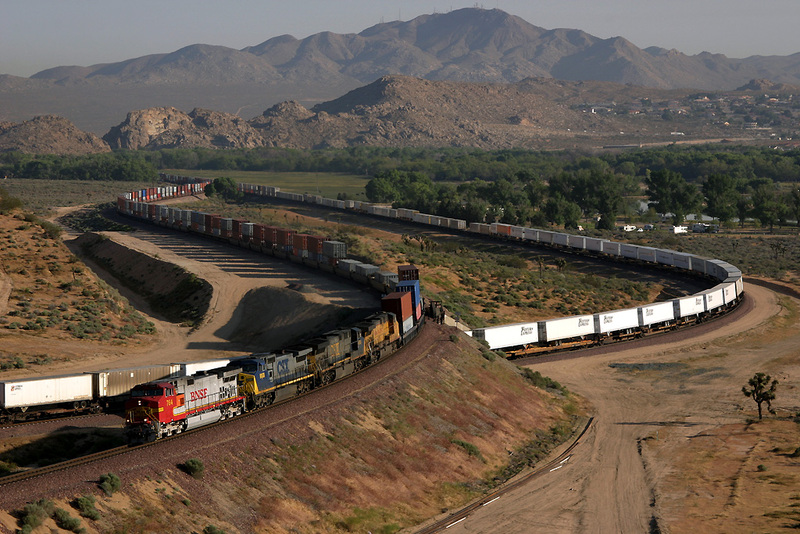 UP9553, UP3627, UP9635 pass Monolith with a southbound stack train. 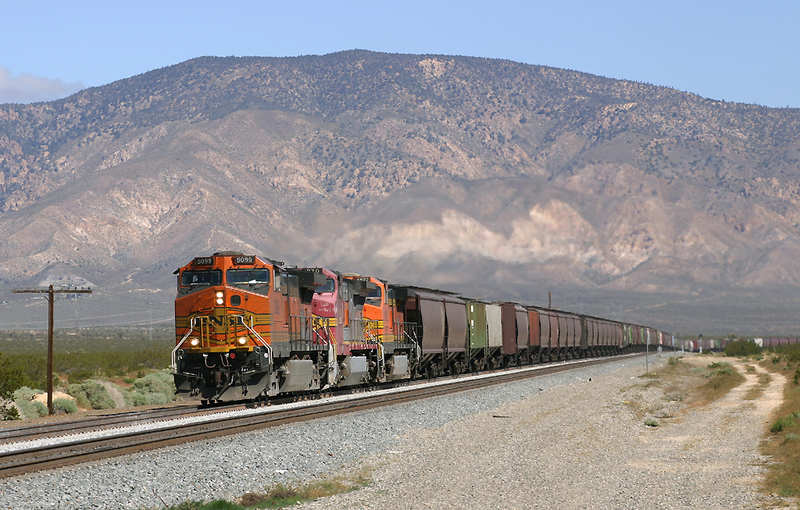 BNSF5099, BNSF870, BNSF4822 approach Mojave with the southbound grain train. 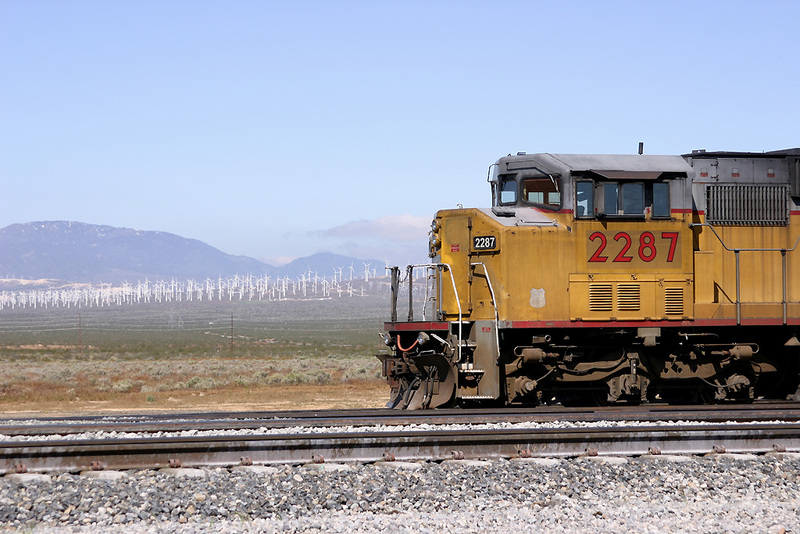 UP 2287, UP 2348 are seen stabled in Mojave Yard waiting to depart South with a manifest train, note the wind turbines which are a common feature of the landscape in the area. 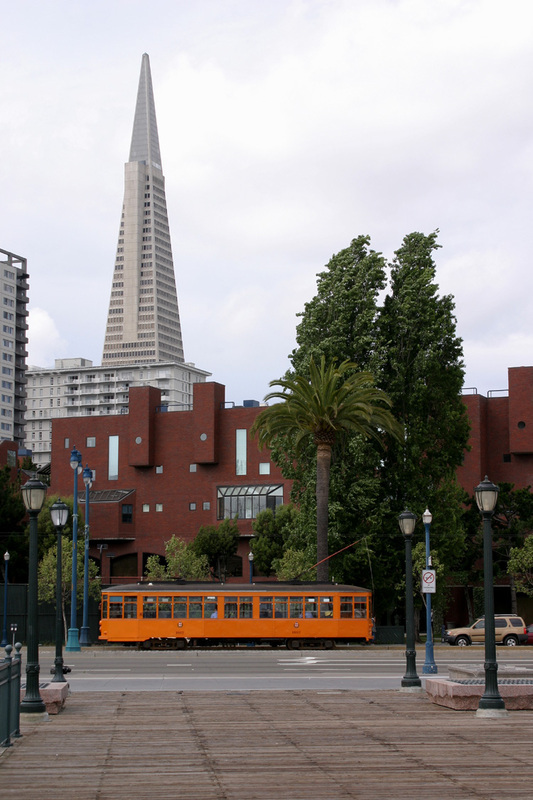 Having arrived in San Fransisco our first visit was to Jack London Square in Oakland. This is the location where 'street' running can be witnessed. 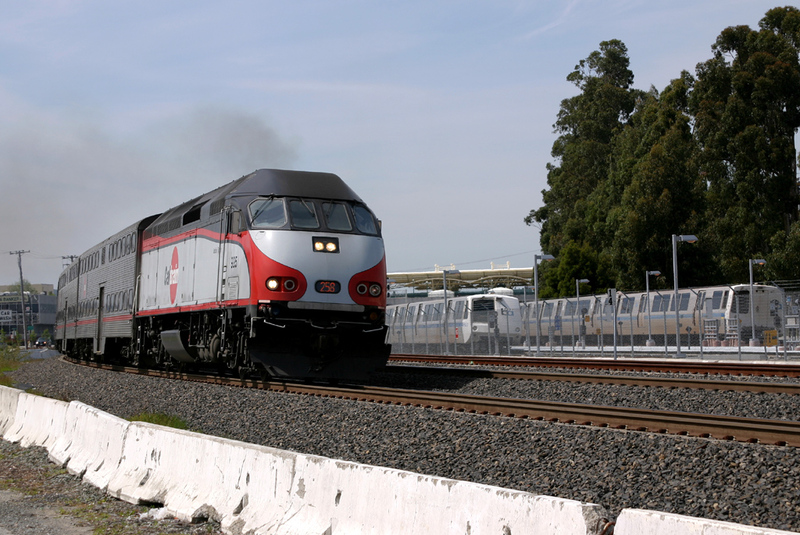 The afternoon period was then spent photographing the San Fransisco 'Cal Train' network. 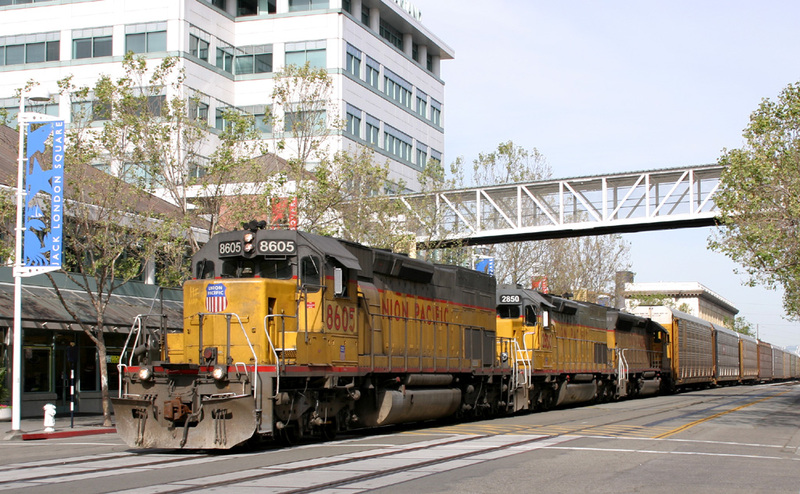 UP 8605, UP 2850, UP 2680 exit the Oakland Docks and make their trip through the 'Street Section' of Jack London Square, Oakland. 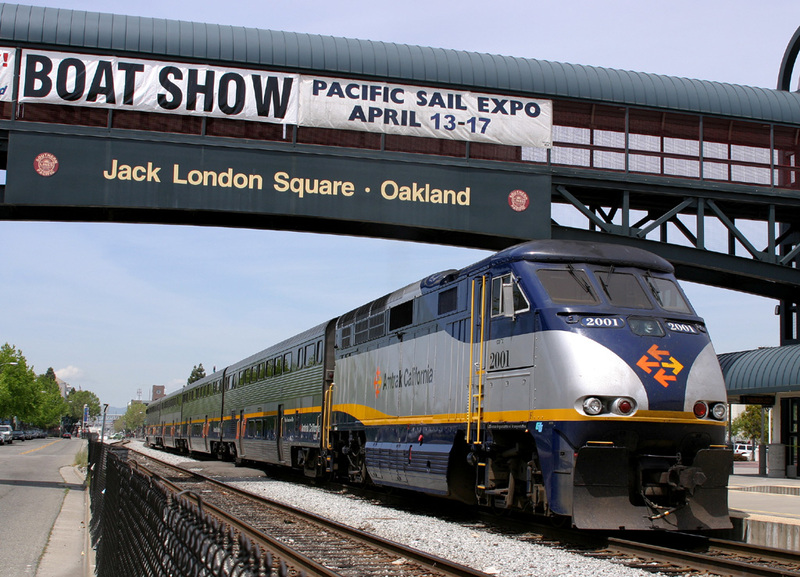 AM2007 arrives into Jack London Square from Sacramento. 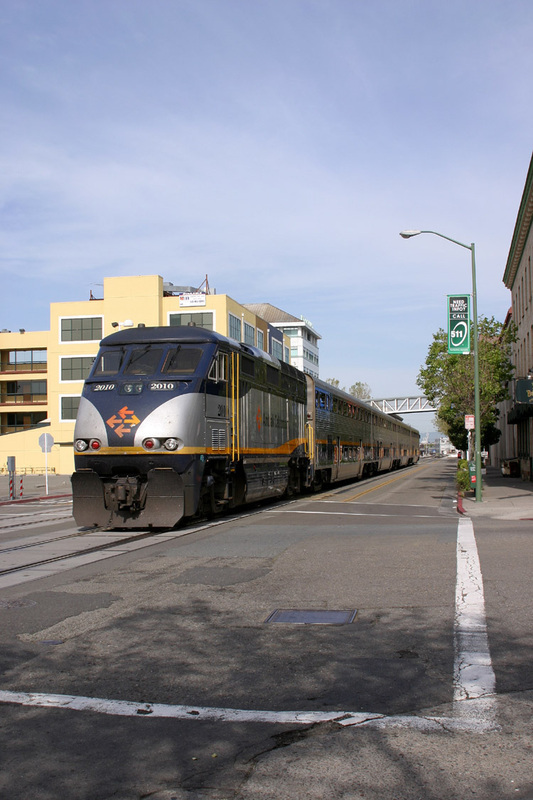 AM 2010 departs from Jack London Square with the 10:05 Oakland - Bakersfield. 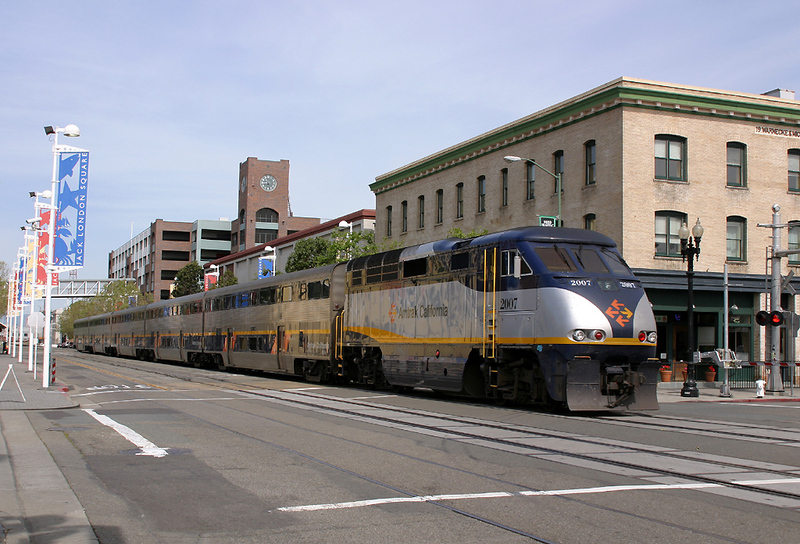 AM 145 arrives into Jack London Square with the 04:55 Bakersfield - Oakland. 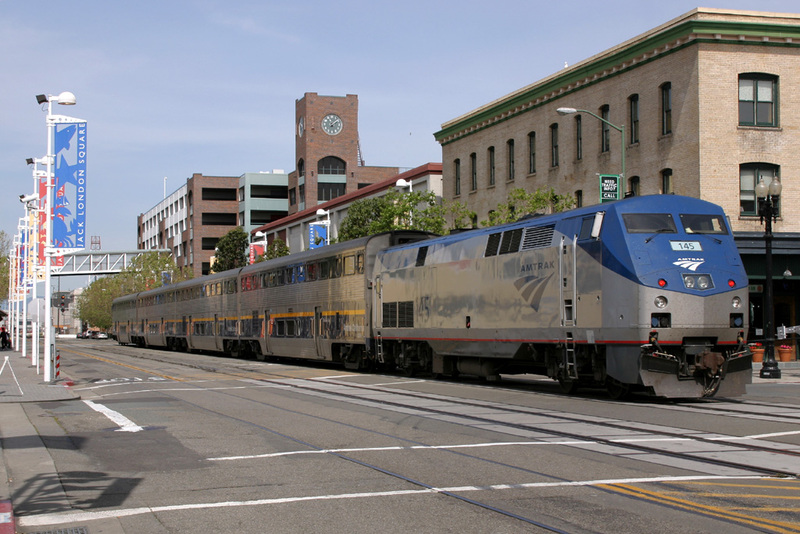 Three Ex Southern Pacific Locomotives passing an Amtrak service at Jack London Square, Oakland. 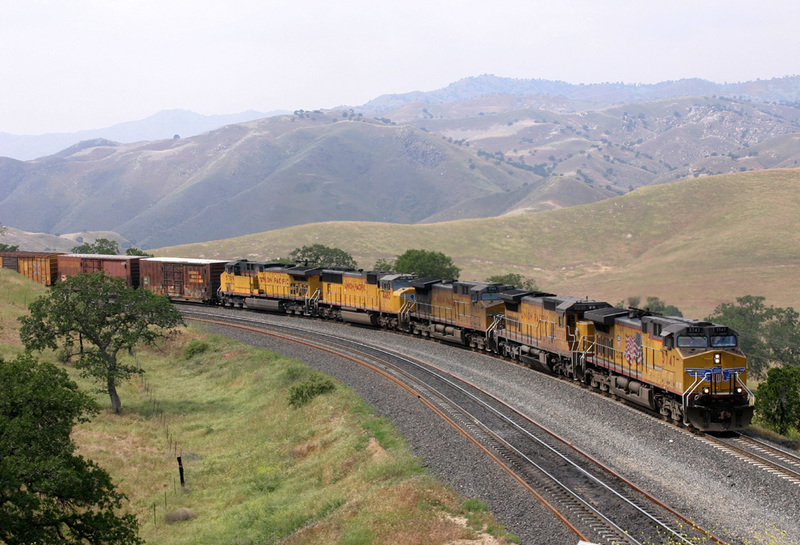 AM2001 heads out to the yard ECS, while SP/UP 8788, SP/UP 2745, SP/UP 8805 head out of Oakland with just three wagons in tow. 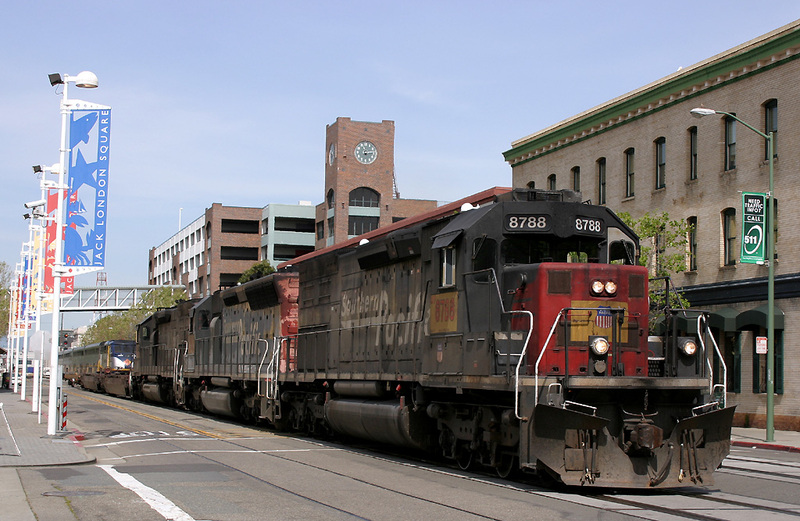 SF 2575, SF 2576 exit the docks area and head through Oakland light engine. 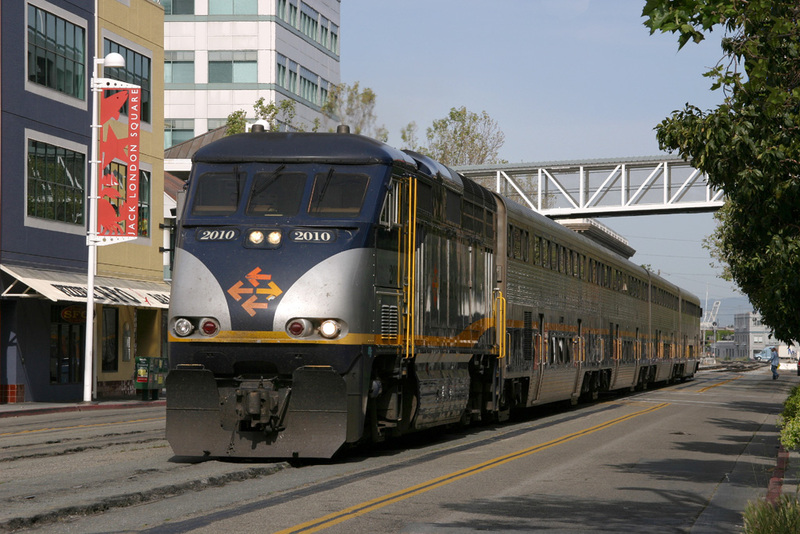 AM 2006 exits from Oakland with empty coaching stock to stable. 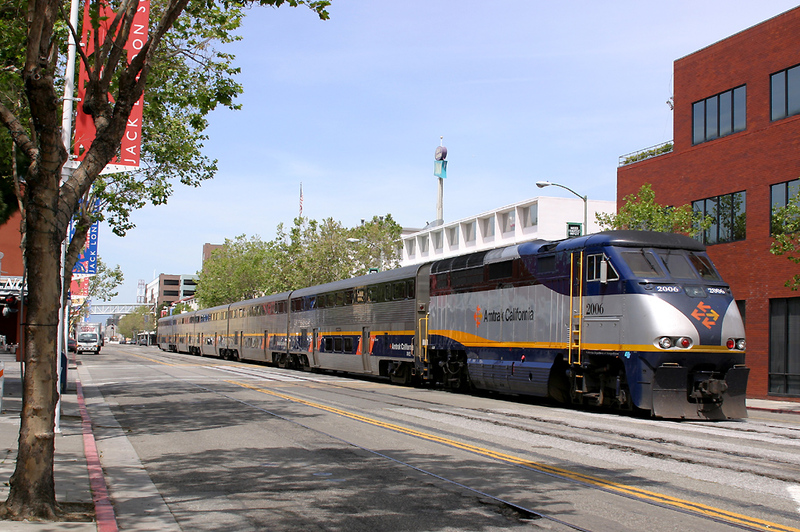 AM 2001 stands at Oakland Station having arrived on the 09:55 from Sacramento. 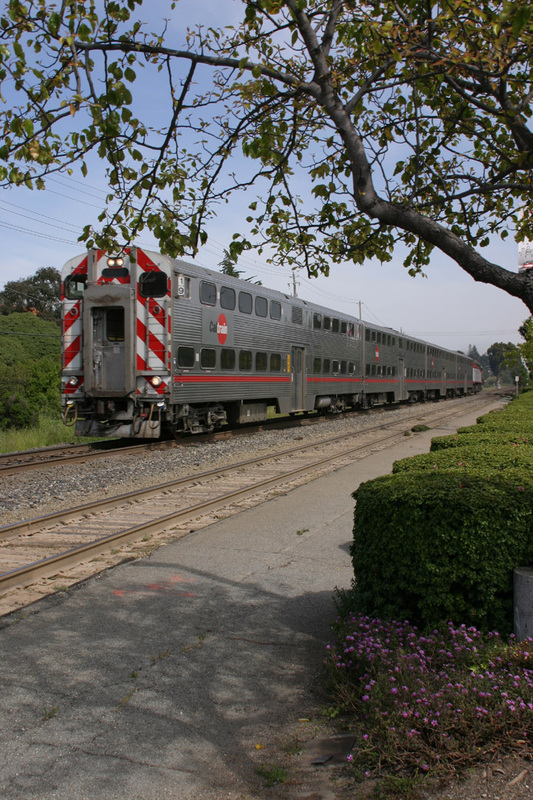 The San Francisco and San Jose Railroad Company began passenger rail service on the Peninsula in 1863. 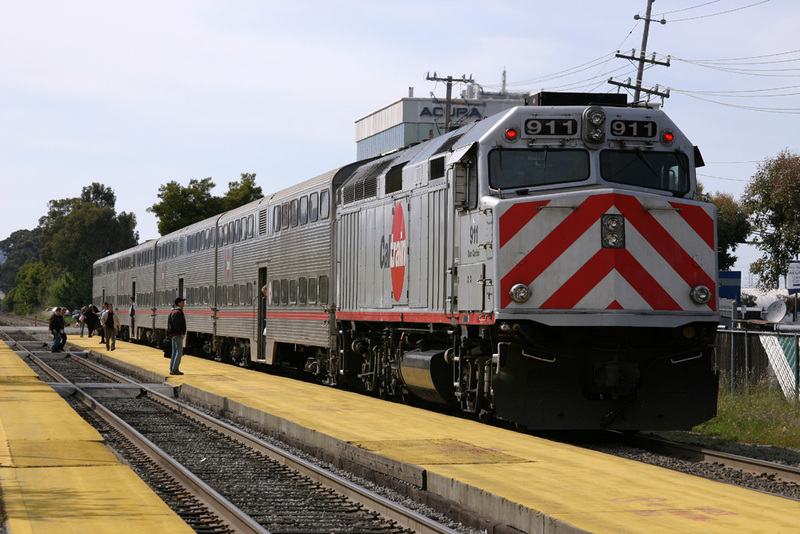 The system we know today as Caltrain had its start in 1992. 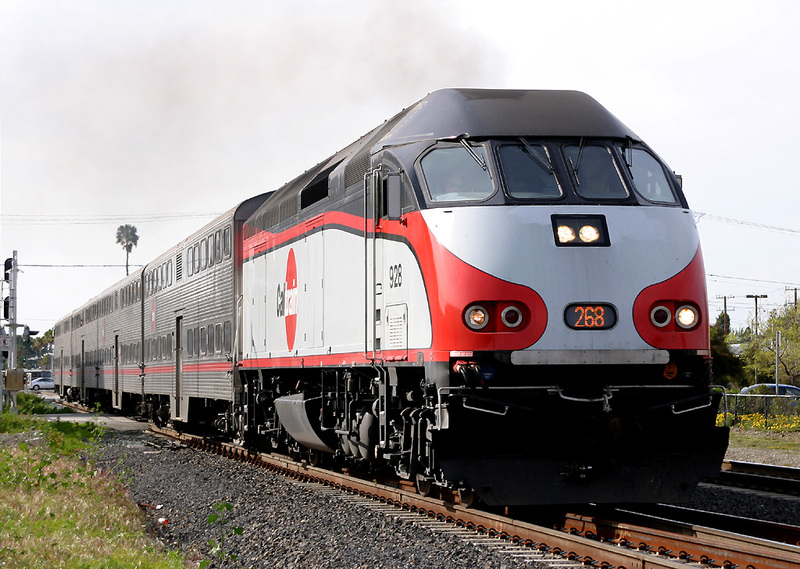 Caltrain operated between San Fransisco through intermediate stations to San Jose using 'push pull' double deck stock. 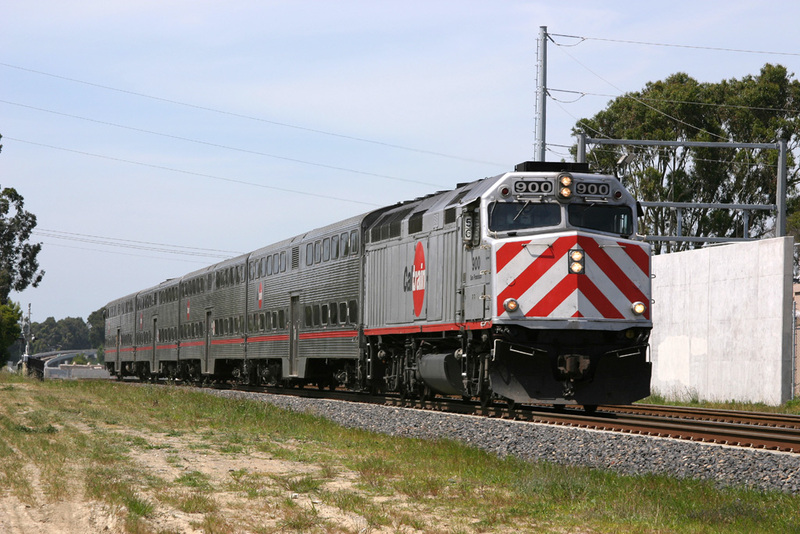 Locomotives on the route vary from F40PH-2 through to the newer MP36PH-3C. 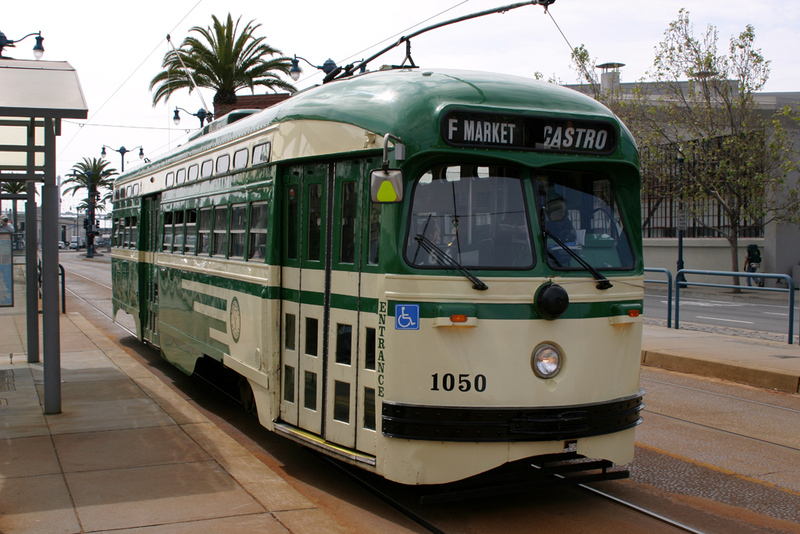 The 27th April was spent in San Fransisco, leaving the hire car at the motel we spent the day in the city looking at the sights and also gave us a chance to records the superb heritage streetcars which operate between Fishermans Wharf and Castro. 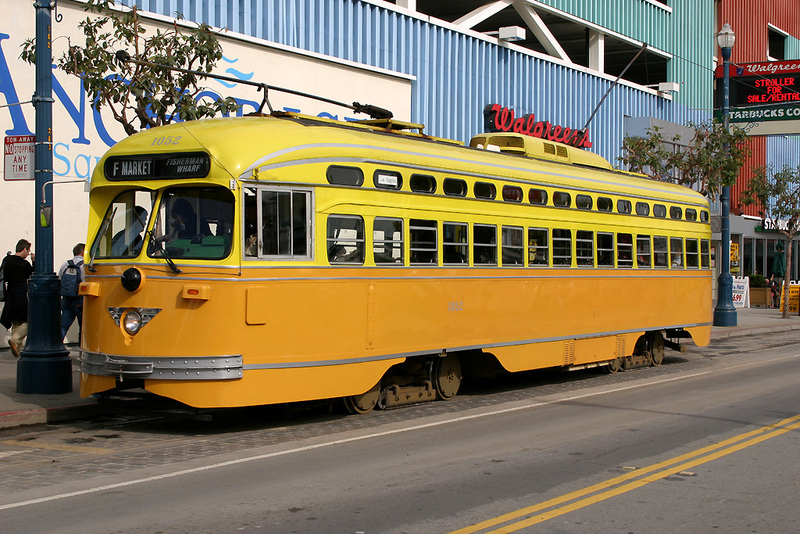 PCC Streamliner No.1052 is painted in Two Tone Yellow, and represents, Los Angeles, California (LA Railways) seen here at Fishermans Wharf. 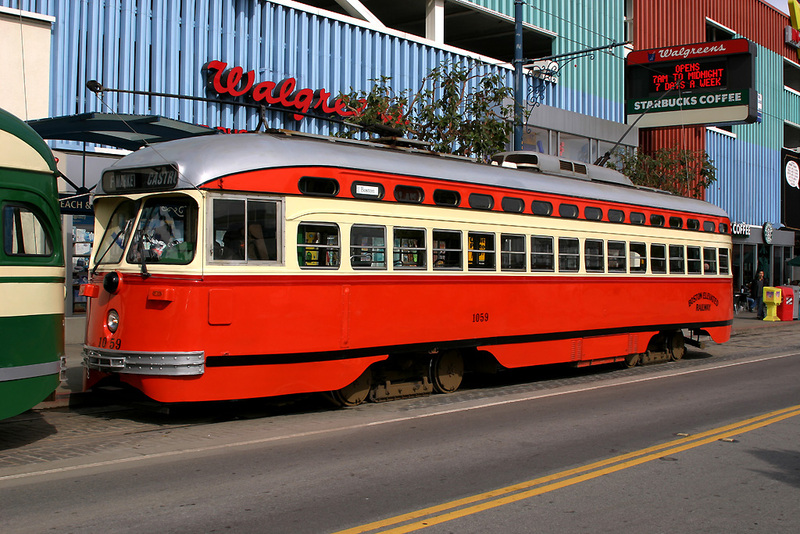 PCC Streamliner 1059 painted in Red, Orange, and Silver represents Boston, Massachusetts. Pictured at Fishermans Wharf. 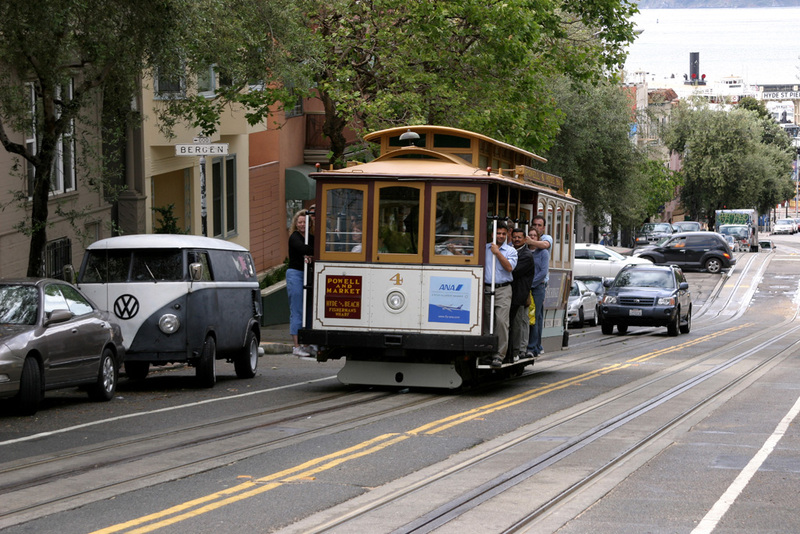 Cable Car No.8 arrives into Hyde Street Pier. 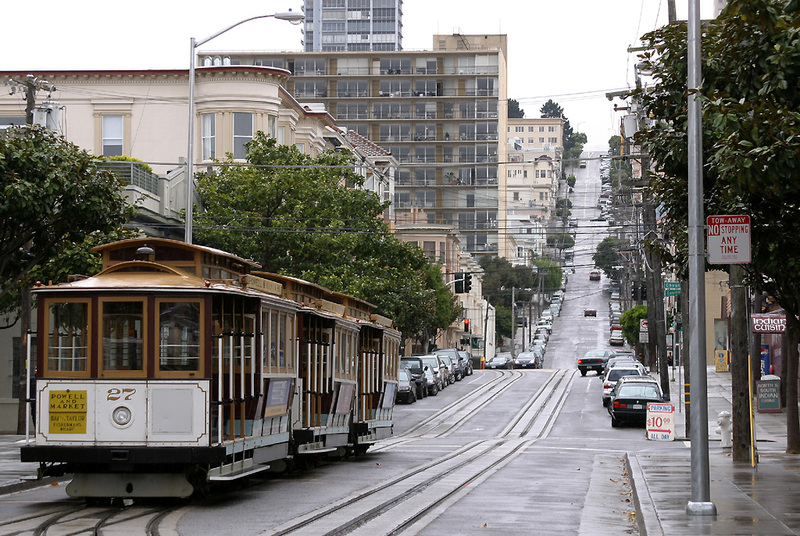 Cable Car No.4 climbs the hill from Hyde Street Pier. 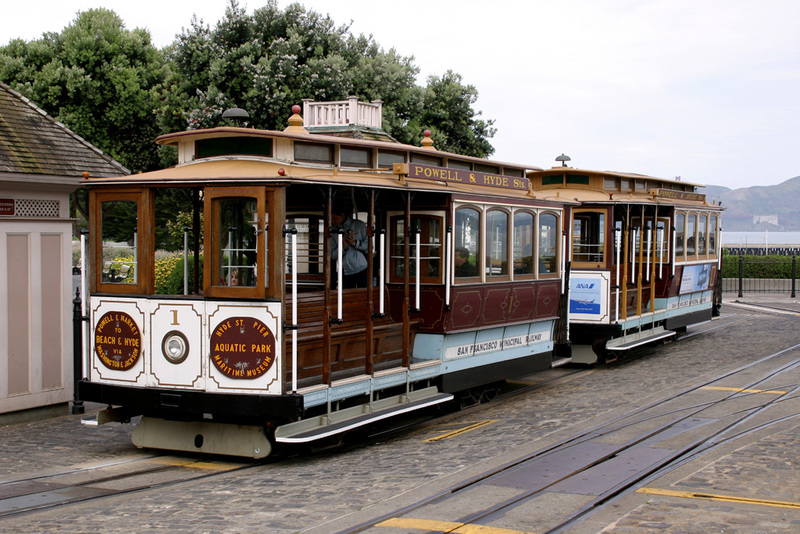 Cable Car No.1 and No.11 are seen stabled at Hyde Street Pier. 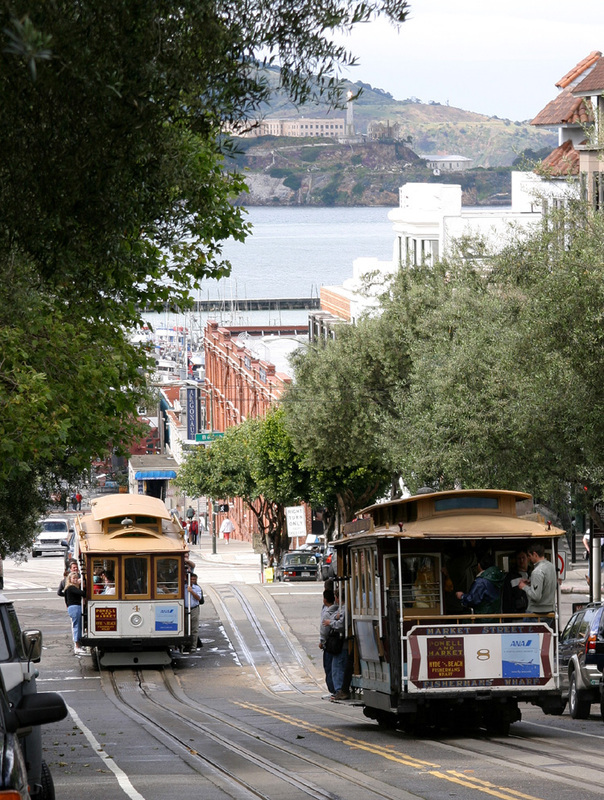 Cable Car No.4 and No.8 pass on the hill near Hyde Street Pier. Cable Car No.1 arrives into Hyde Street. 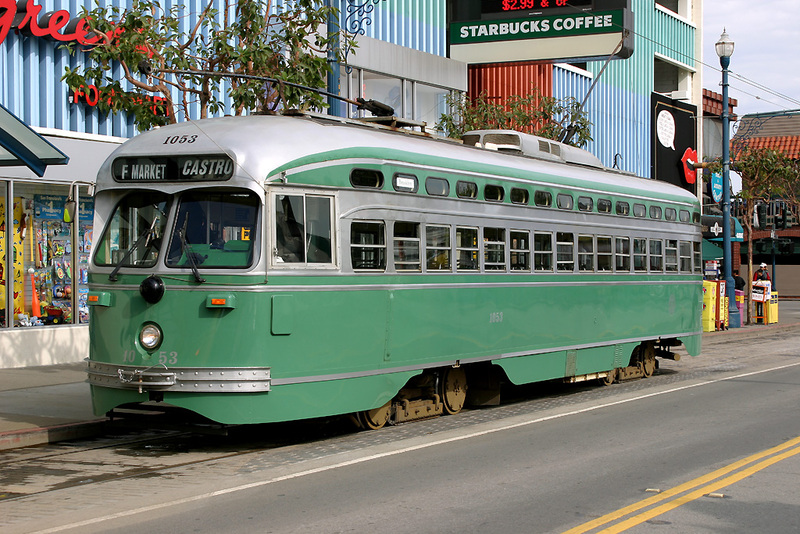 No.1053, Streamliner 'PCC STREETCAR', a Brooklyn, New York livery painted in 'Aqua and Silver' seen at Fishermans Wharf. 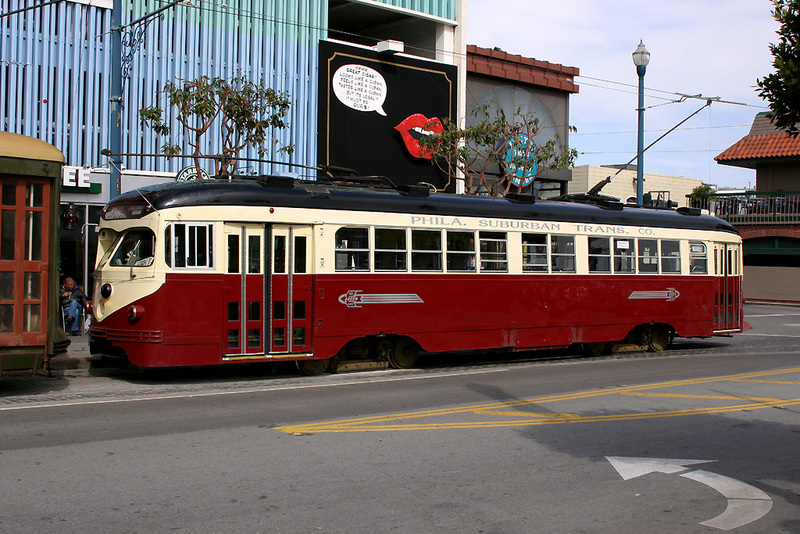 No.952 Vintage Trolly. 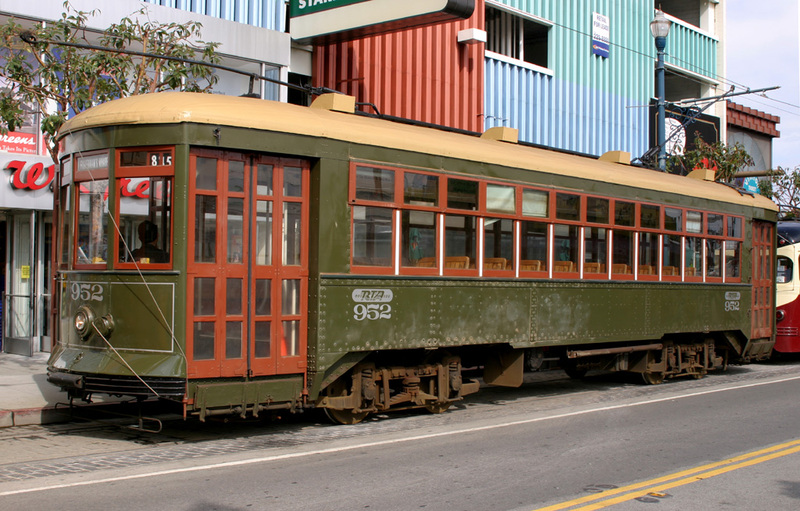 New Orleans, Loisiana built in 1923 and still running today in San Fransisco. 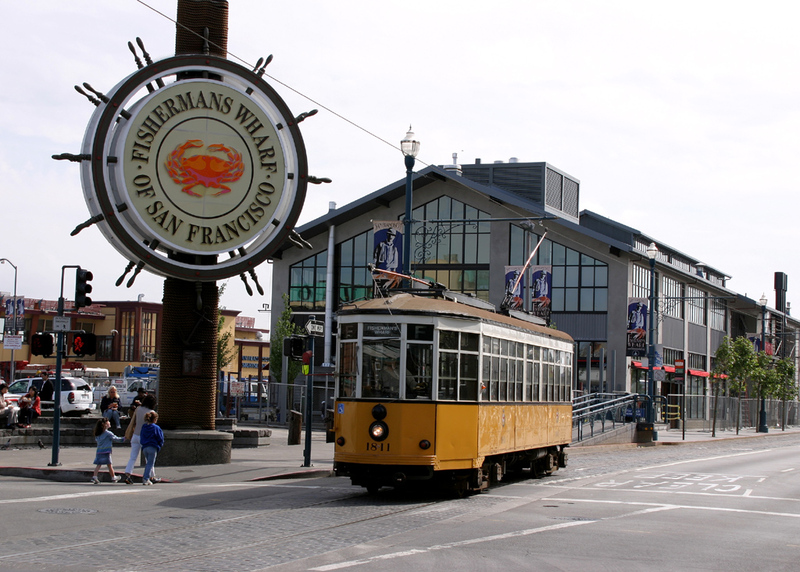 No.1811, Peter Witt 'Milan Tram' Built in 1928, painted in Milan Yellow, passes Fishermans Wharf. 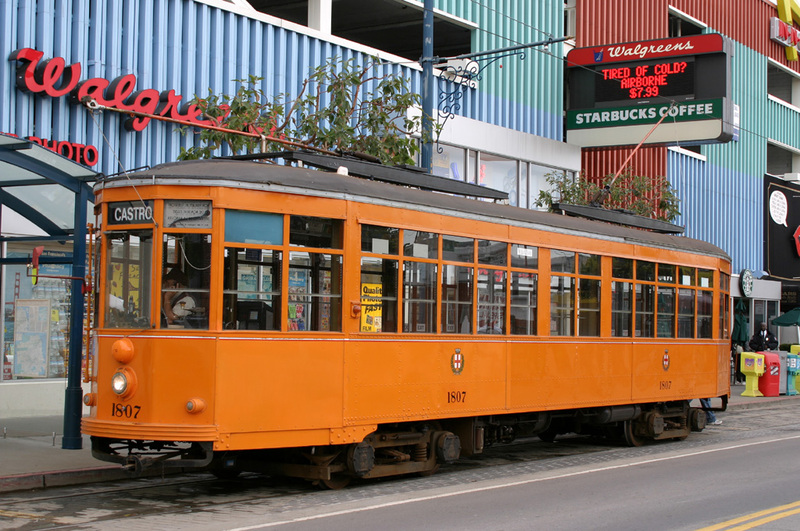 No.1807, Peter Witt 'Milan Tram' built 1928 painted in Milan 'Orange' working back to Fishermans Wharf past the Trans-America Tower. 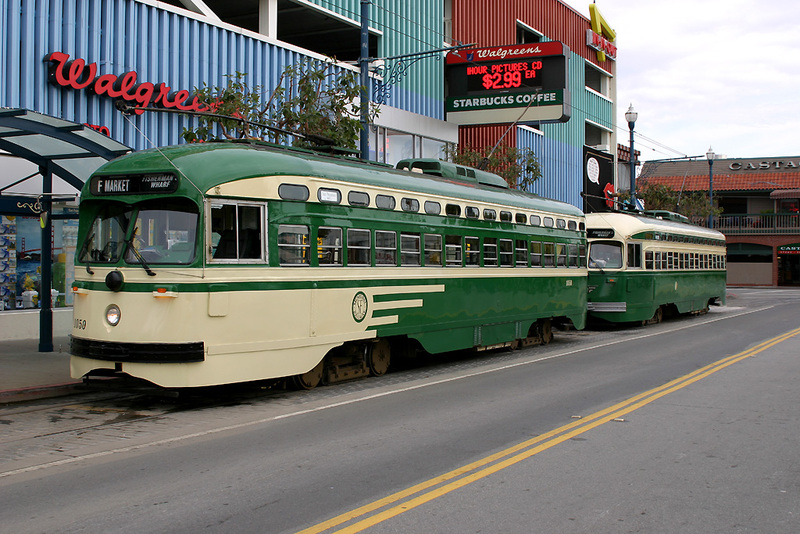 No.1007, Streamliner 'PCC STREETCAR' painted in 'Philadelphia Suburban 'Maroon/Black'. 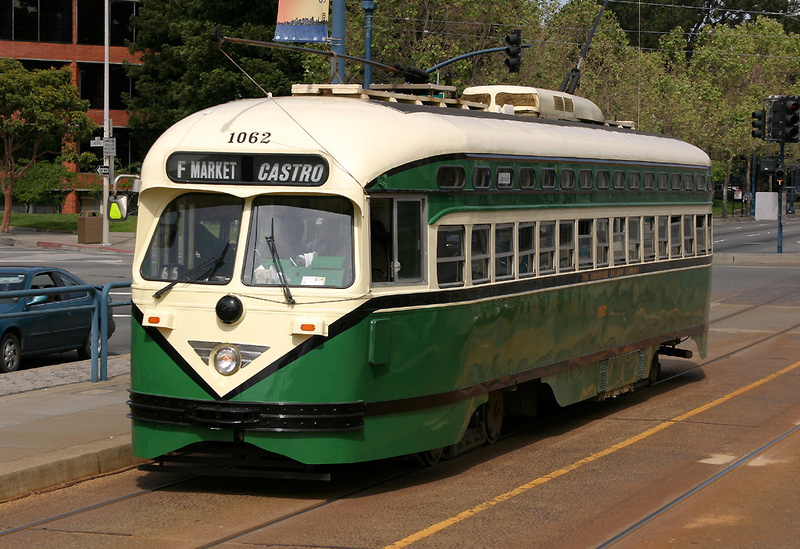 No.1050, Streamliner 'PCC STREETCAR' San Francisco 1950's 'Green and Cream'. 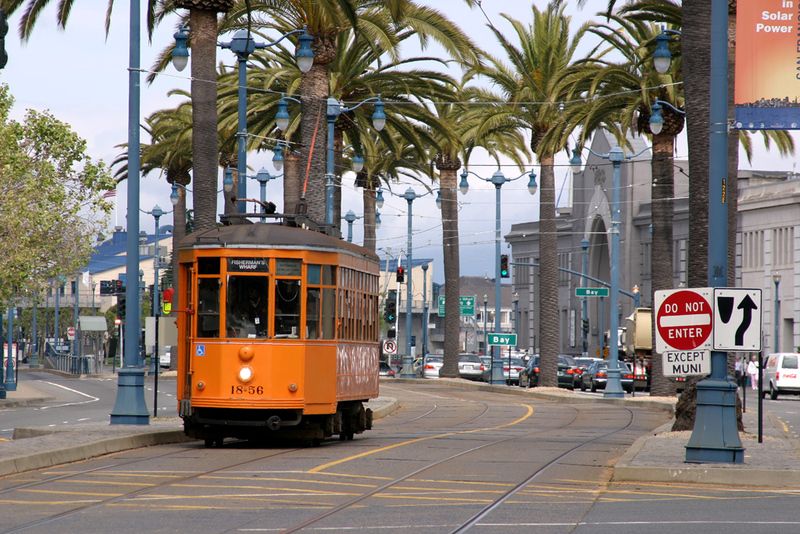 No.1856, Peter Witt 'Milan Tram' heading down Fishermans Wharf and the Palm Tree Avenue. 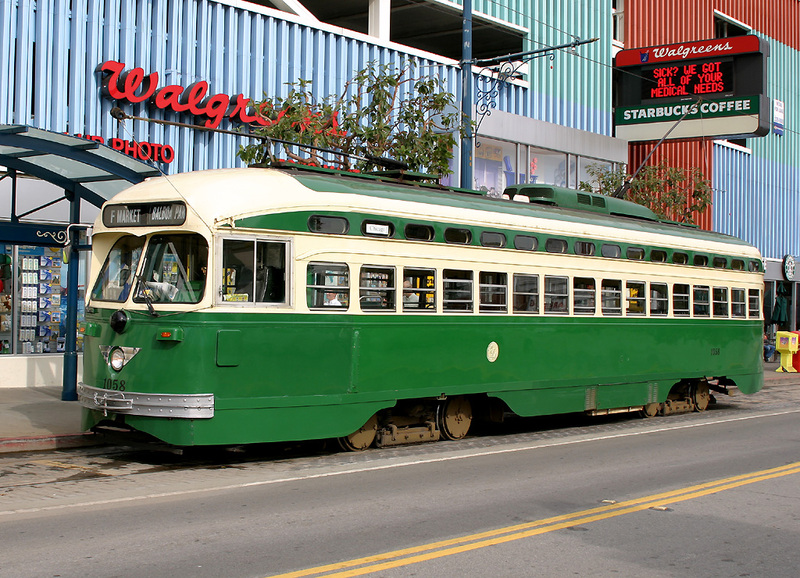 No.1062, Streamliner 'PCC STREETCAR' Louisville, Kentucky livery, 'Green and Cream' seen heading along Fishermans Wharf into the city streets. 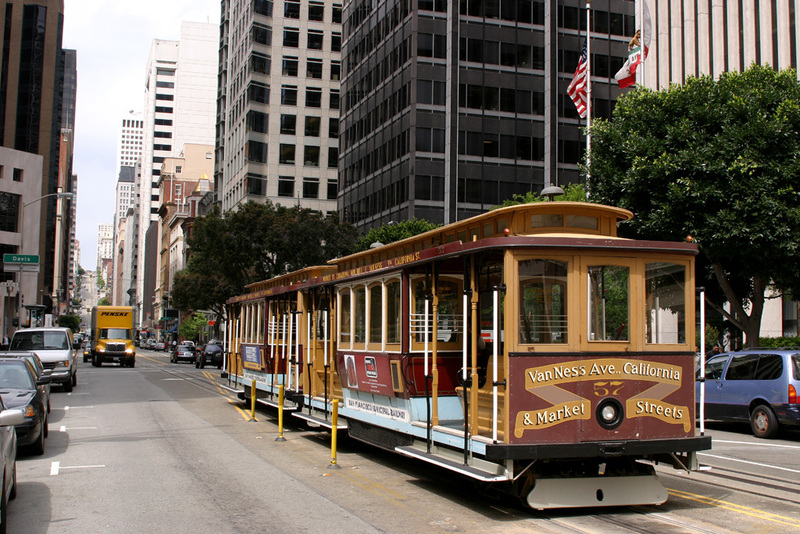 On the 28th April we made an early departure from San Fransisco driving back to Bakersfield arriving around mid day. Our first port of call on the way back to Tehacahpi was Sandcut before a drive through the mountains see capture freights which were operating in the area. CSX 608, CSX 682 round the cruve at Sandcut in a rare appearance of single 'CSX' traction over the Techachapi Mountains. What a view, this is what you can see from Sandcut standing on the knoll it's possible to see all the way to Bena and Caliente Creeke!! 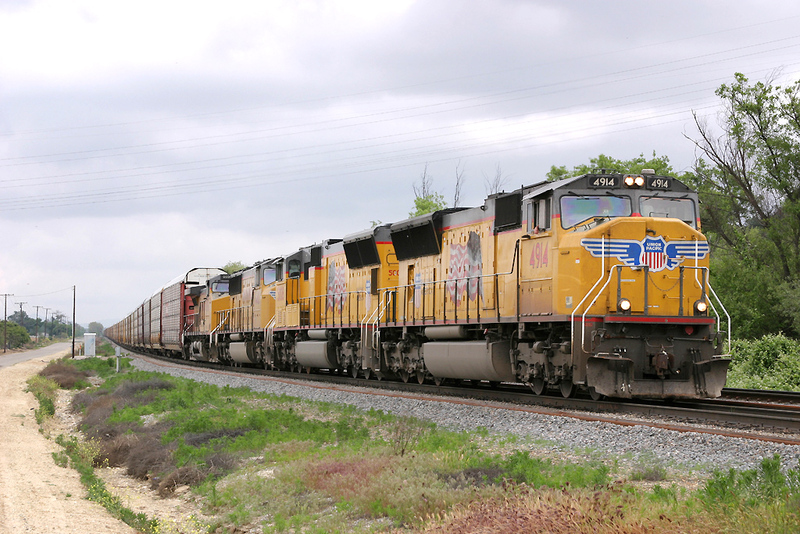 UP 5809, UP 5119, NS 2532, (REAR UP 9384, UP 5815) are seen at Bealville with a Southbound Mainifest. 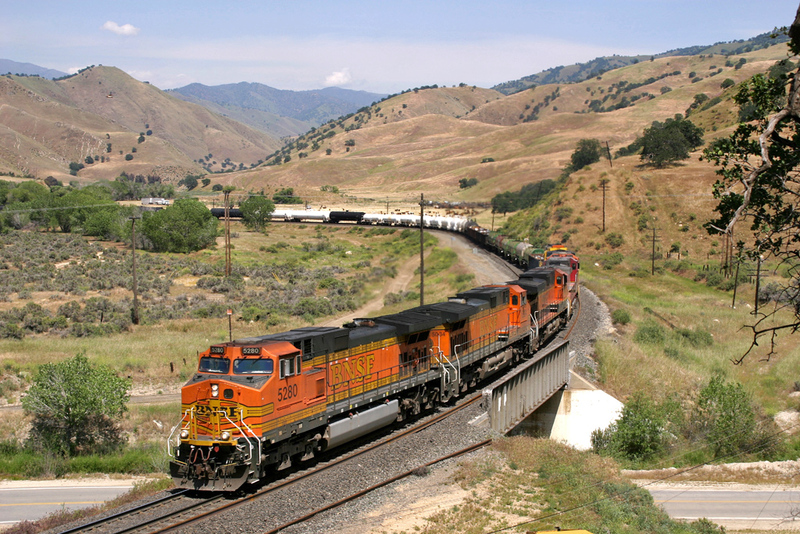 BNSF 4968, BNSF 4953, BNSF 5357, BNSF 5477 round the curve at Tunnel 2 climbing the mountains. UP4669 is seen stabled at Woodford with part of a Rail Train unloading wagon. 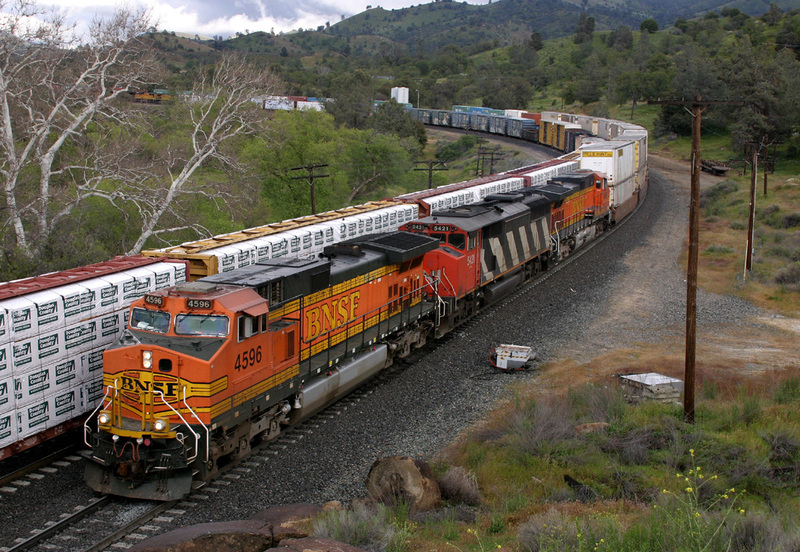 BNSF 4596, 'Draper Taper' CN 5421, BNSF 4669 pass Woodford with a Northbound train heading over the Mountain. 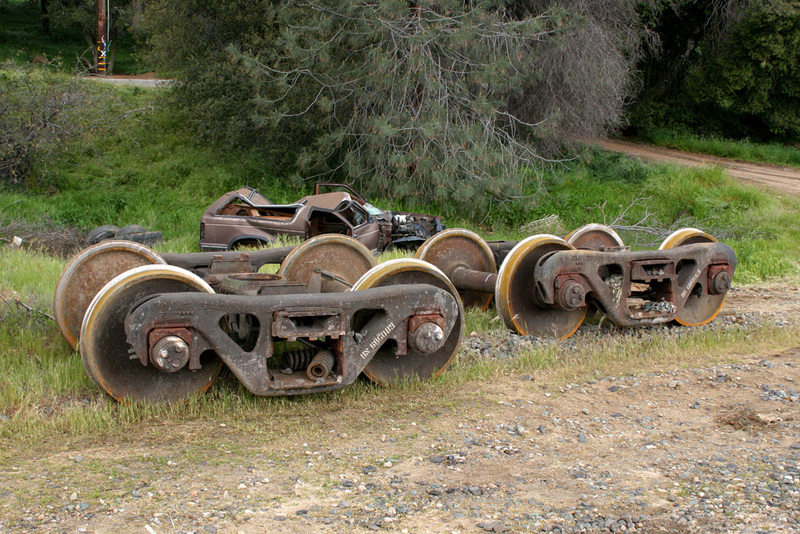 The appearance on Canadian Loco's is not unknown, but a 'Draper Taper' is somewhat rare. 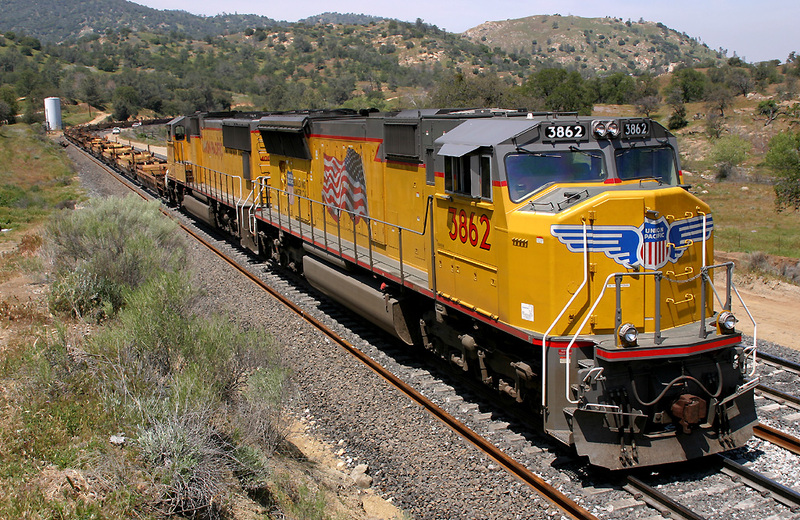 The loco body actually tapers along it's body length. 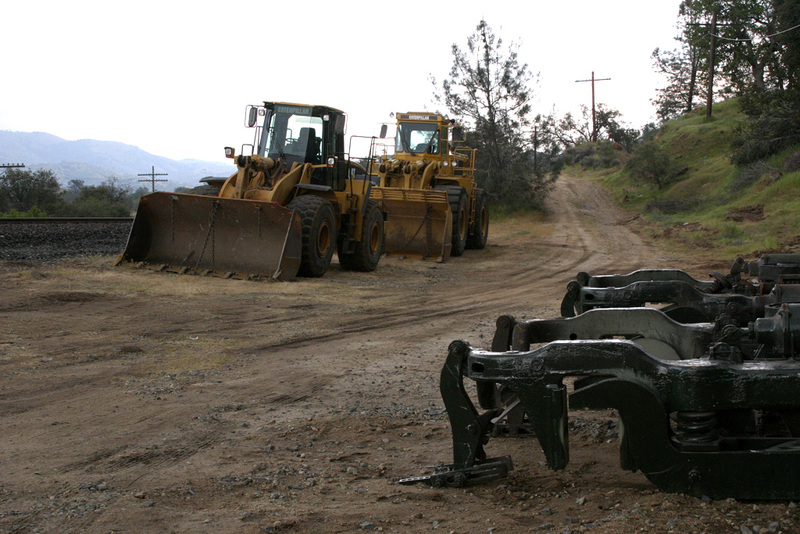 We spent the 29th April back on the Tehachapi mountain range between Mojave and Bakersfield. 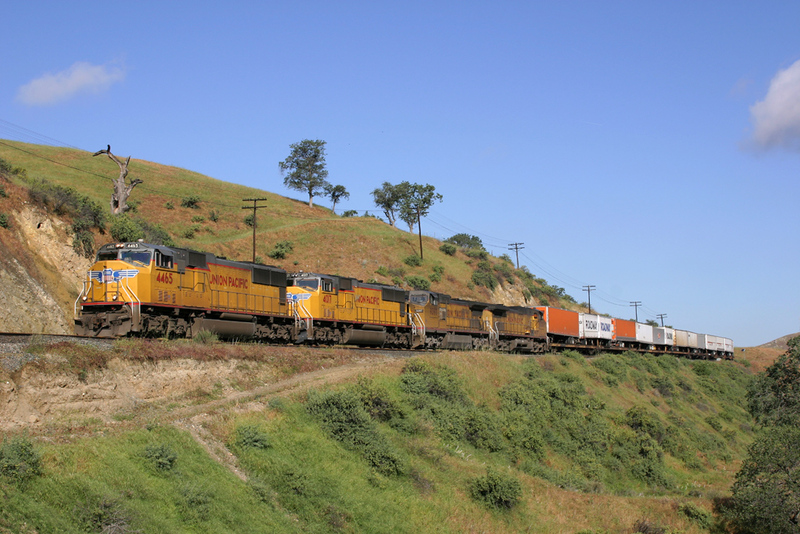 UP 4465, UP 4017, UP 9397, UP 9720 decend Caliente Hill having passed over the Mountain with their North Bound Intermodal. 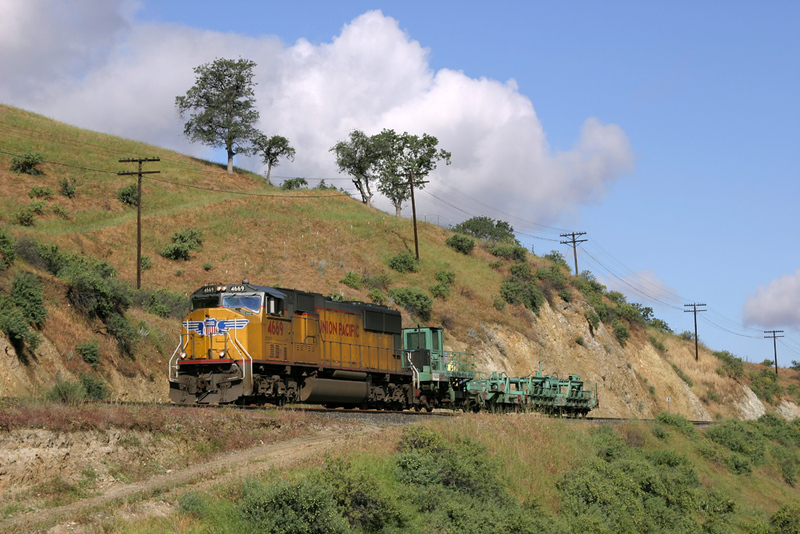 UP 4669 passes Caliente Hill with a single rail unloading car, which was then attached to the rail train at the bottom of the hill. 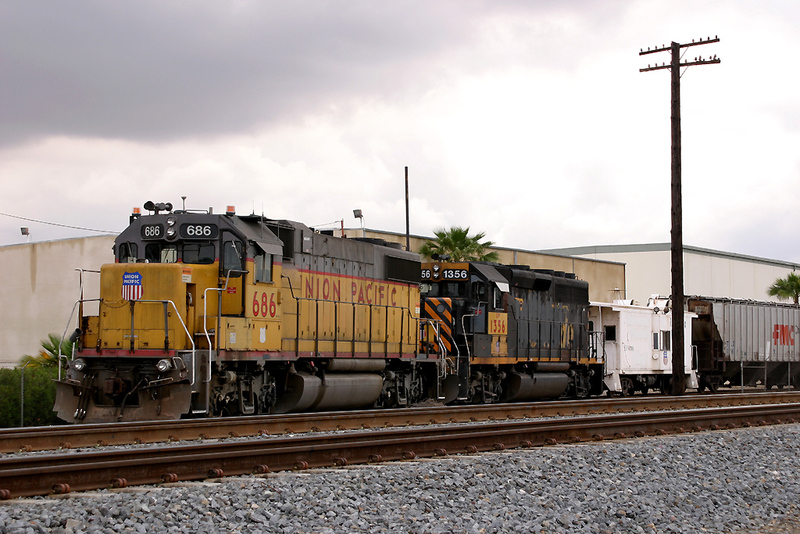 UPY 686, and UP 1356 are seen at Edison. 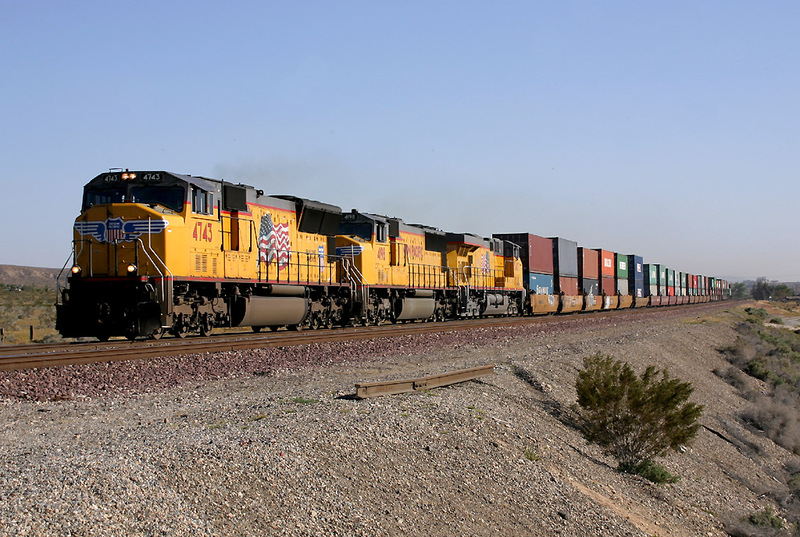 686 is a remote control unit which was working with the Ex Rio Grande unit on a local pickup freight from Bakersfield. 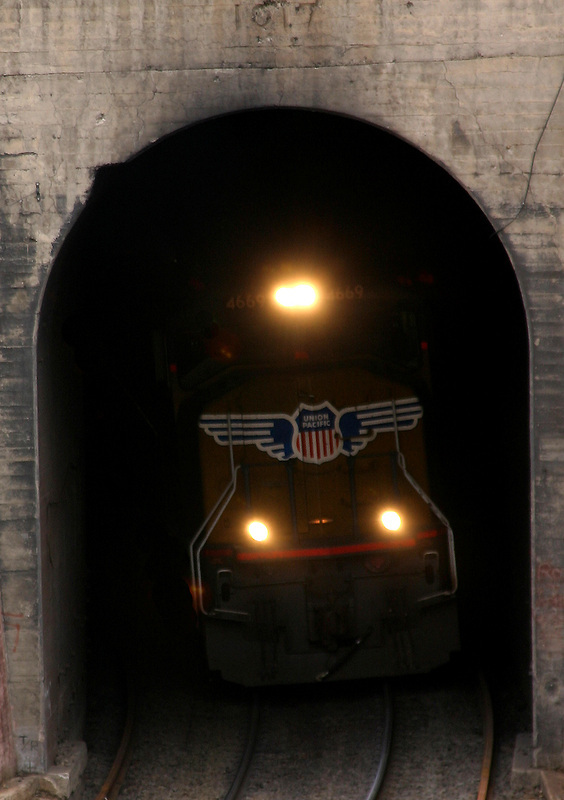 UP 4669, UP 9638 are seen entering Tunnel 2 at Techachapi. They were pussing their rail train backwards over the entire Mountain Range as far as Woodford! 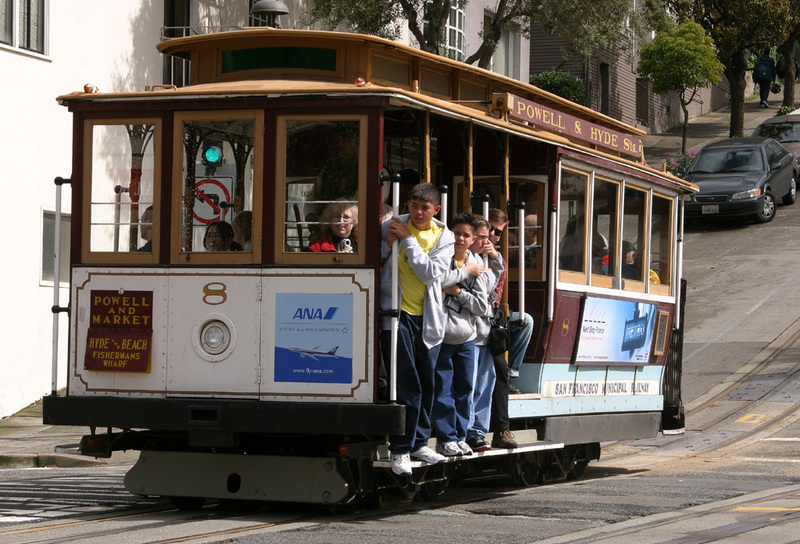 This is somthing which I'm sure would have Network Rail in a flap in the UK! UP 4105, UP 5793, UP 4745 pull away from Magunden after a crew change. 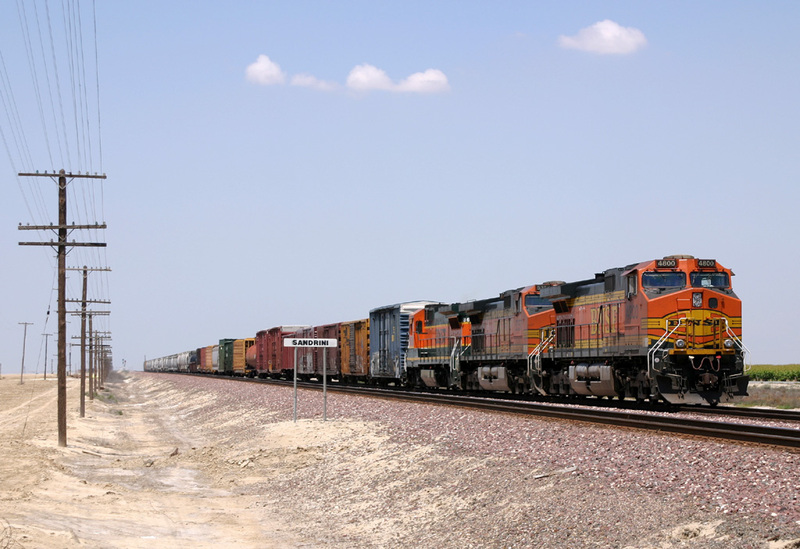 BNSF 4404, BNSF 4380, BNSF 4026, BNSF 5396 pass Sandcut on a South Bound stacker . 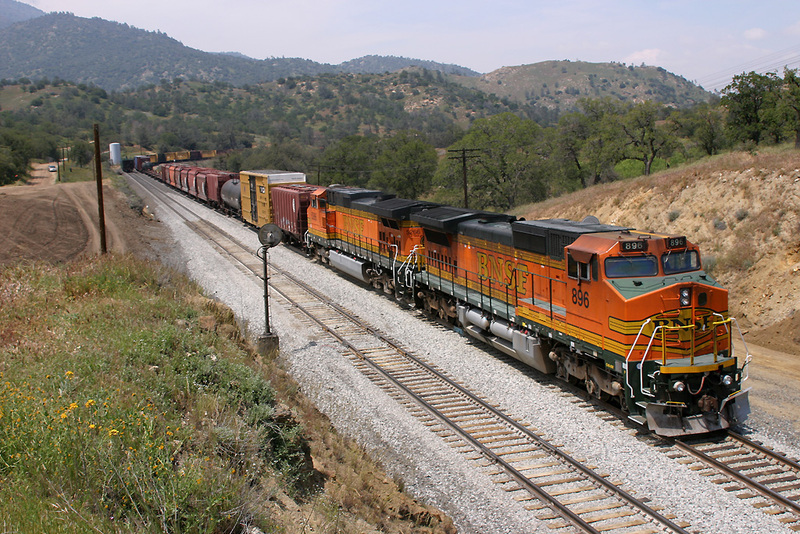 BNSF 4055, SF 637, BNSF 884 (REAR BNSF 517, BNSF 5014) are seen at the Caliente Railfan Tree working North on a Manifest. 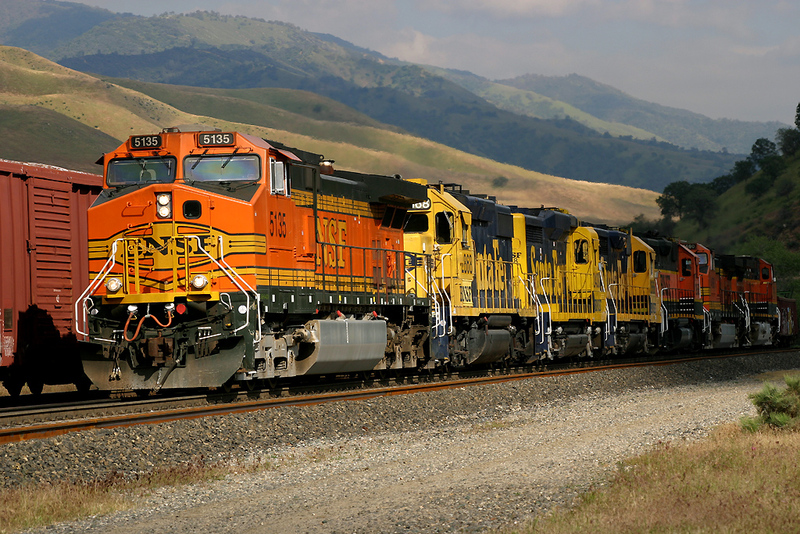 BNSF 5135, SF 2868, SF 2438, SF 2566, BNSF 2958, BNSF 4960, BNSF 1104. 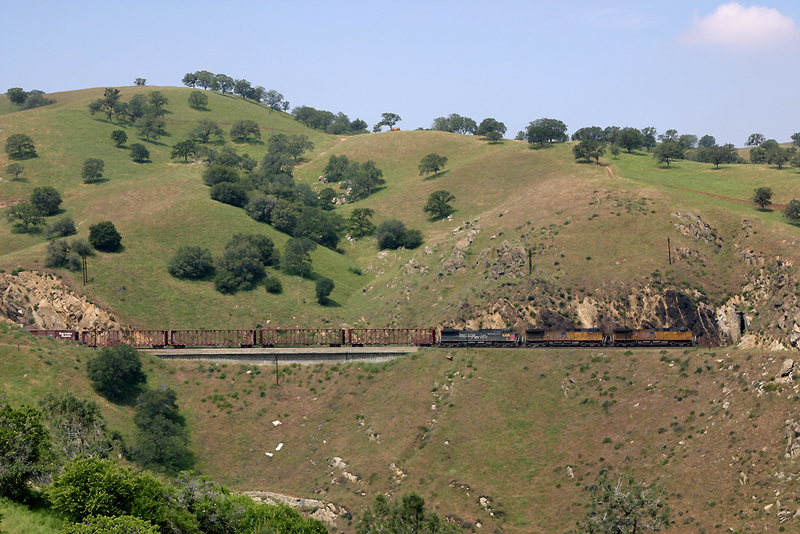 Some real ratable traction on this North bound Manifest train seen passing the Caliente Railfan Tree. UP 5835, UP 4141, UP 4137, UP 5170 crossing a Cable with the conductor doing a 'Roll By' for the South Bound UP service. 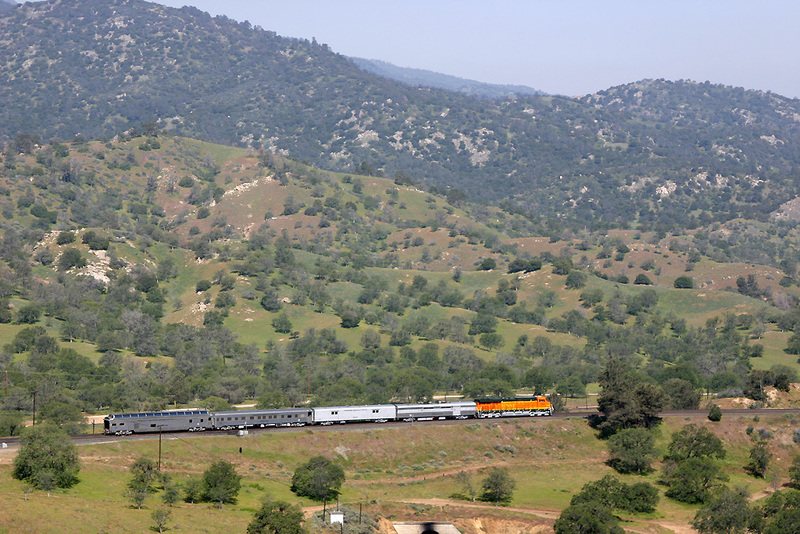 UP 5835, UP 5788, UP 9571 (EX SP) are seen passing Tunnel 7, part of the most inaccessible part of the Tehachapi Mountain Range! 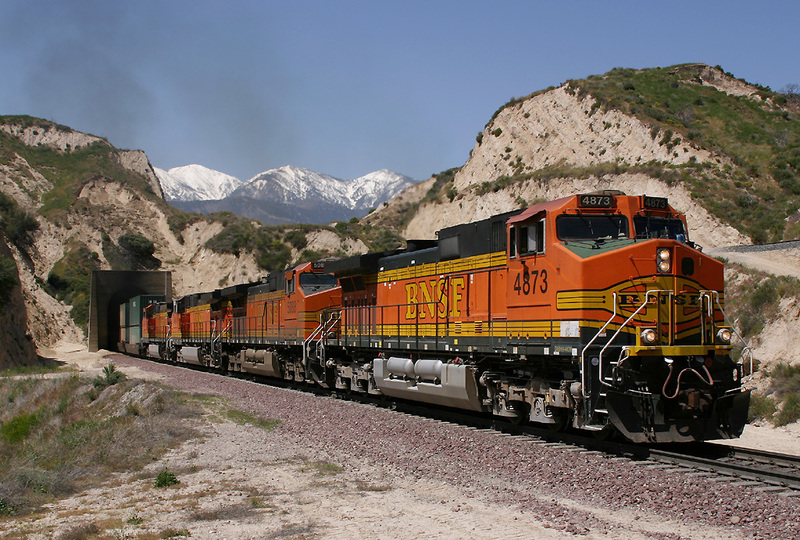 BNSF 4029, BNSF 5215, BNSF 5217, (REAR, BNSF 4545, BNSF 4525) enter Tunnel 7 heading over the mountain. 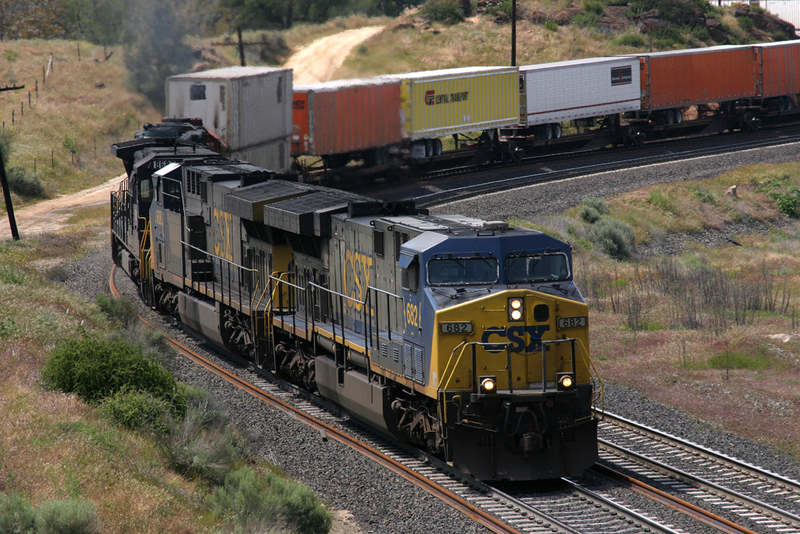 CSX 608, CSX 682, NS 8687, BNSF 6860 are seen arriving at Rowen on a South bound intermodal, giving the rare site of CSX locos leading a Train over the mountain. 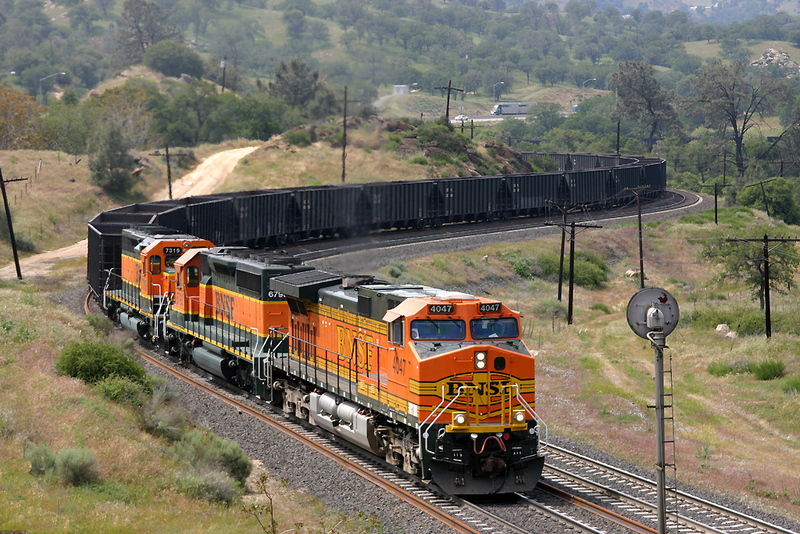 BNSF 4047, BNSF 6793, BNSF 7319 lead an empty South Bound coal train through Rowen heading towards Woodford. 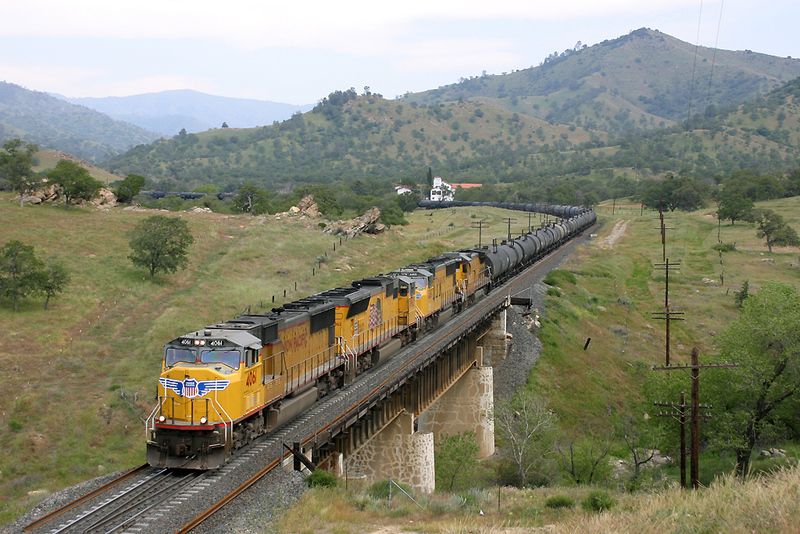 UP 4061, UP 4692, UP 4466, UP 1828 cross the Rowan Tresal Bridge with a North Bound Oil Train. 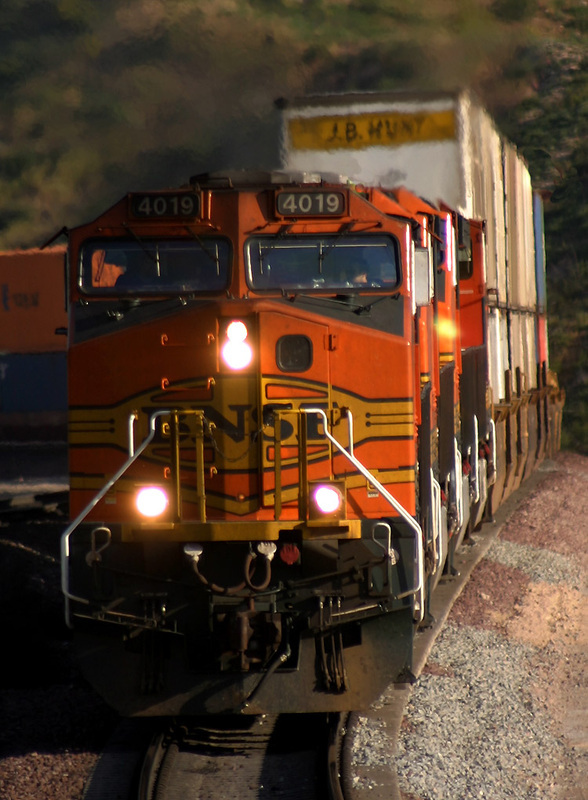 BNSF 4669, leads NS2617 and BNSF 690 into Tunnel 2 with the south bound 'Grain Train'. 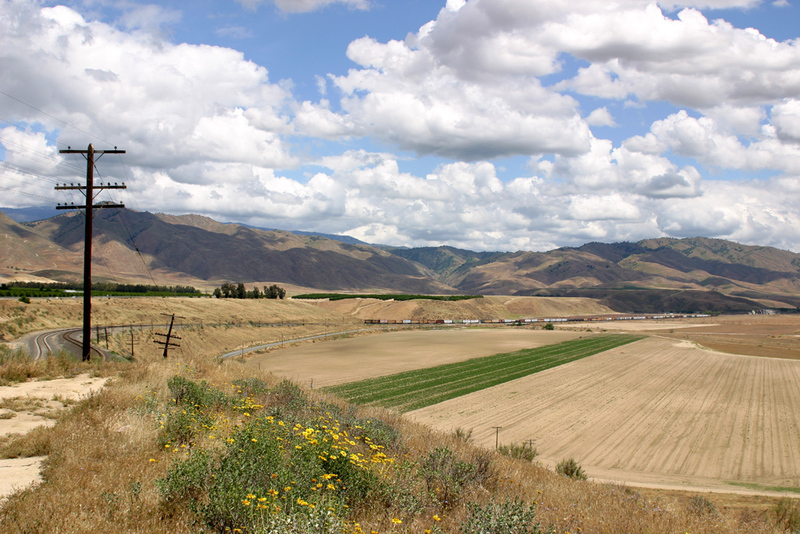 We spent the 1st May on the Tehachapi mountain range between Mojave and Bakersfield. 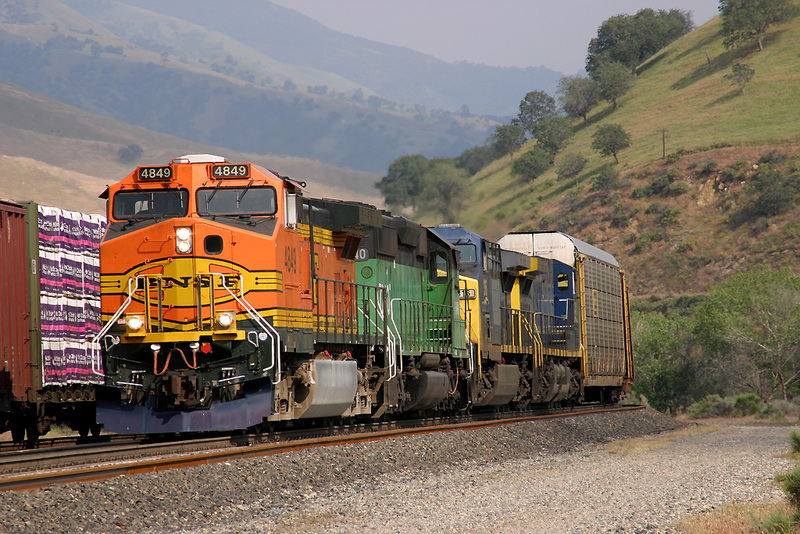 BNSF 5518 BNSF 9824, BNSF 1052, BNSF? 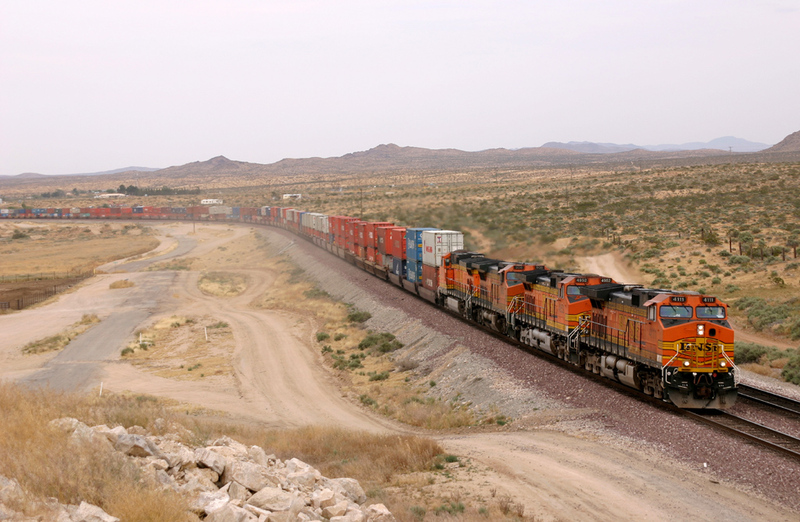 on the approch to Mojave with a South Bound Intermodal. 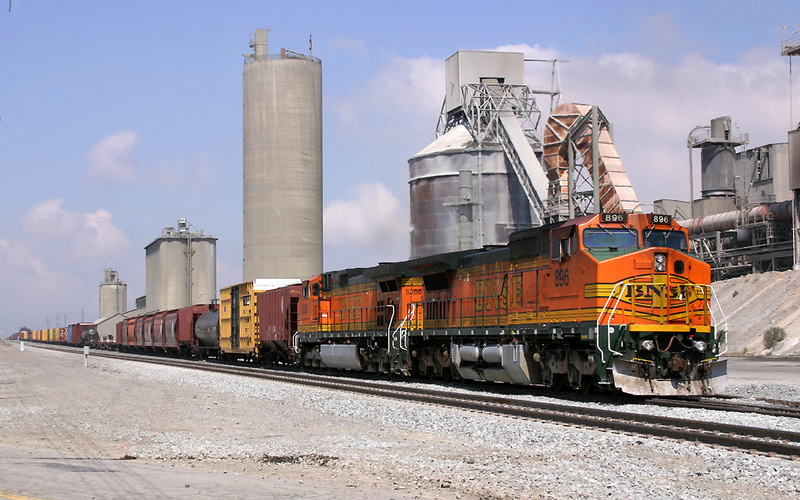 BNSF 5215, SF 6871, BNSF 7671, SF 891 (REAR BNSF 5266, BNSF 896) pass the Monolith Cement Works with a North Bound Manifest. 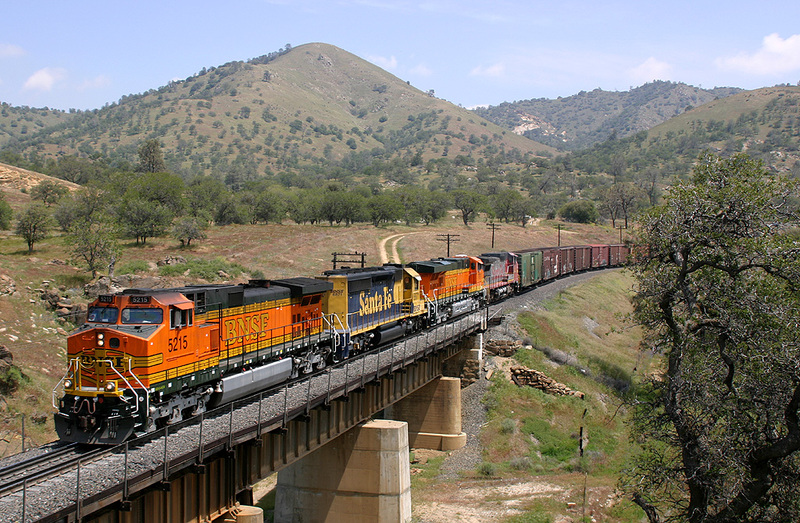 BNSF 5215, SF 6871, BNSF 7671, SF 891 (REAR BNSF 5266, BNSF 896) pass over the Woodford Tressal Bridge with a North Bound Manifest. BNSF896, BNSF5266 helpers tail the previous train through Woodford heading north. UP9414, UP5833, UP5792, UP5808, UP5783 head a northbound manifest over the Woodford Tressal. 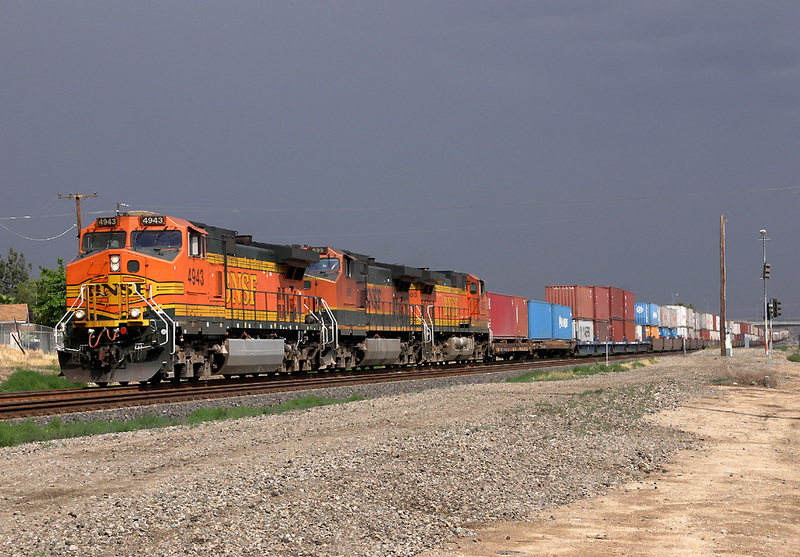 BNSF4097, SF680, BNSF675 lead a northbound Intermodal service through Bealville. 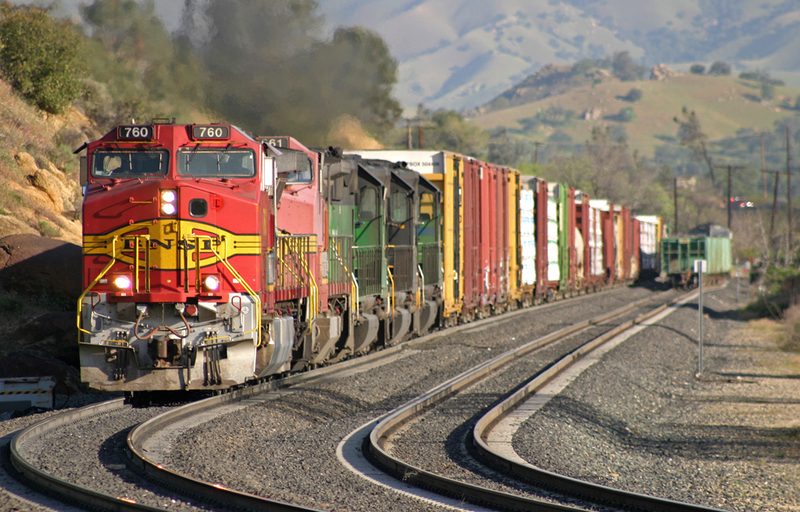 UP5747, UP9338, UP5763, UP4480, UP5709 head a southbound manifest through Bealville. 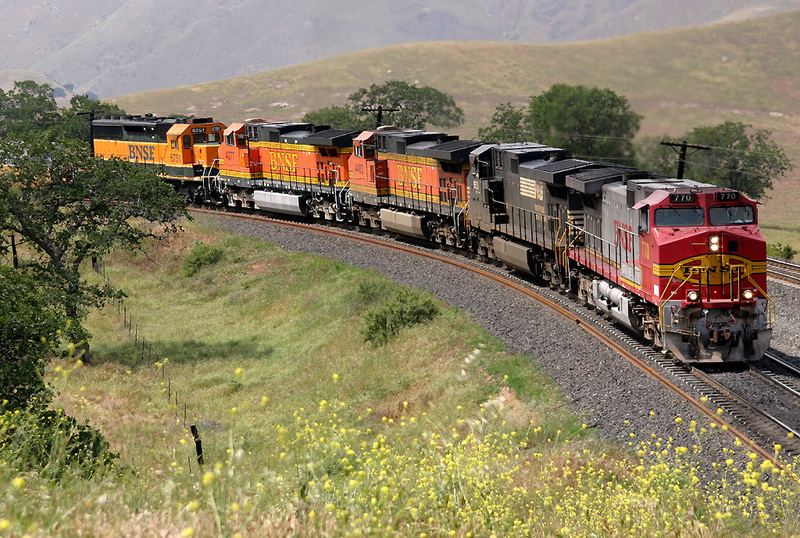 SF770, NS9531, BNSF4483, BNSF4377, BNSF6751 head a southbound Manifest through Bealville. 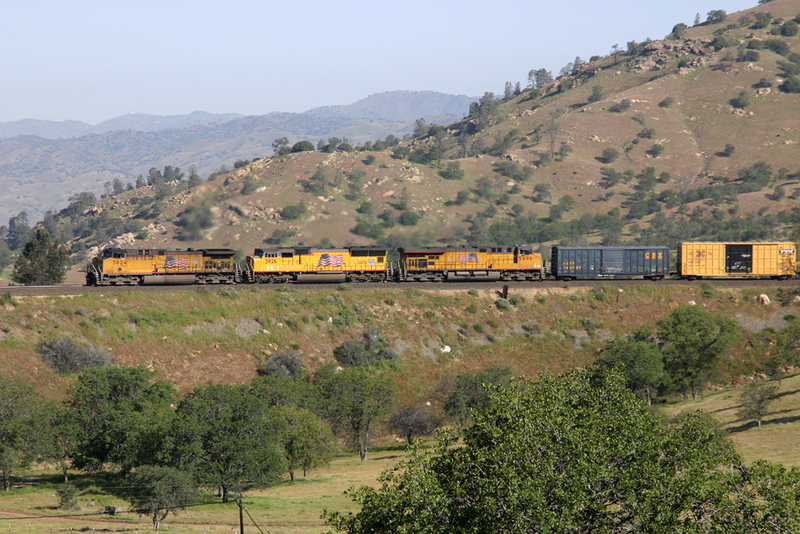 We spent the 2nd May on the Tehachapi mountain range between Mojave and Bakersfield, but due to a 'work window' taken by Union Pacfic to make repairs to the track, we ventured onto the BNSF line to the north of Tehachapi as far as Sandrini, where train after train had been stabled waiting for the mountain pass to reopen. 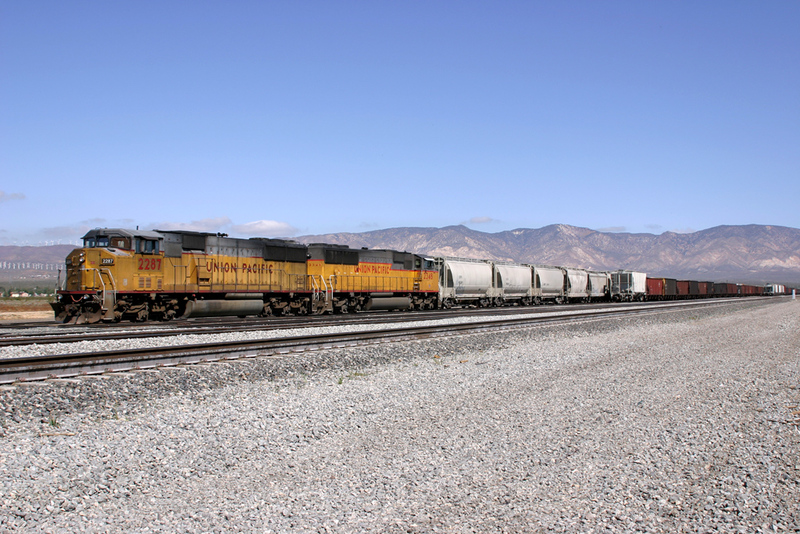 BNSF 4967, BNSF 987, BNSF 7892, BNSF 4040, BNSF 4124, BNSF 4892, BNSF 3118 are seen parked at West Una waiting for onward movement to Bakersfield. 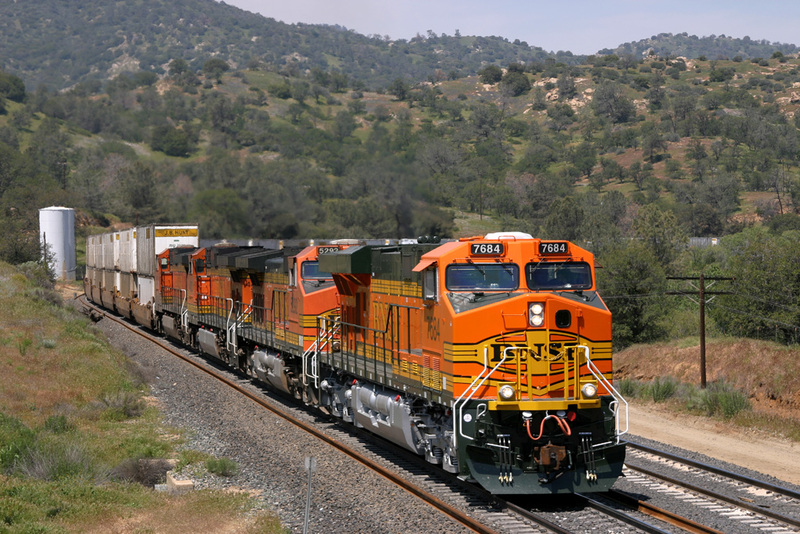 At West Una,BNSF 4967, BNSF 987, BNSF 7892, BNSF 4040, BNSF 4124, BNSF 4892, BNSF 3118 are passed by Amtrack 2014 operating the 06:35 Scaremento - Bakersfield. 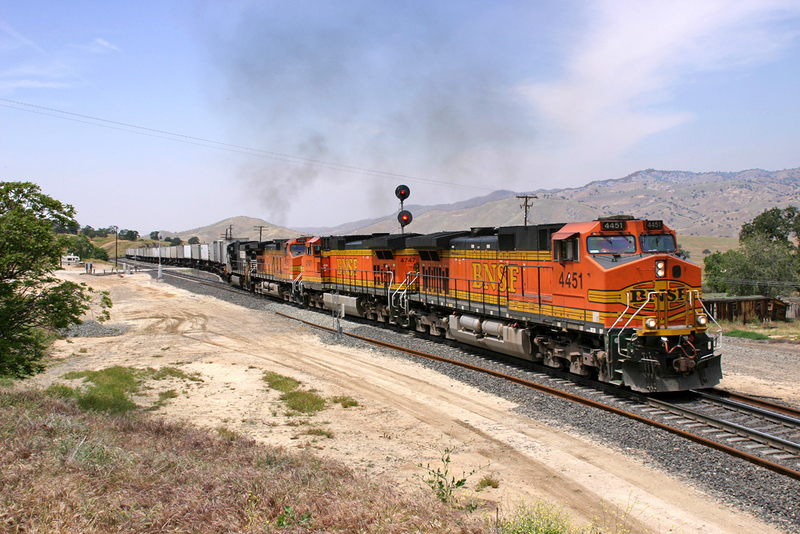 BNSF 4800, BNSF 5357, BNSF 8638 are seen at Sandrini stabled to the North of Bakersfield on the BNSF line awaiting a work window to finish on the switches at Bakersfield. 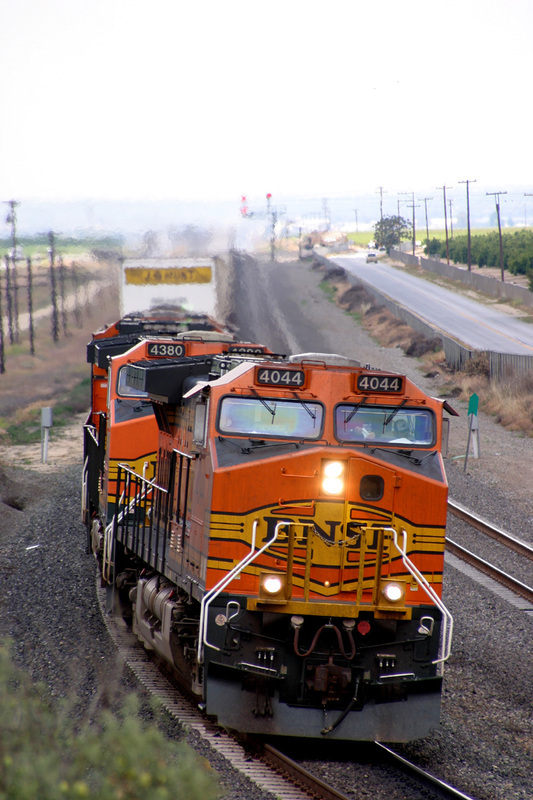 SF521, BNSF514 pass through Wasco with a baretable train heading for Long Beach. 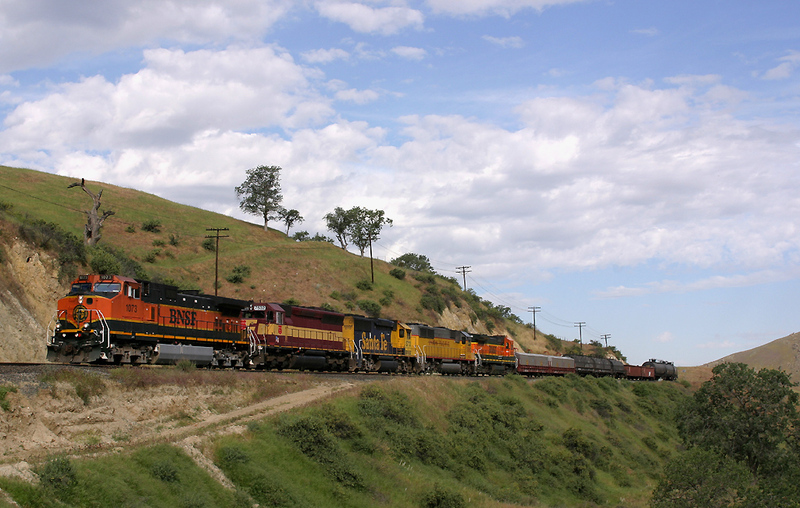 BNSF 4849, BNSF 7240, CSX 316, CSX 473 round the curve at Caliente heading North on a Manifest. 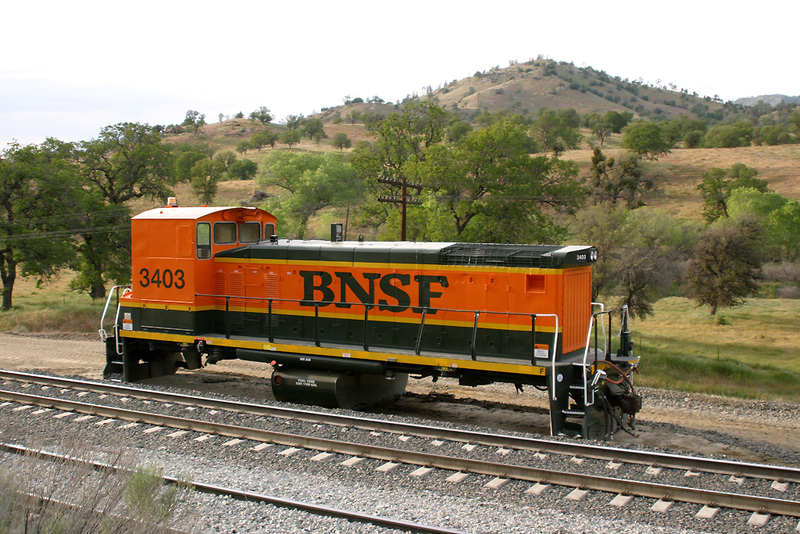 Note the blue cow catcher on the front of BNSF 4849. 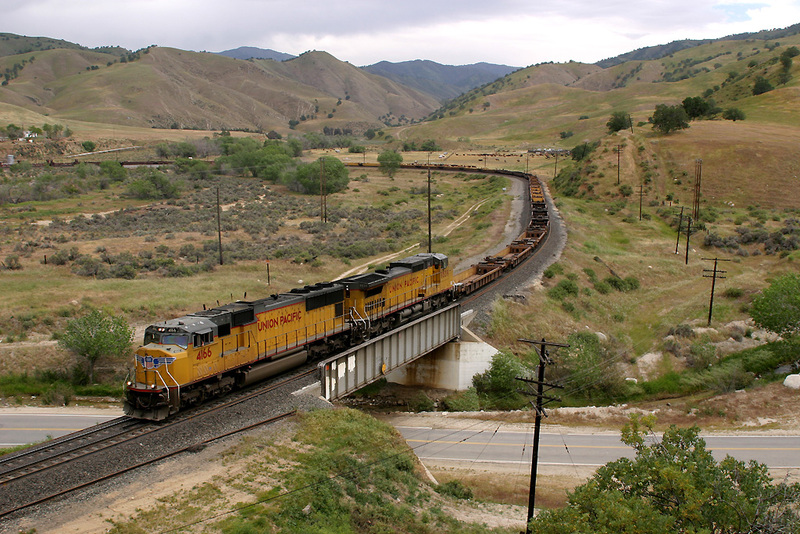 BNSF 5393, BNSF 815, BNSF 6729, BNSF 1091 enter Tunnel 2, in a shot that really does show the length of the trains that run through the Mountain pass! 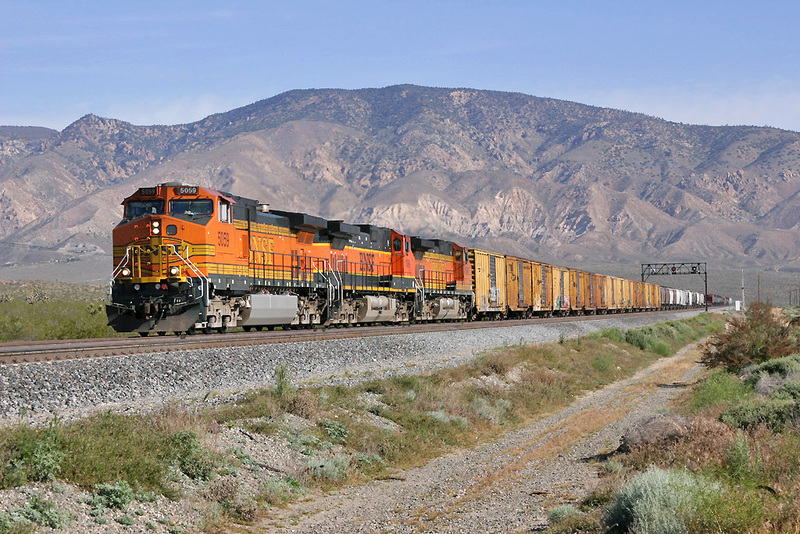 BNSF5348, BNSF1012, BNSF4311 pass through Illman Caliente Creek with a south bound Intermodal in tow. 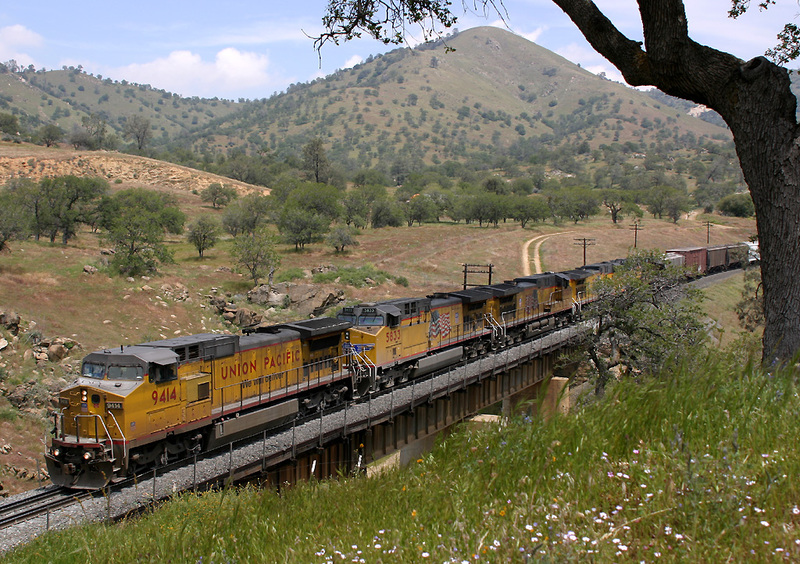 The 3rd May was out final full day on the Tehachapi Mountain Range, it provided cloudless skies a couple of brand new locomotives and a good level of freights moving over the pass. 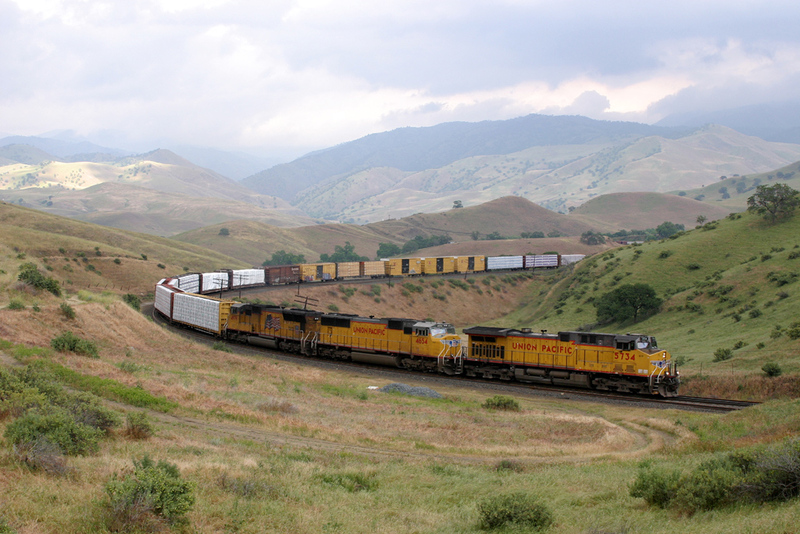 UP 9720, UP 9397 round the loop at Walong (Otherwise known at The Tehachapi Loop) with their south bound Intermodal. Another Brand New ES44DC sits at Caliente waiting for the BNSF Managers Train to pass by: BNSF 7684, BNSF 5292, BNSF 4482, BNSF 5331. 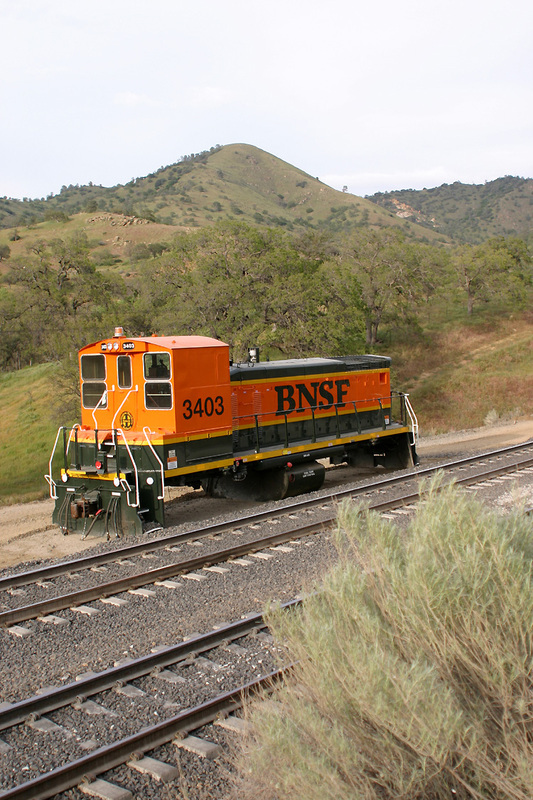 A surprise during the morning period was the appearance of the BNSF Managers Train working over the mountain, it's seen coming out of Marcel heading North towards Bakersfield. 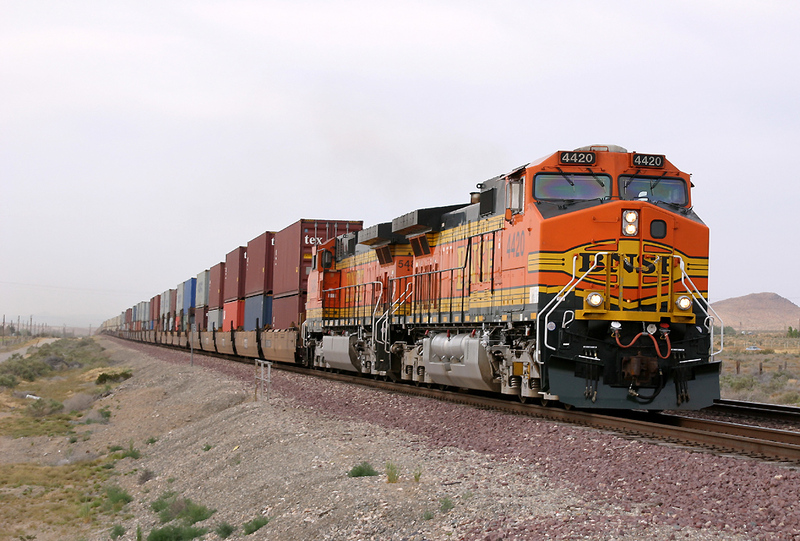 The train was being operated for 'shippers' who use BNSF as a haulier. 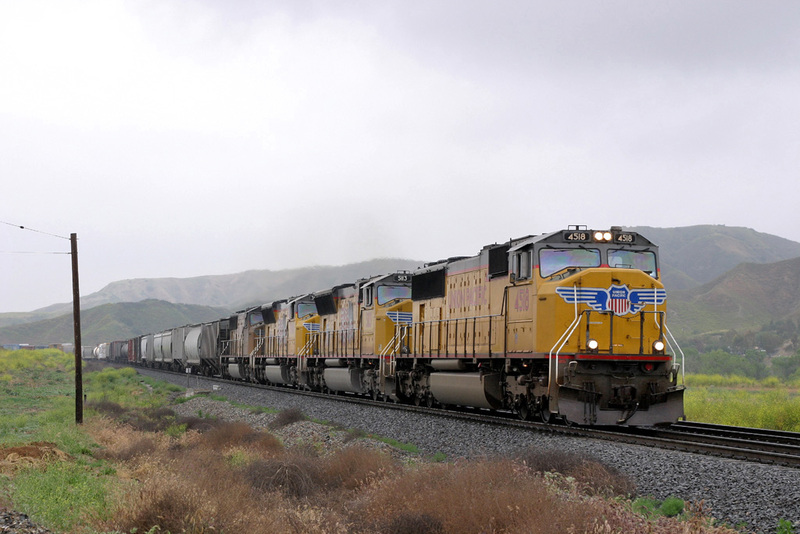 The train was operated from Barstow Intermodal Terminal to Swanson (close to Modesto in Northern California). 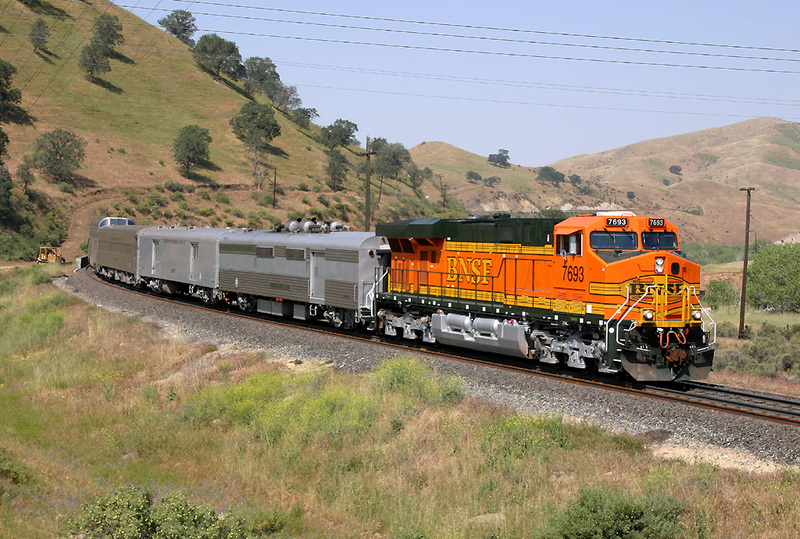 A brand new ES44 DC was provided by BNSF No.7693. 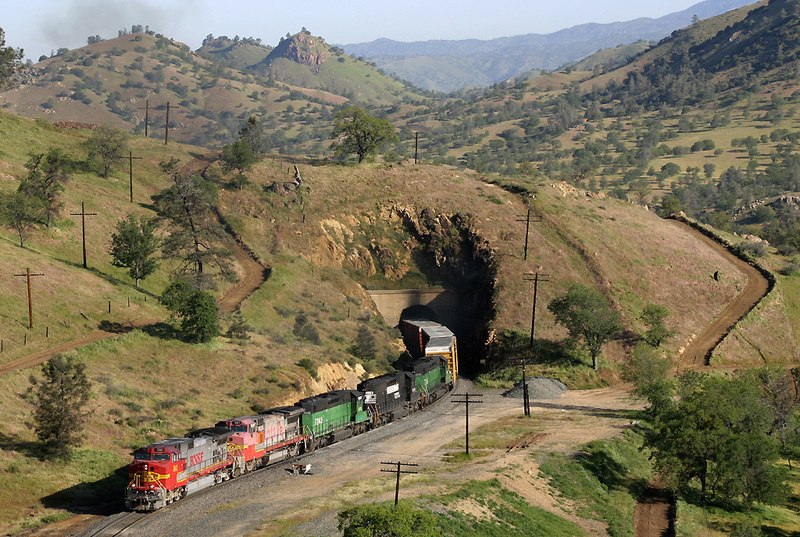 BNSF 7684, BNSF 5292, BNSF 4482, BNSF 5331 enter Tunnel 3 having worked up from Caliente and through Bealville heading south over the mountain. 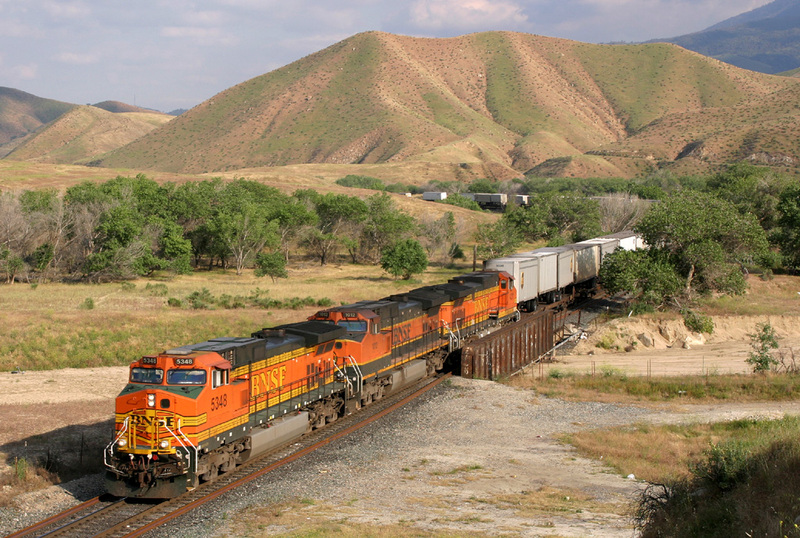 BNSF 7684, BNSF 5292, BNSF 4482, BNSF 5331 pass through Woodford Loops heading for Walong. UP 3862, UP 4017 come to a stand at Woodford on a rake of 'Bare Tables' heading south to Long Beach ready for Monday morning. 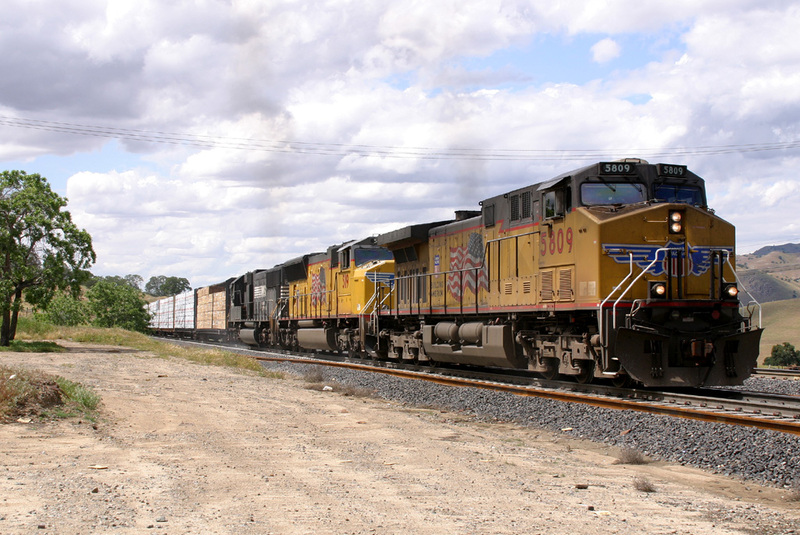 UP5775, UP2945, UP4680 pause at Woodford Loops while working a Roseville - Colton Junction manifest. 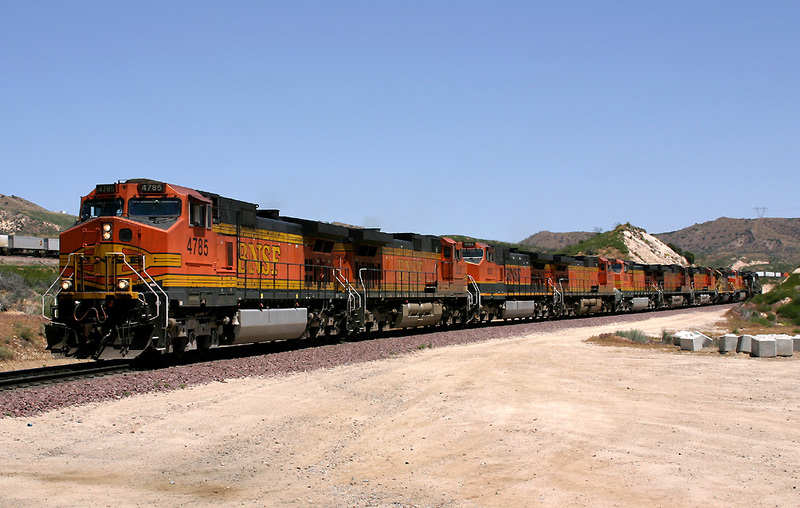 BNSF4451, BNSF4747, BNSF4125. NS9351 depart from Bealville Loop having been regulated for other services to pass. 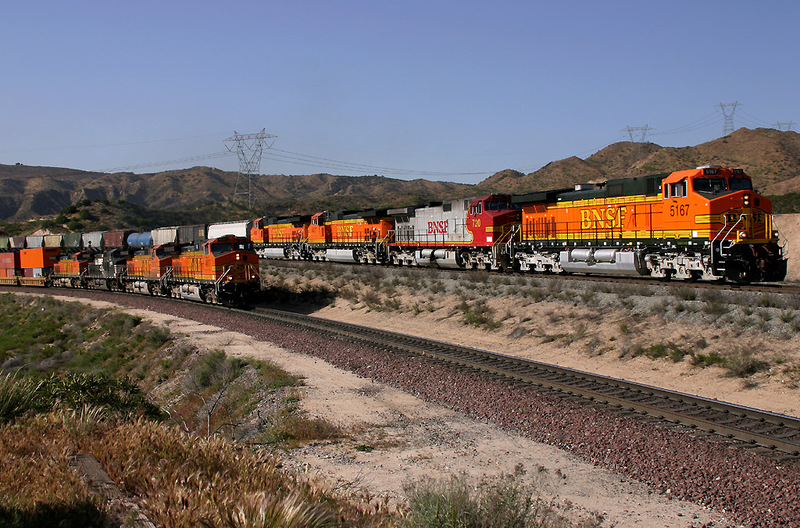 BNSF5280, BNSF5034, BNSF1089, SF608, BNSF4773, SF2408 start the climb from Caliente to Tunnel 2 with a south bound manifest. 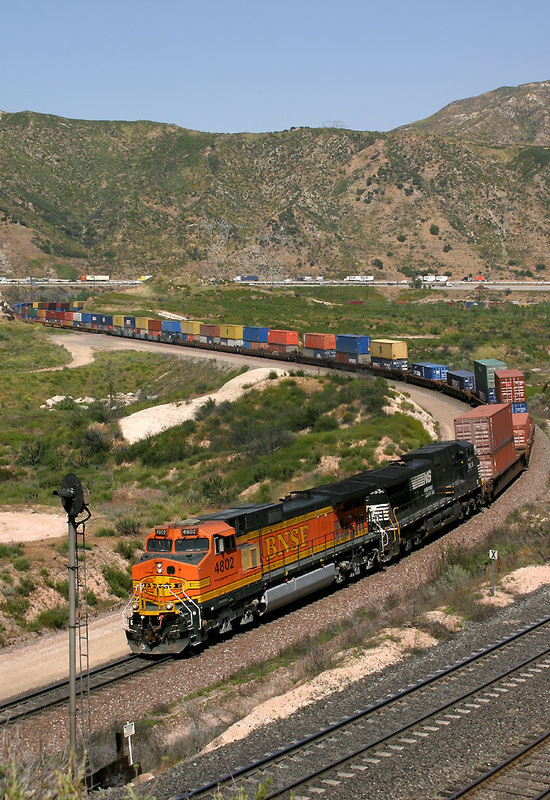 BNSF1043, SF6932, BN7024, SF6348 head into Caliente with a south bound manifest. 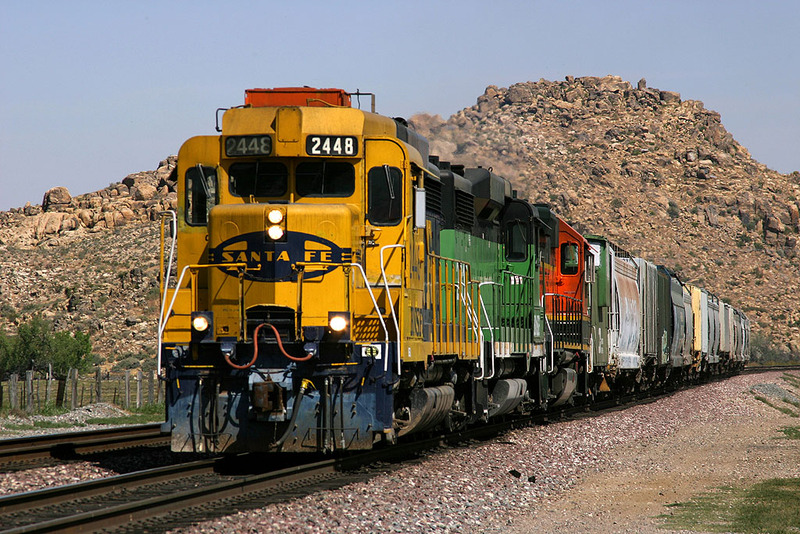 On the 4th May we drove to Mojave before following the BNSF tracks to Barstow before heading returning via Helendale. 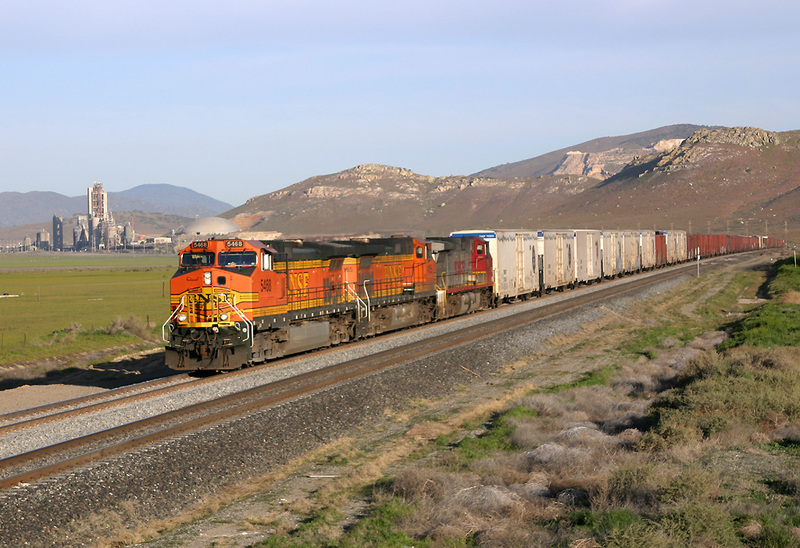 BNSF5059, BNSF1099, BNSF4596 arrive into Majave with a south bound manifast. 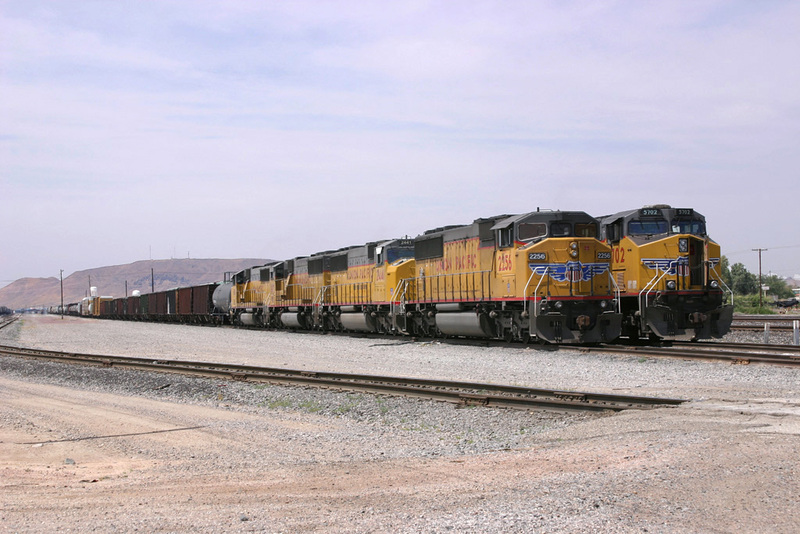 UP2930, UP2690 are pictured stabled in Mojave Yard. 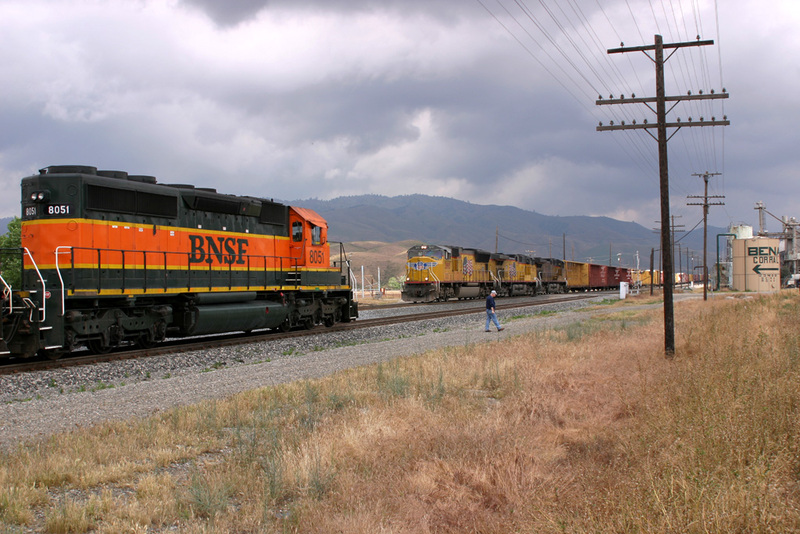 BNSF5059, BNSF1099, BNSF4596 storm through Boron heading east with their manifest in tow. 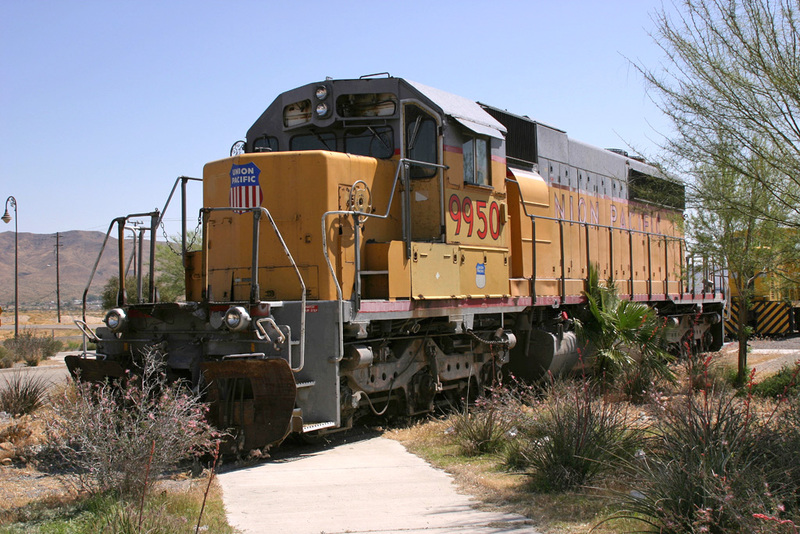 UP9950 is seen preserved at the Barstow Railroad Museum. 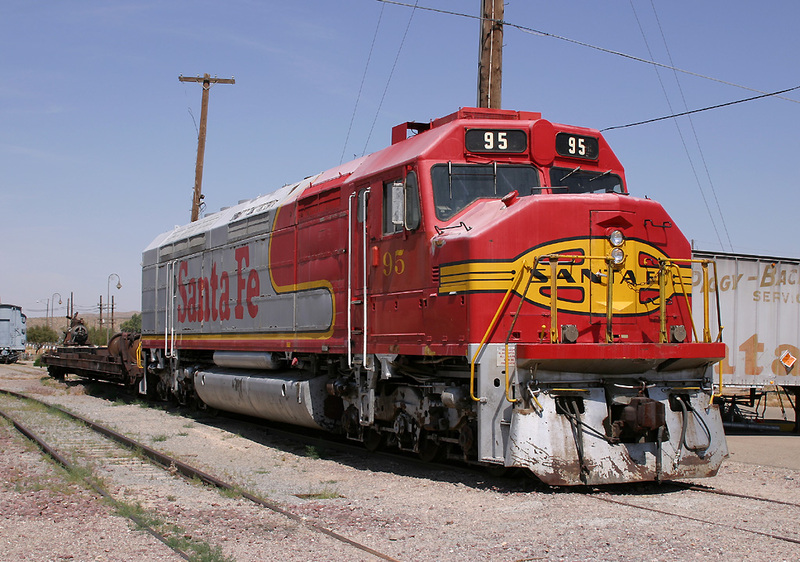 SF95 is seen preserved at the Barstow Railroad Museum. 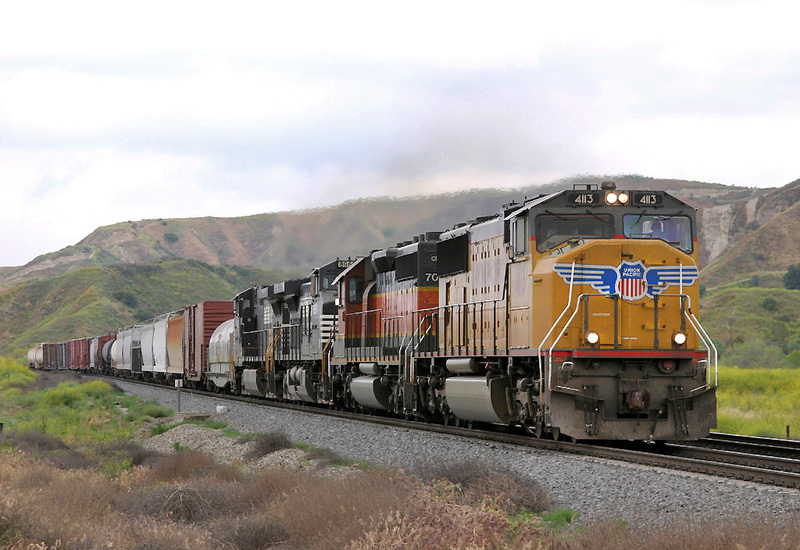 UP5094, UP2498 pass Dagget with a ballast train heading for Yermo from Barstow. 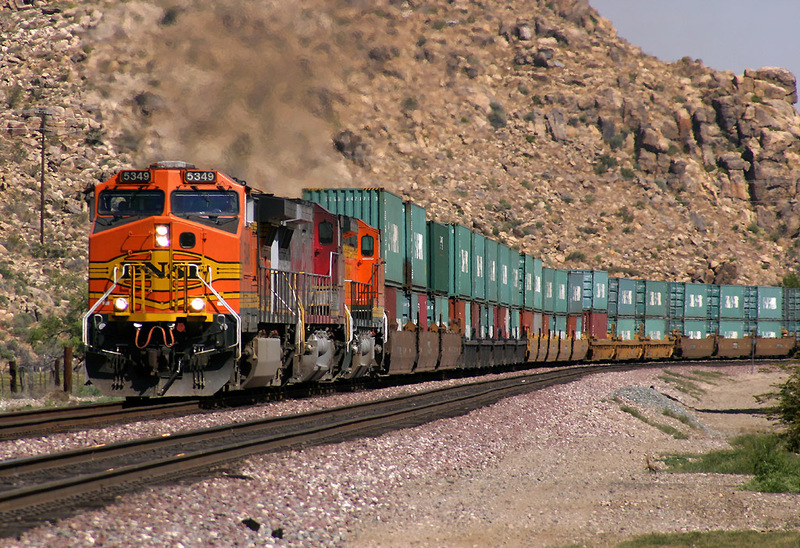 BNSF4968, BNSF4953, BNSF5367, BNSF5477, BNSF715 pass Dagget at speed heading east with a 'Z' Intermodal. 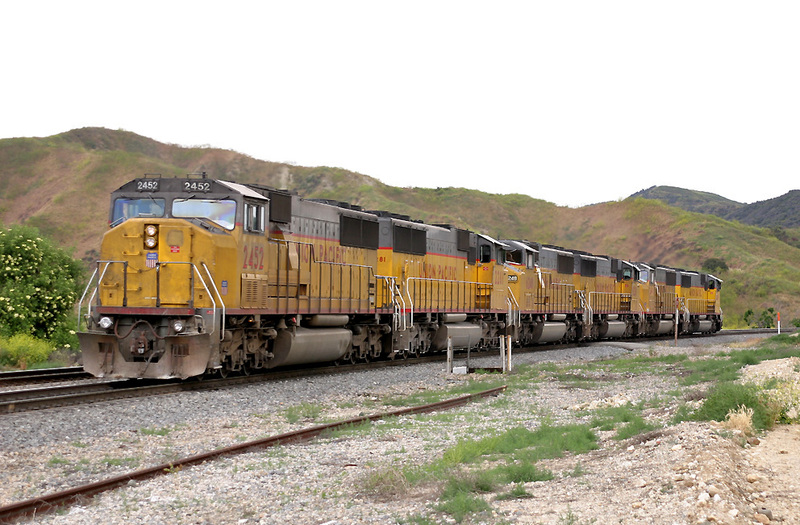 UP2256, UP2441, UP2477, UP6188 stand in Yermo Yard while adjacent UP5702 stands on an east bound Manifest. 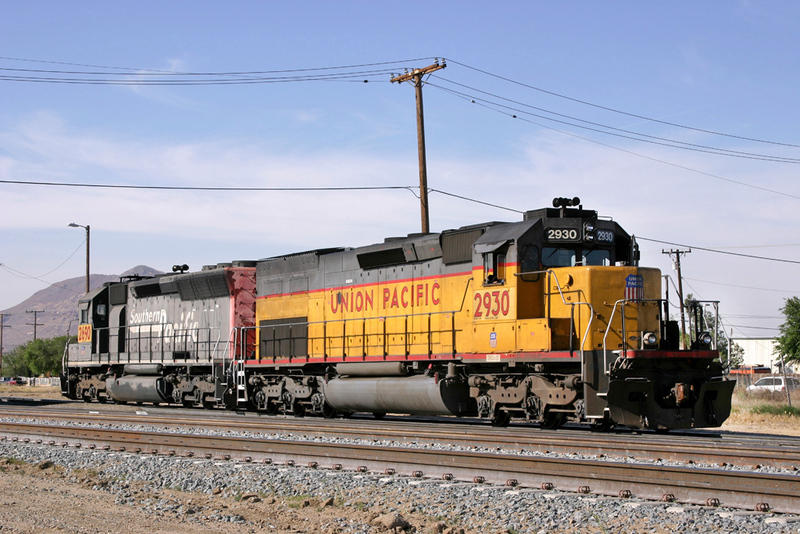 UP2387, UP4294, UP9844 stand at the entrance to Yermo Yard on a rake of west bound Autoracks. 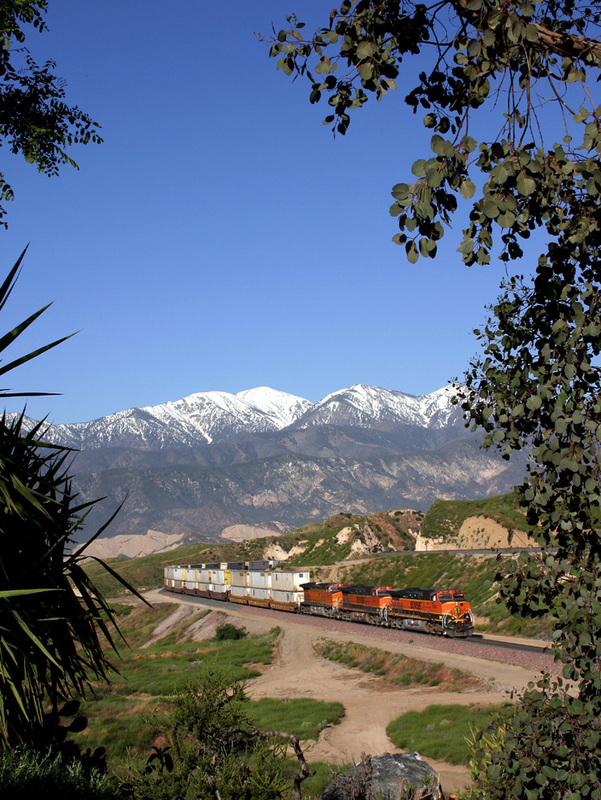 BNSF4672, BNSF4366, NS8938, BNSF7312, NS8681, NS8909 head east bound through the Indian Trail Road at Helendale. 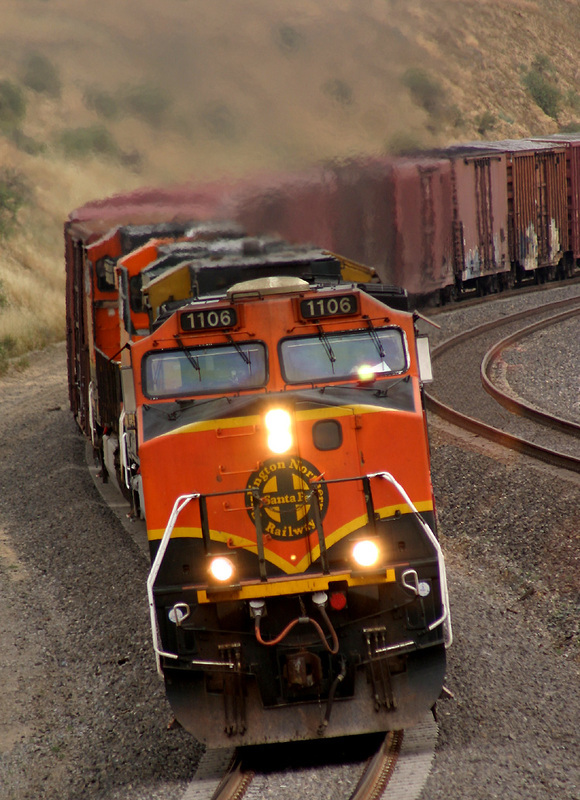 BNSF4111, BNSF4952, BNSF906, BNSF4178 head a west bound stack train through the Indian Trail Road at Helendale. 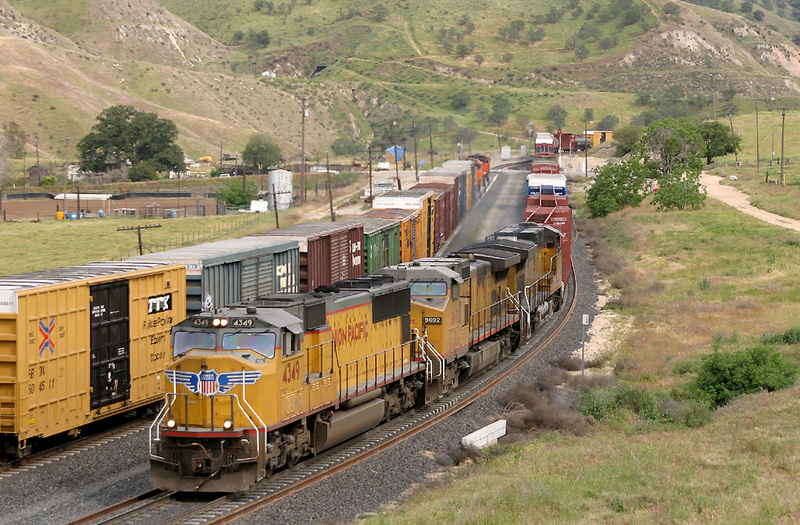 BNSF4731, BN7851, MRL322, NREX5080, NREX5453 haul a west bound stack train through the Indian Trail Road at Helendale. 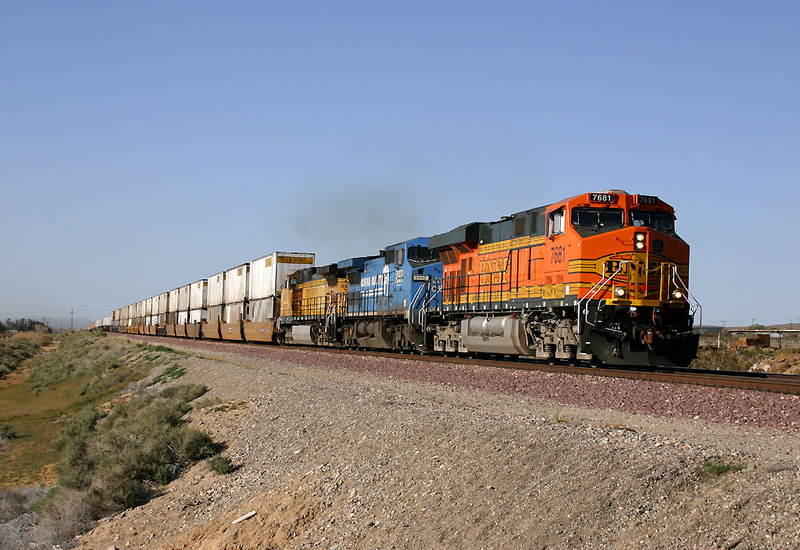 BNSF4420, BNSF5489 pass through Turner Road with a west bound stack train. 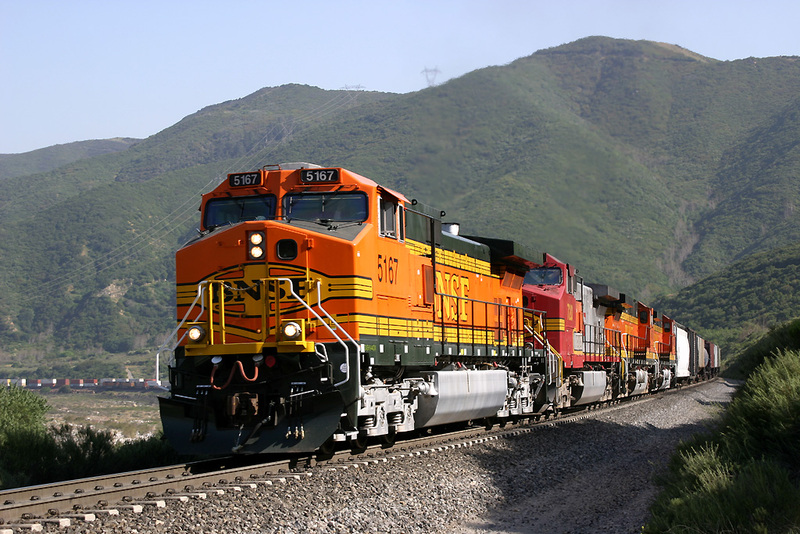 NS9616, NS9442, BNSF5384 power through Turner Road with a west bound stack train. The 5th May was our final day in California, upon returning to Los Angeles we called off at Hinda and El Casco before returning to LAX for our flight home. 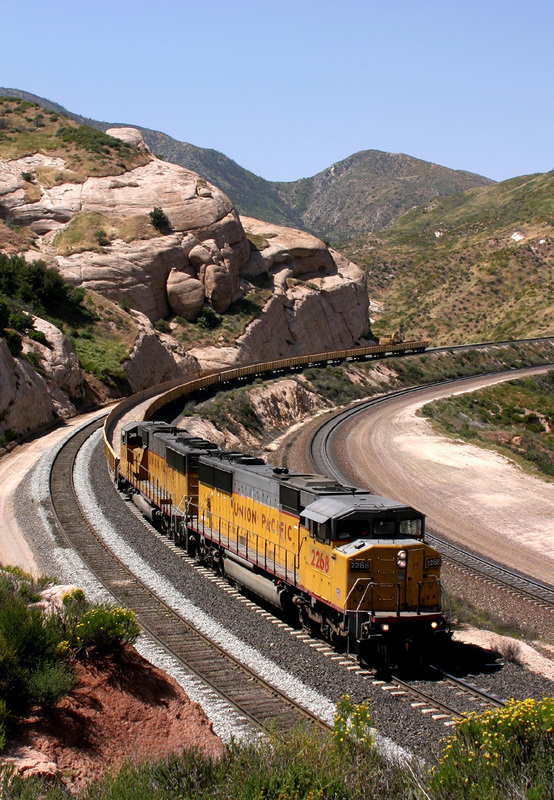 UP4518, UP5116, UP3906, UP4569 pass El Casco with an east bound Manifest. UP2462, SP2760, UP3160 pass El Casco with an west bound manifest. 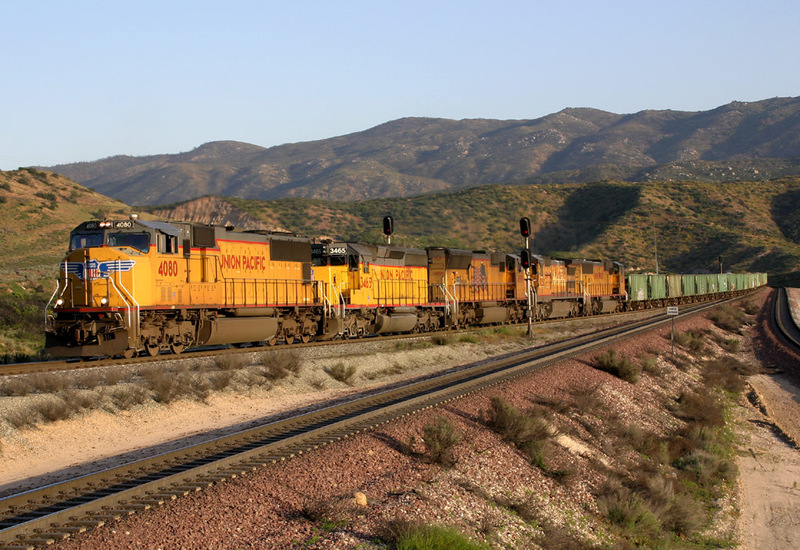 UP4113, CEFX7088, NS8968, NS9613 pass El Casco with an east bound manifest. UP4472, UP3987, UP1808 pass El Casco with an east bound manifest. 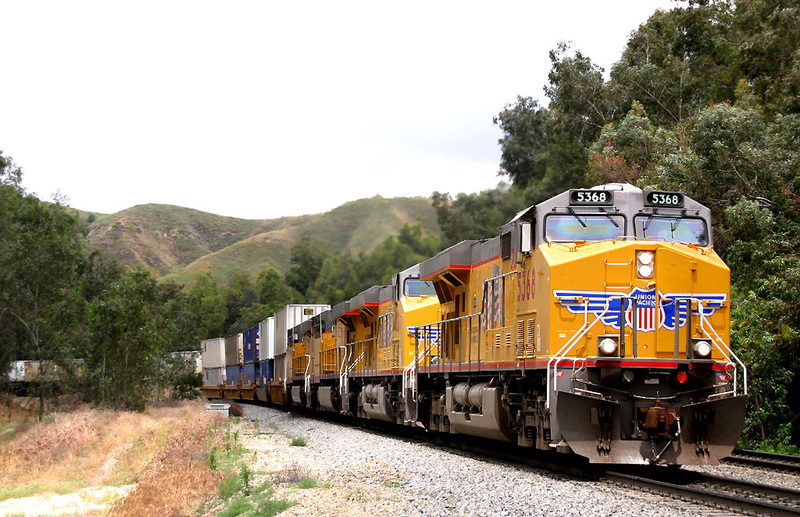 UP2437, UP2491, UP6238, UP6248, UP2281, UP2452 pass east bound through El Casco with a light power move. 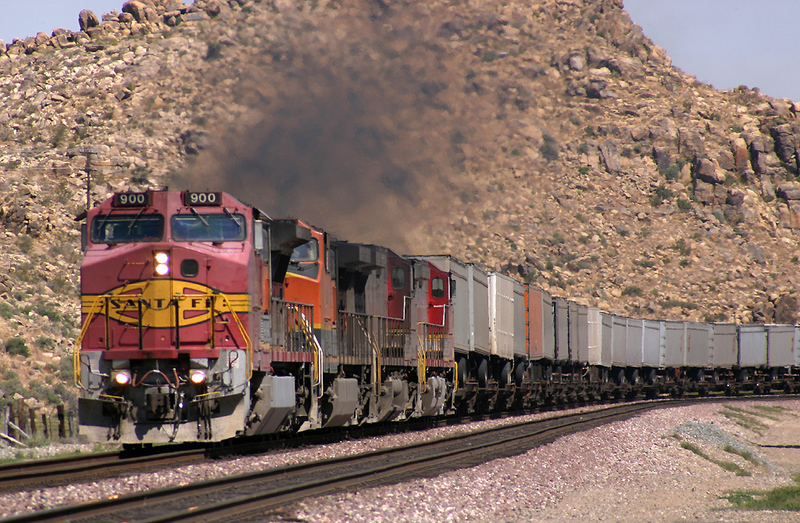 UP5368, UP5402, UP5363 UP5391 round the tight curve at El Casco with an east bound stack train. UP4078, UP2254. 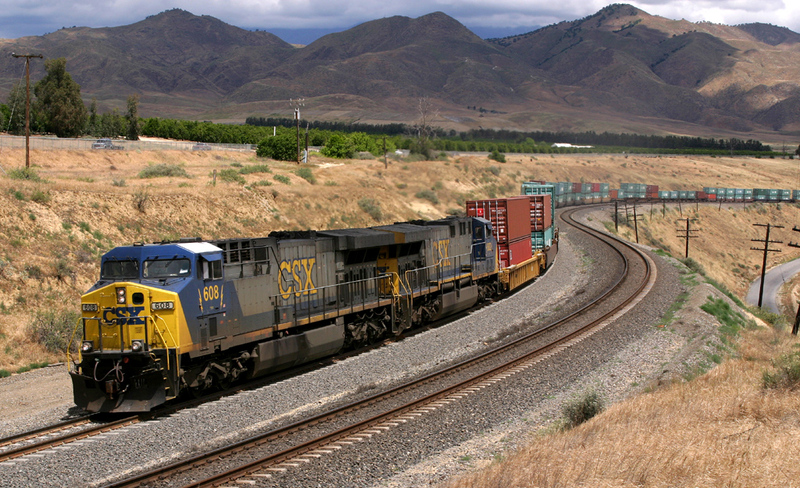 CSX7905 pass through El Casco with an east bound stack train. 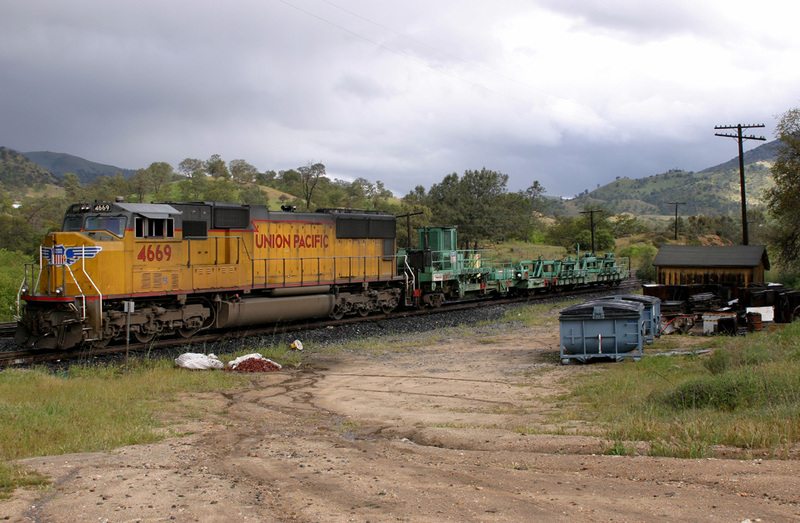 UP4914, UP5008, UP4482, UP9590 pass through Hinder with an west bound autorack.